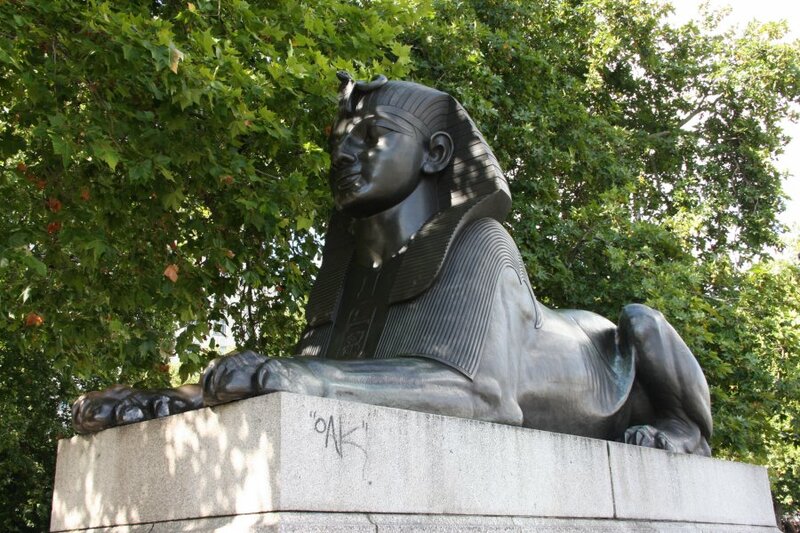 London and the World's oldest zoo. 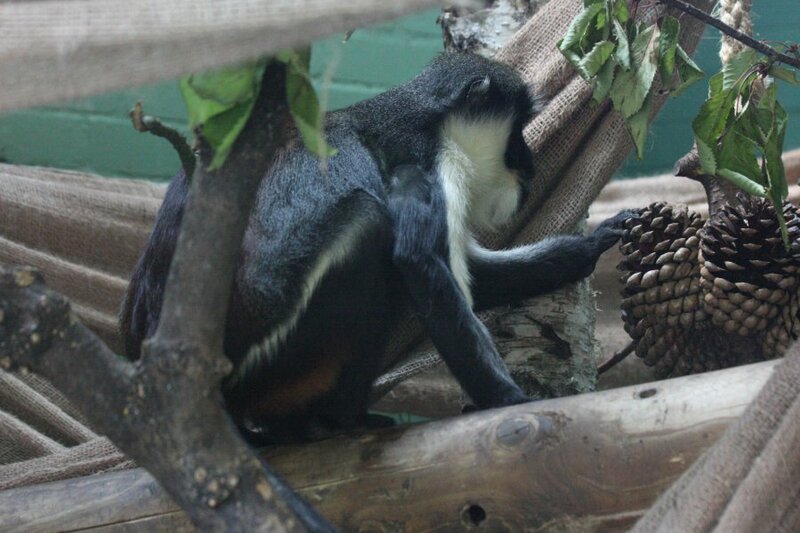 The primary purpose of this visit to London was for a behind-the-scenes tour of London Zoo. 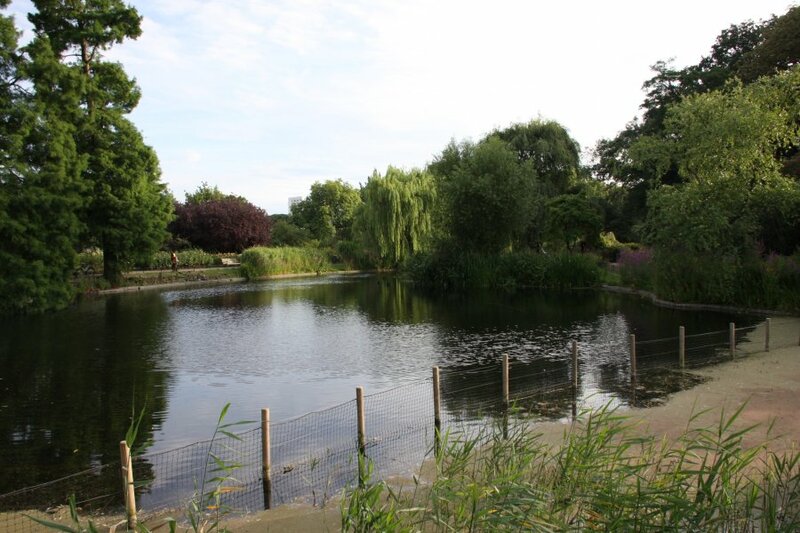 Renowned as the oldest zoo (for scientific purposes rather than a menagerie for aesthetic or entertainment purposes) in the World, it opened in 1828, and later allowed public visits from 1857. 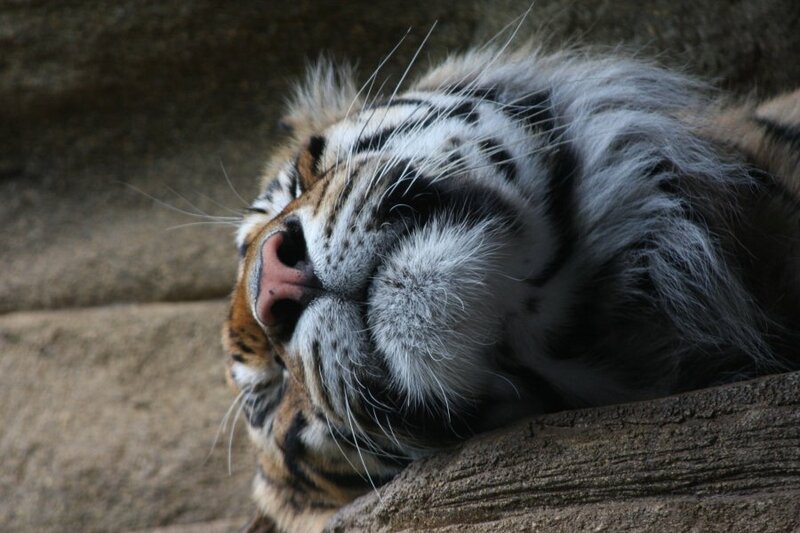 As with most reputable major zoos, its main purpose now is to aid in global conseration efforts, preserving endangered species, taking part in their breeding programmes, and educating the public about the needs of these animals. The public viewing part also helps to fund the more serious work behind the scenes. 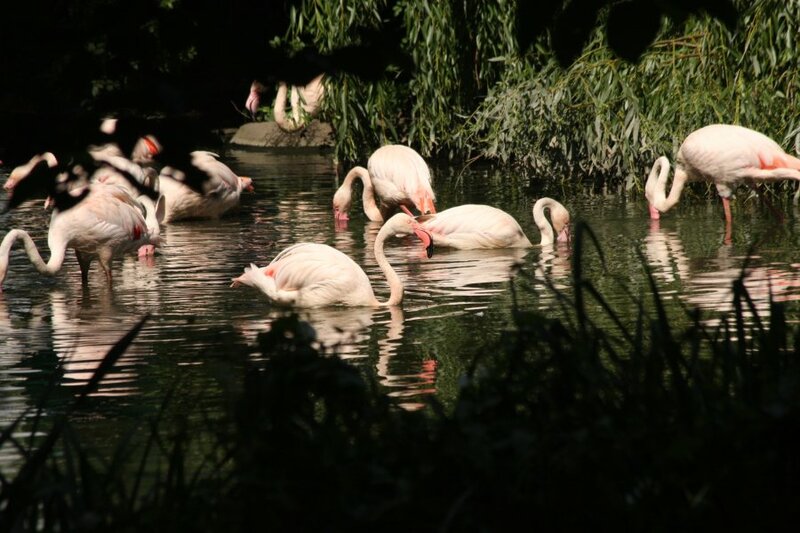 With over 750 species and well over 17'000 animals at London Zoo, this will be a fairly large gallery, though it will only show a small fraction of their collection. Non-zoo pictures of London are towards the end of the gallery. 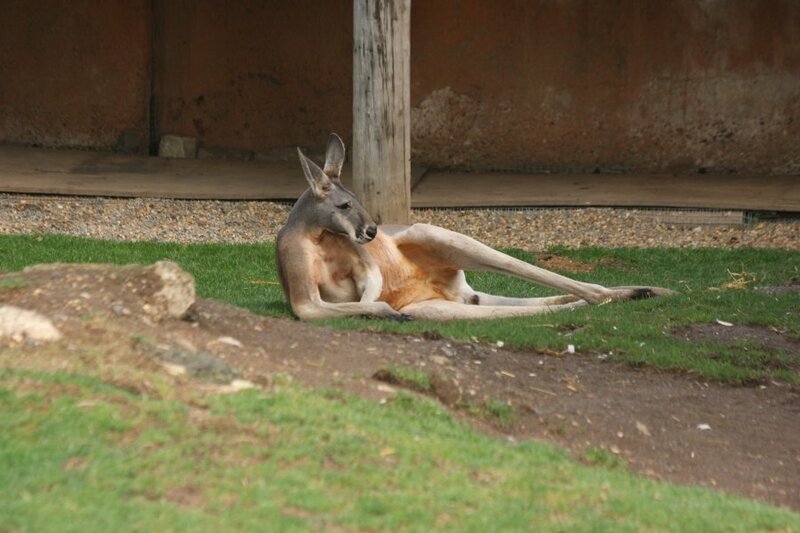 Starting in Australia; male red kangaroo lazing away the day. 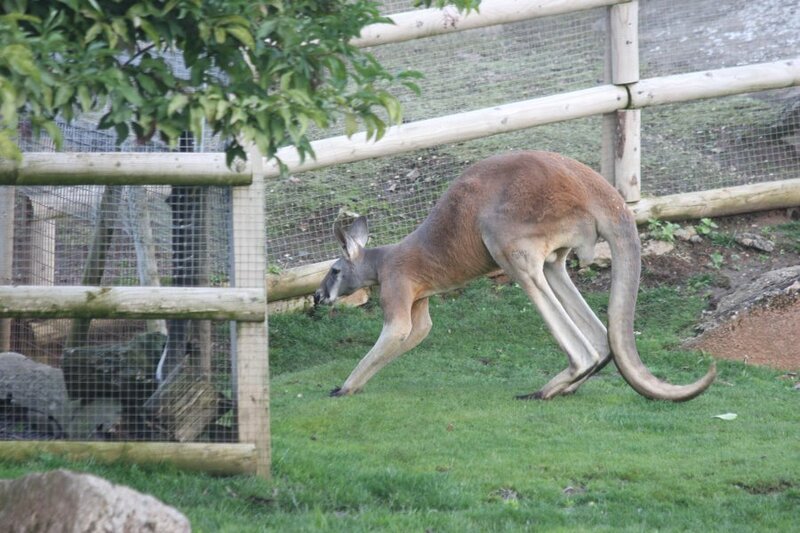 These are incredibly powerful and muscular animals, similar to body builders, and are the largest of the kangaroos. Their jumping (up to 9 metres horizontal and 3 metres vertical) is powered by the large, elasticated Achilles tendon. This gives them a top speed of 70 KPH (44 MPH), or 40 KPH (25 MPH) over long distances. And no, you can't ride in their pouches, because that's a male. 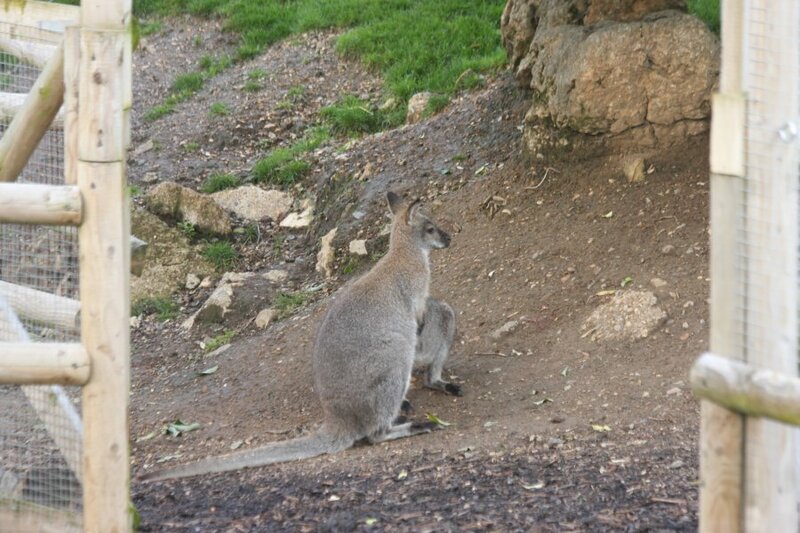 Bennett's wallaby. This actually looks very similar to a female red kangaroo, but the red kangaroo females have a red tint on the tail instead of the shoulders. Over to Asia; bactrian camel with its double hump. 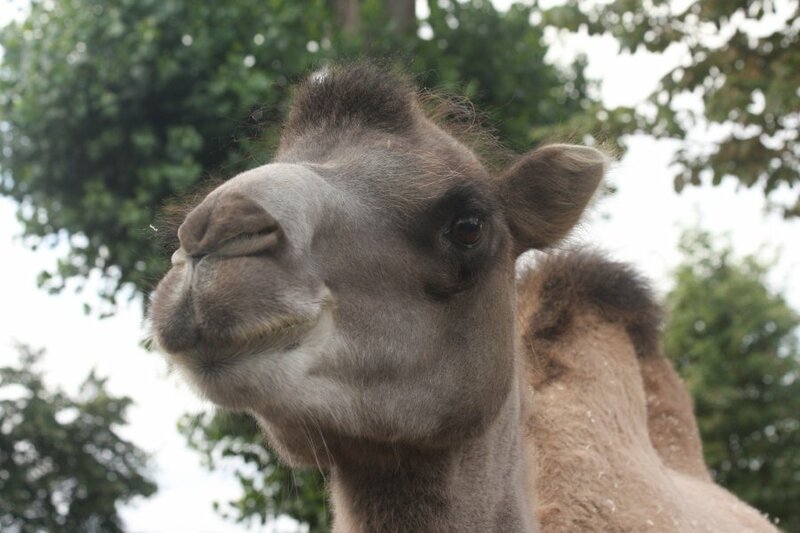 For some reason almost all our zoos have these, but very few have the single humped dromedaries, presumably because of the incredible ability of the bactrian to adampt to almost any climate, including the cold temperatures of the UK. Asian short-clawed (or small-clawed) otters. 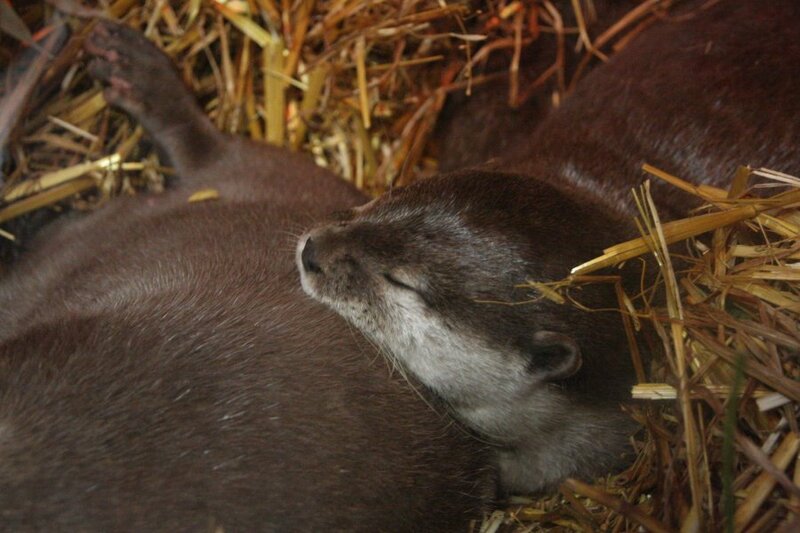 Asian short-clawed otters are the normal one seen in our zoos, due to them being relatively active during the day. Nobody told these ones though. 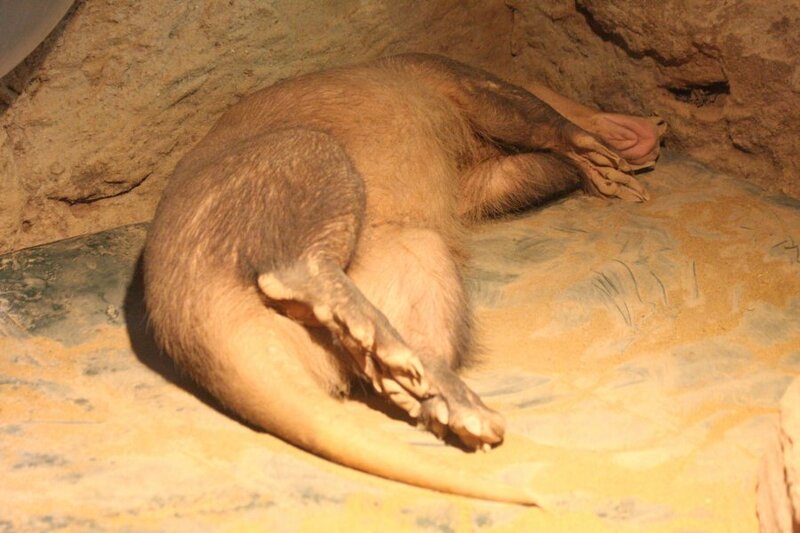 Moving into Africa; aardvark, an animal whose only reason for existence is to sit at the start of the alphabet, eating the ants that take second place. Being nocturnal, they don't make a great zoo exhibit unless the zoo gives them artificial sunlight at night and a dark day. 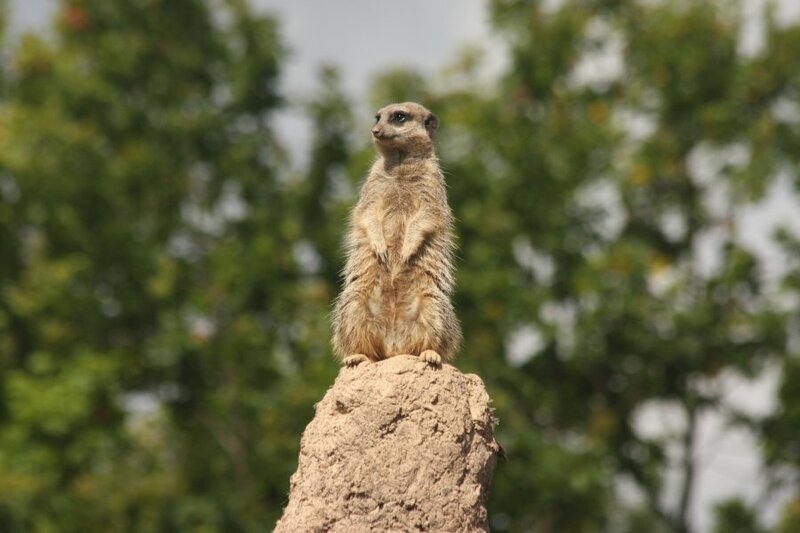 Meerkat in classic sentry pose. These are rather too common in zoos, but they have to draw in the visitors somehow, and the quirky meerkats always put on a great display for the camera. 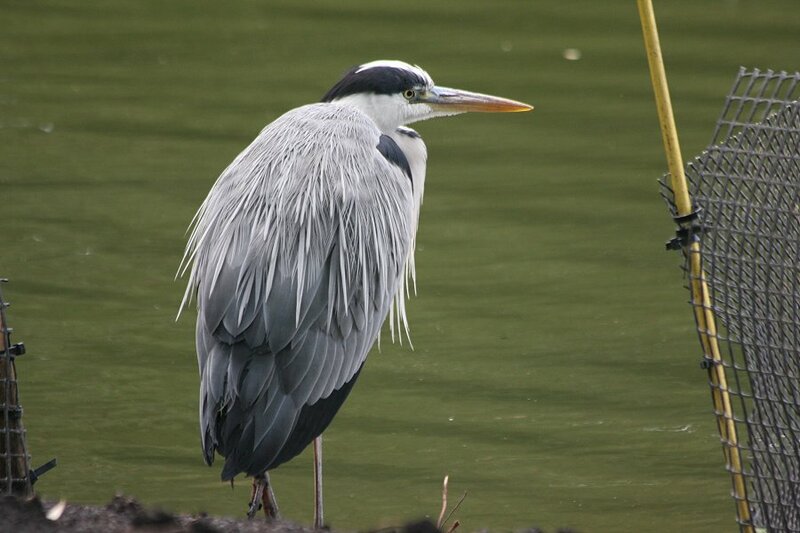 This one was busy watching out for the birds, ready to warn the clan when a predator or aeroplane appeared. North into Europe; a mouse. 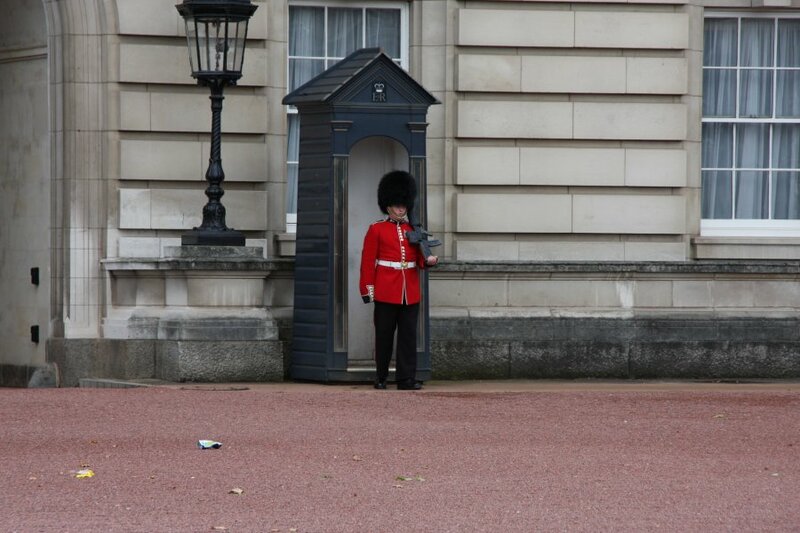 Not a zoo exhibit, but a British native that has decided to make use of the facilities. 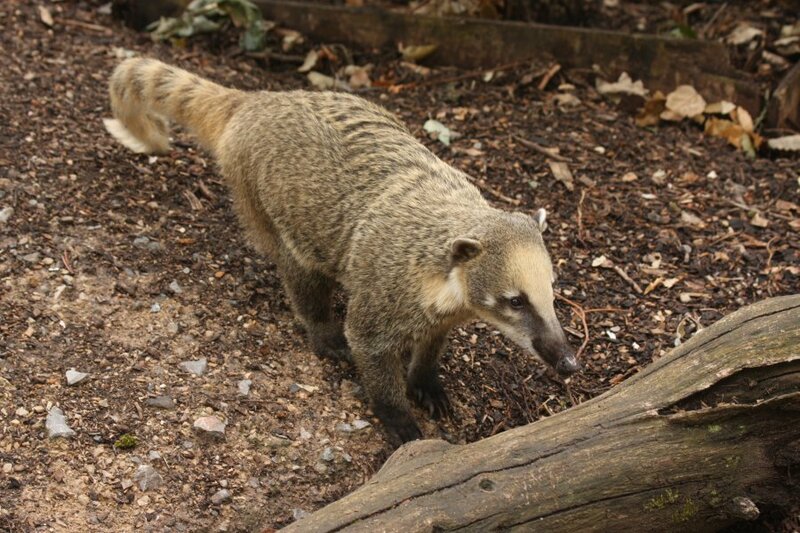 Crossing the Atlantic into South America; South American coati, a relative of the raccoon from the Amazon rainforest. The males are larger, and are called coatimundi, but they are the same species. They naturally live in all-female groups or as solitary males, and were therefore mistakenly thought to be different species, and given different names. 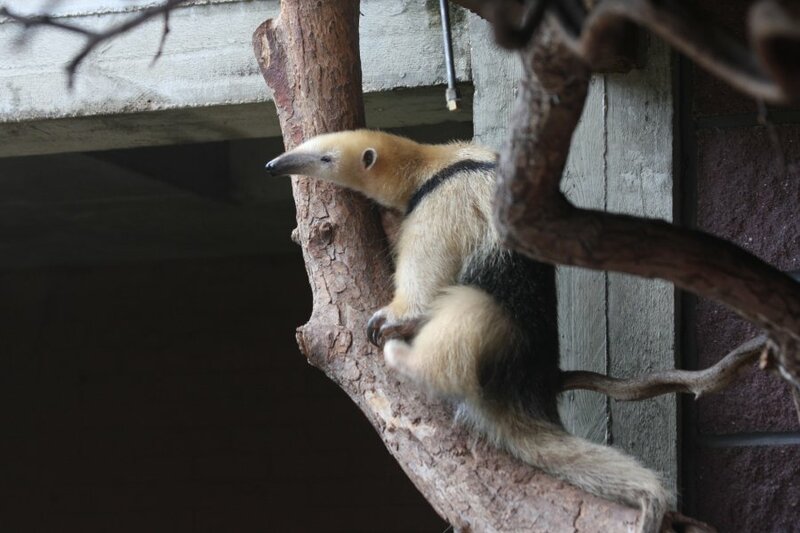 Southern tamandua, one of the many types of anteater. 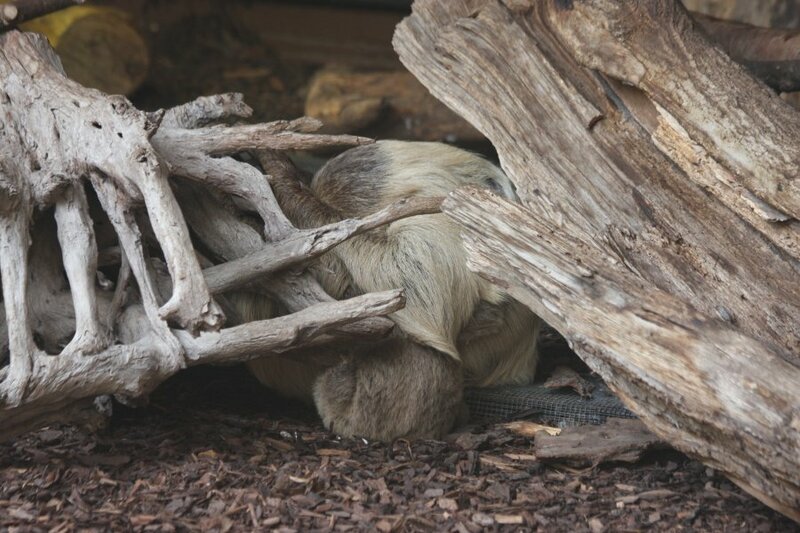 Two-toed sloth pretending to be a tree. 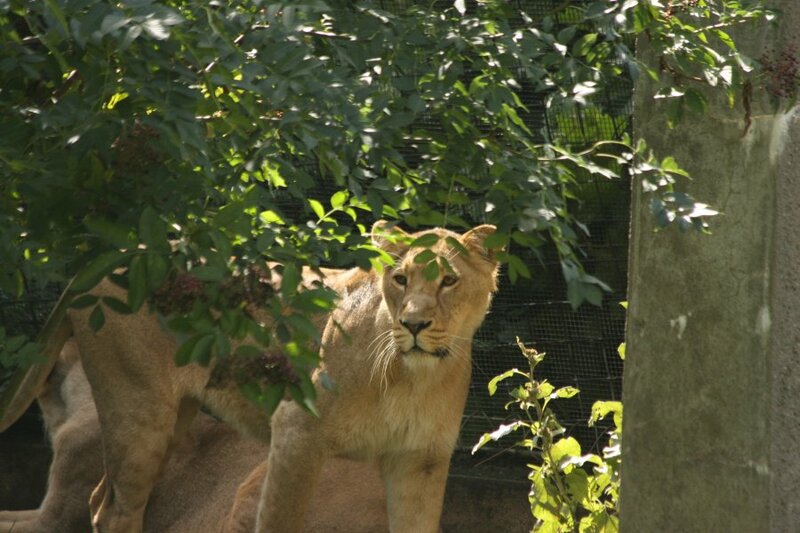 Cats of Asia; lioness. She appears to be an Asiatic lion rather than an African lion (after all, with only one day here, we didn't have time to see the African exhibit). 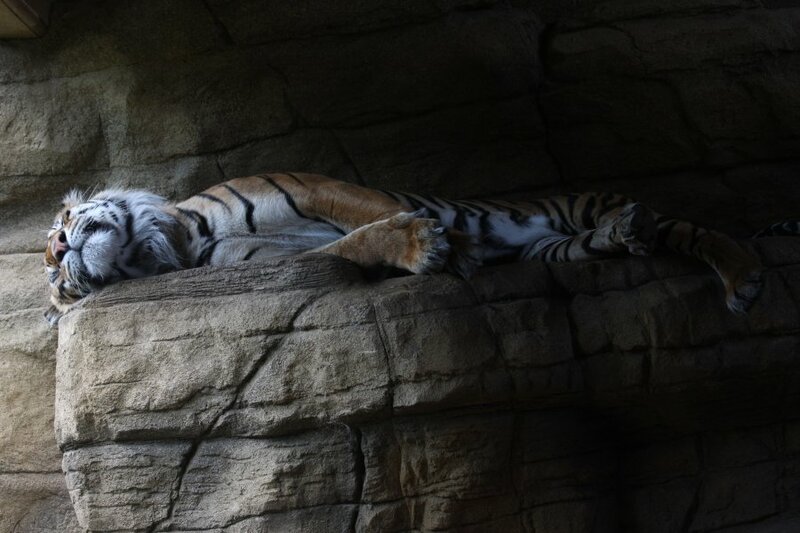 Tiger on the beautifully made artificial rockery. 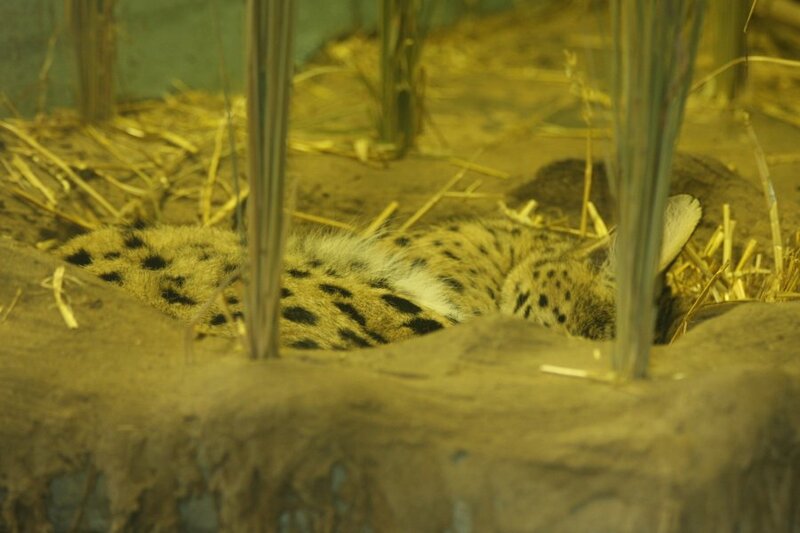 Cats of Africa; cheetahs may be the fastest land animal, but they are still a cat, and spend most of their time resting or sleeping. 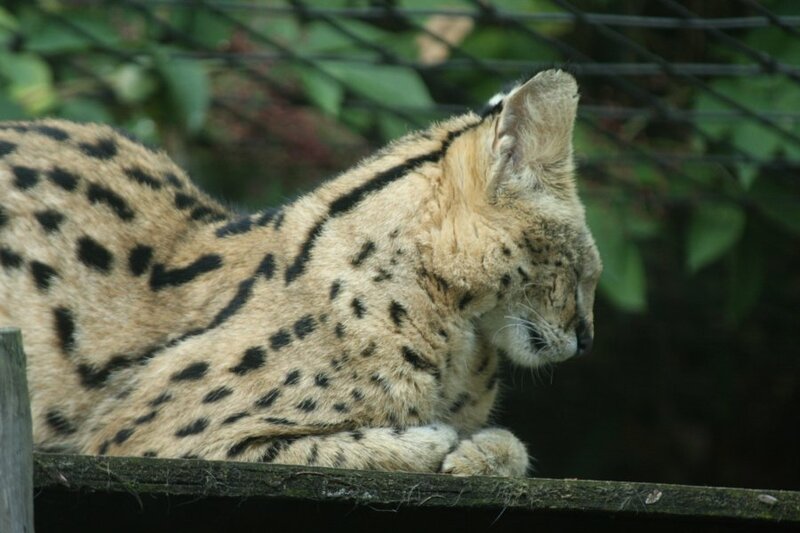 Serval, a smaller wild cat. Stripes like a tiger, spots like a cheetah. 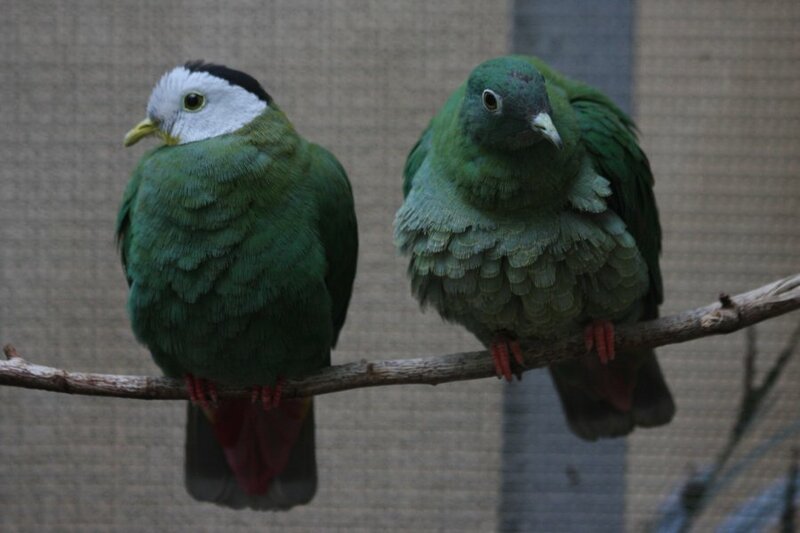 Birds of southeast Asia; black-naped fruit dove. 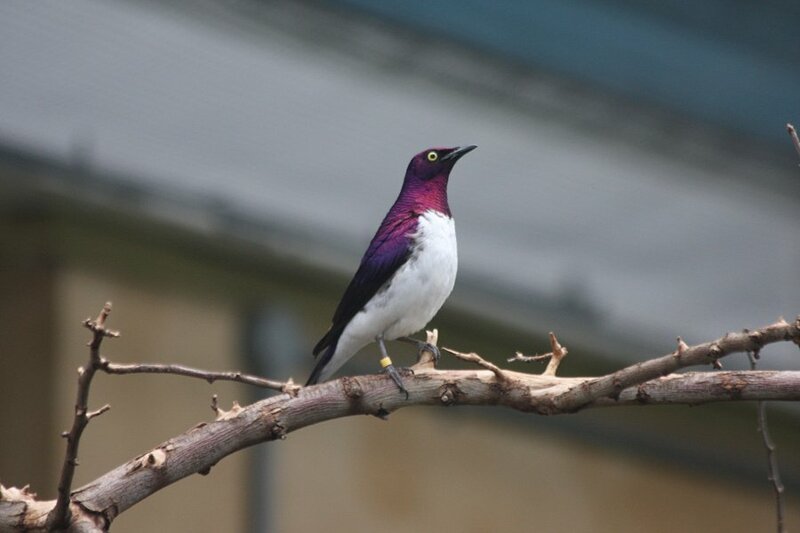 Birds of Arabia; amethyst starling, which looks different colours depending on the viewing angle. 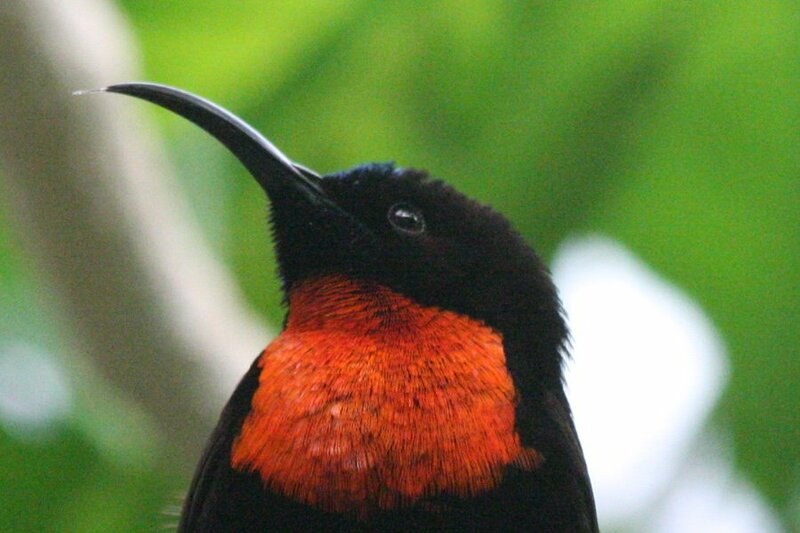 Birds of Africa; scarlet-chested sunbird. Similar to the hummingbirds of South America, this African bird drinks nectar, using a tongue so thin it is almost transparent. 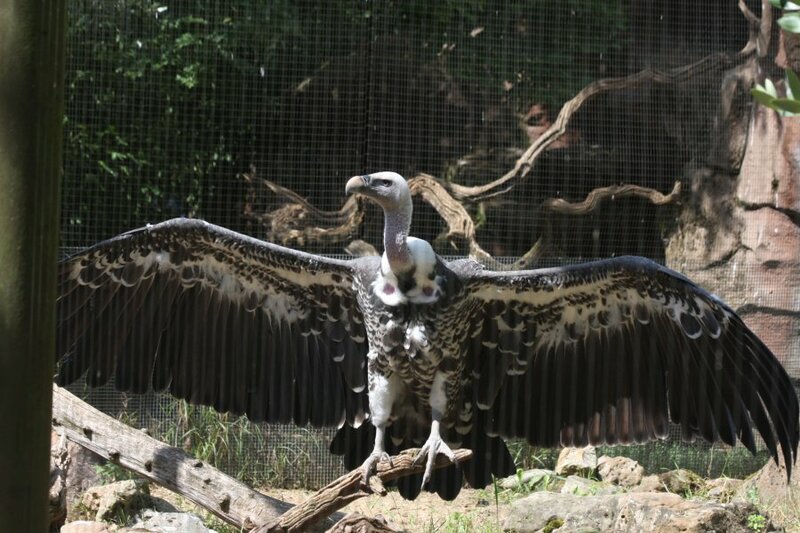 Rüppell's Griffon Vulture showing off its impressive wings. 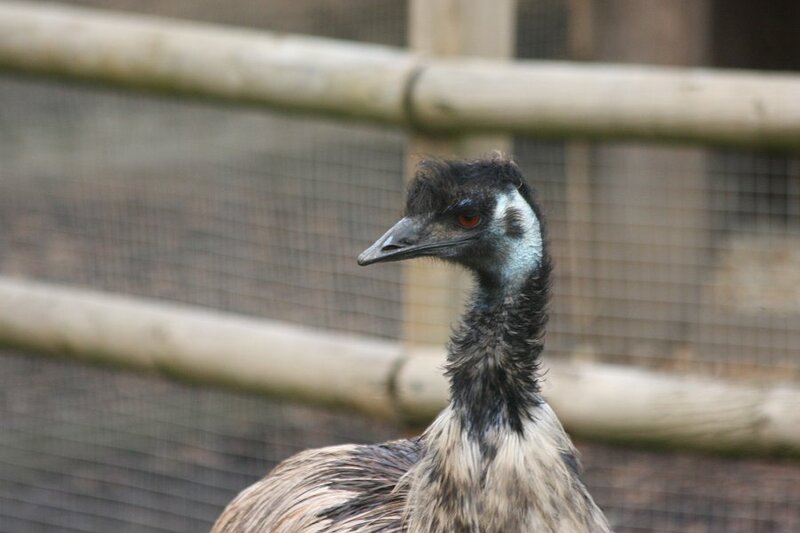 These allow them to fly higher than any other bird, at over 11 km altitude - as high as a jet aircraft. And its intimidating eyes. They are, however, scavengers, rather than predators. 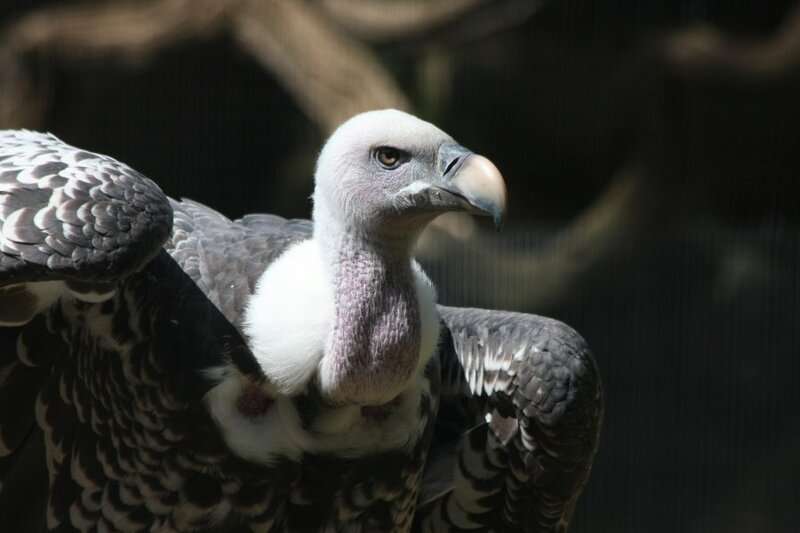 Nonetheless, they are critically endangered as a result of deliberate poisoning. 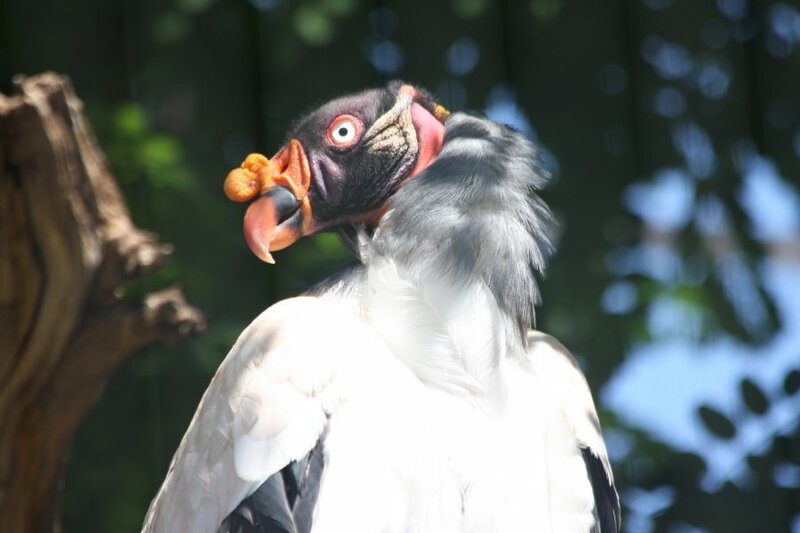 Birds of South America; king vulture. Military macaw. 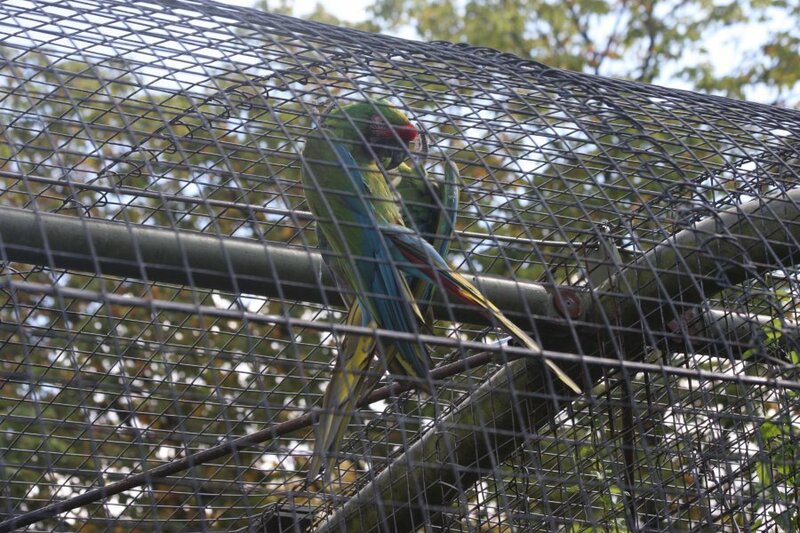 The cage seems rather overengineered, but macaws make a habit out of intelligently dismantling their enclosures; chewing through weaknesses and manipulating locking mechanisms. 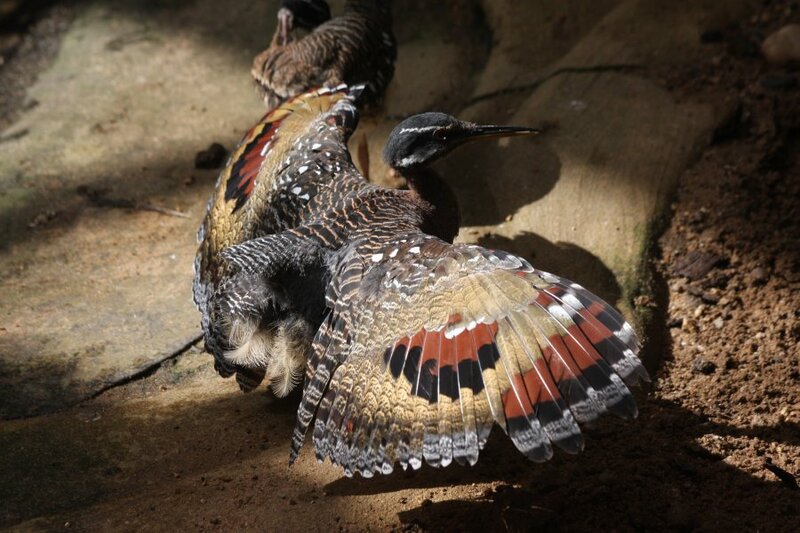 Incredible wing display of a sun bittern. 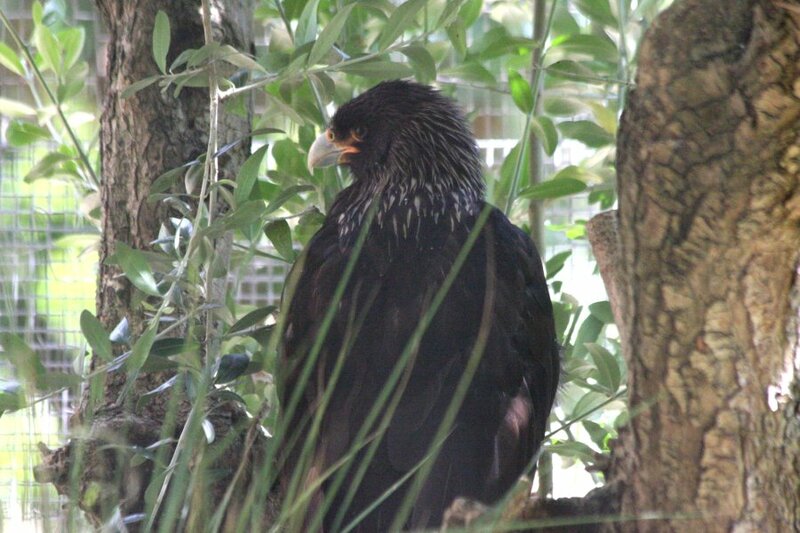 Striated caracara, a scavenging bird of prey from our own Falkland Islands. 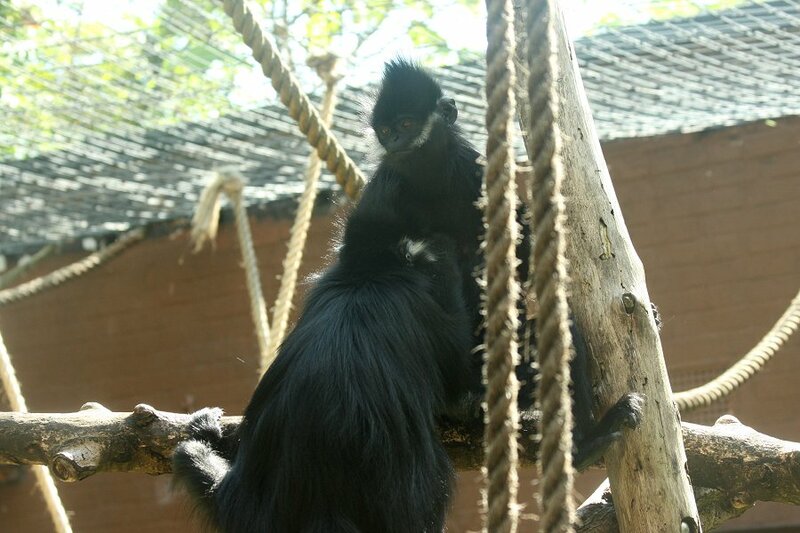 Primates of Asia; Sulawesi crested macaque. 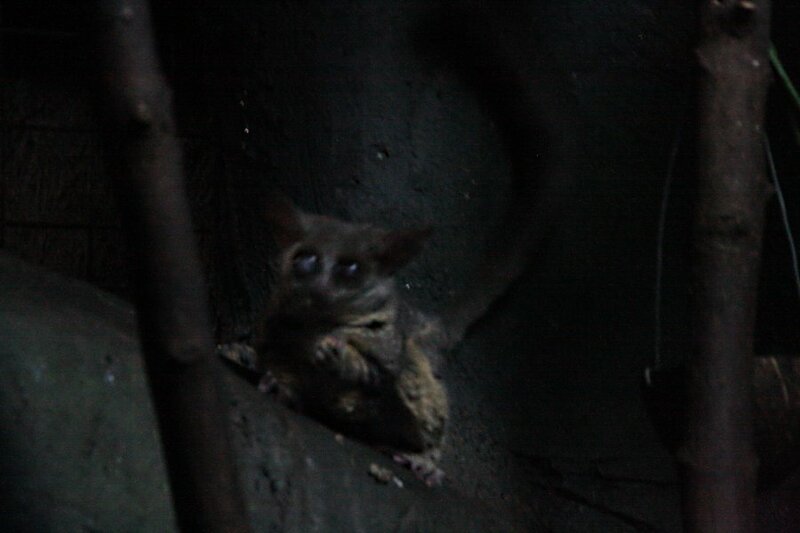 Slender loris (looks like a grey to me) in an incredibly dark nocturnal enclosure. These are from the Indian subcontinent. 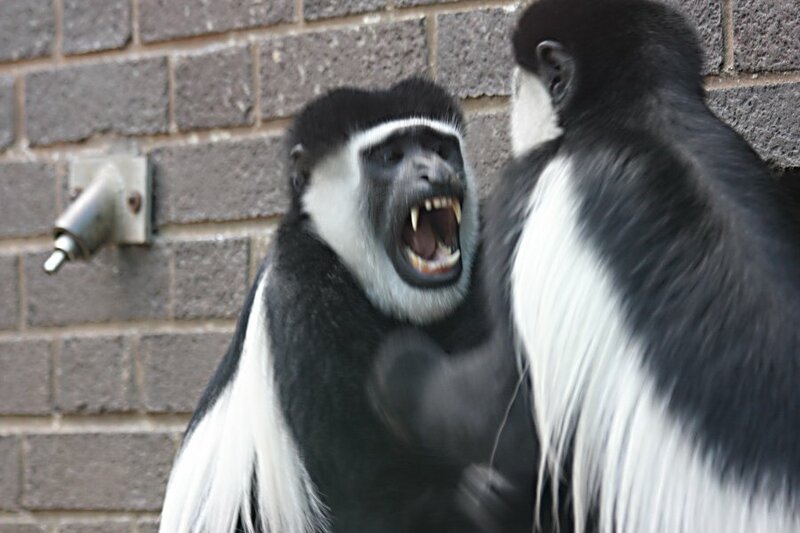 Primates of Africa; Diana monkey. 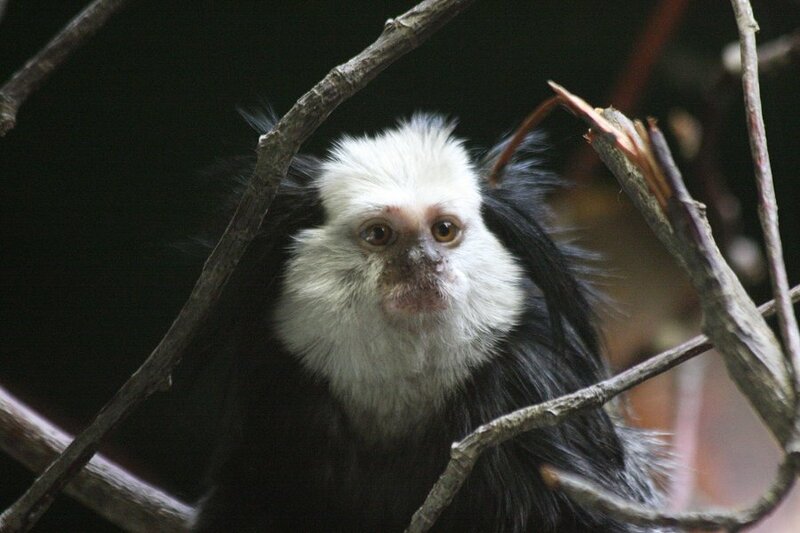 Eastern black and white colobus monkey. 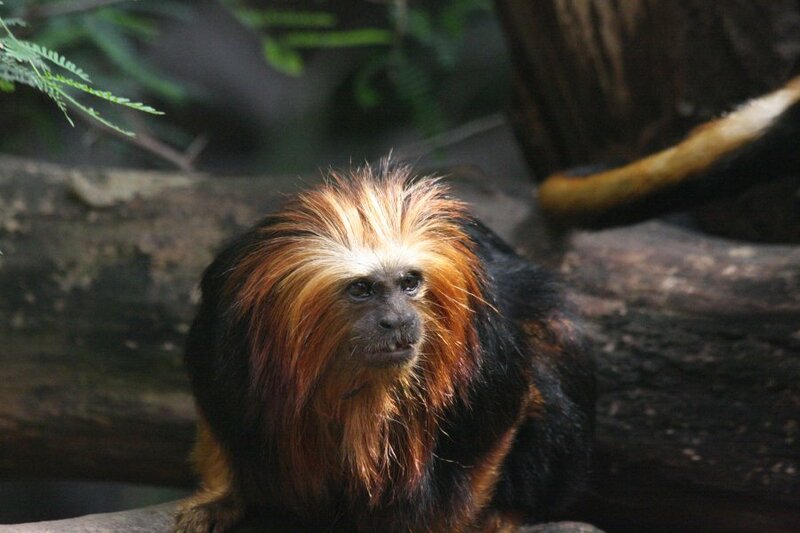 Better known for their characteristic bushy tails and back stripes, but their faces look so wise. Until they do this, and then they don't look so wise after all. They look terrifying. I would have liked a better focused picture, but they were racing and screaming too fast for the camera to react. 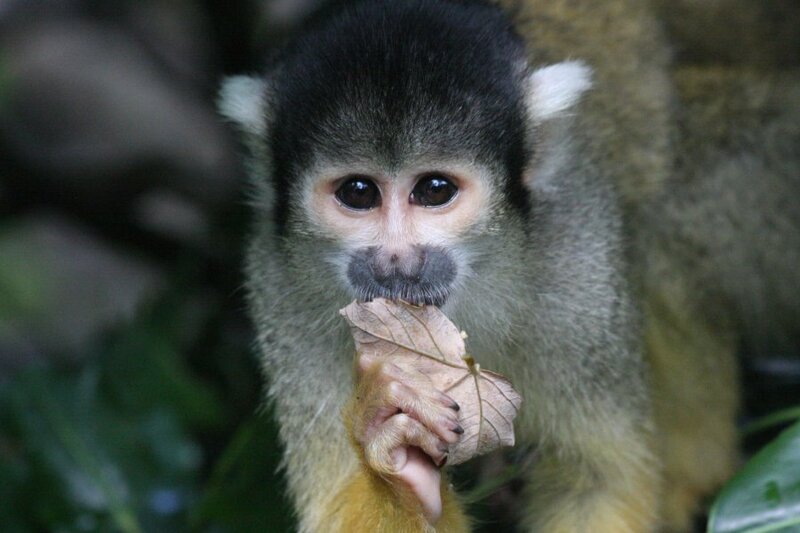 Primates of South America; black-capped squirrel monkey, one of my favourite pictures of this gallery. 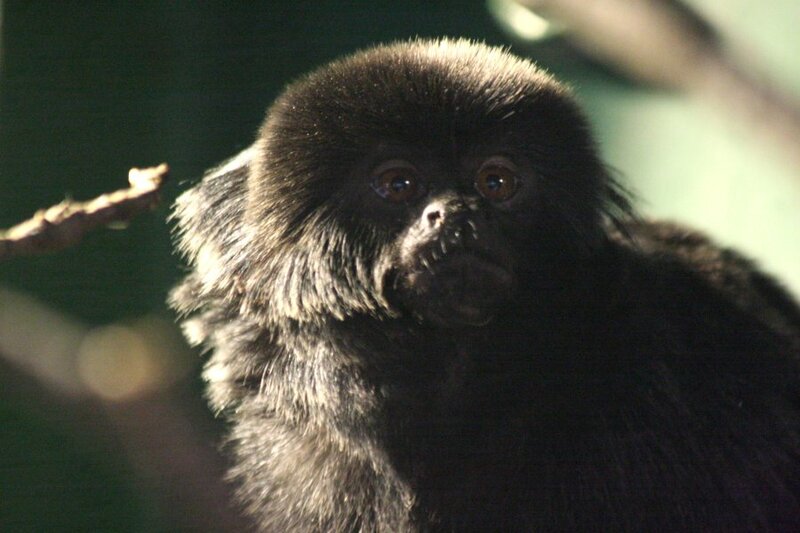 Goeldi's monkey. These sit in a truly impressive indoor enclosure, large enough to hold 8 spacious suburban houses, using heating and fogging systems to create a rainforest environment, complete with full-grown trees. 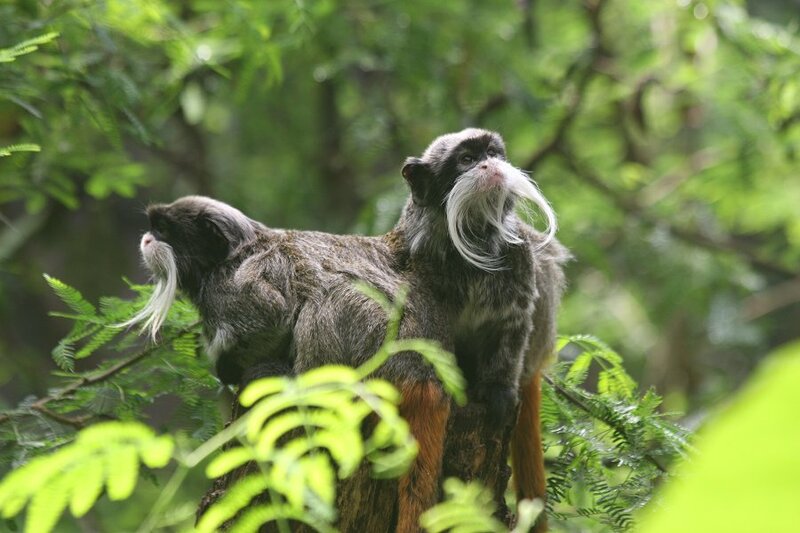 A pair of bearded emperor tamarins, another of my favourite pictures from this gallery. 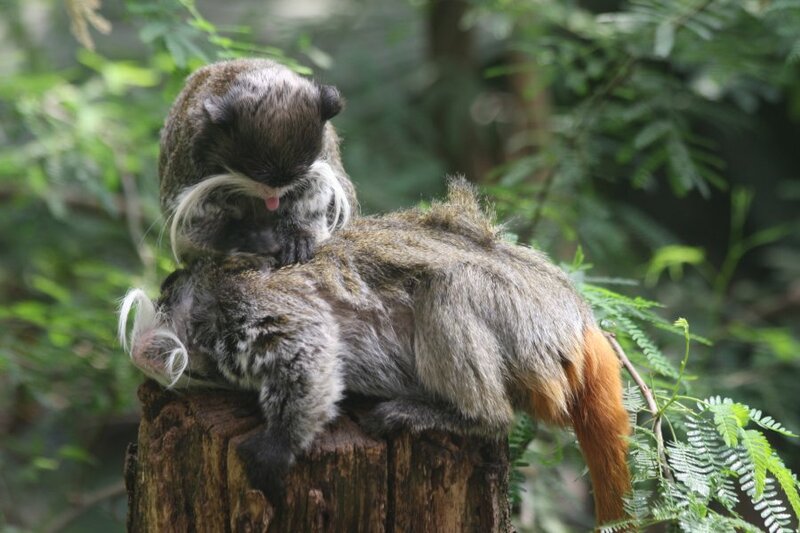 Grooming. The tongue position is evidently important. 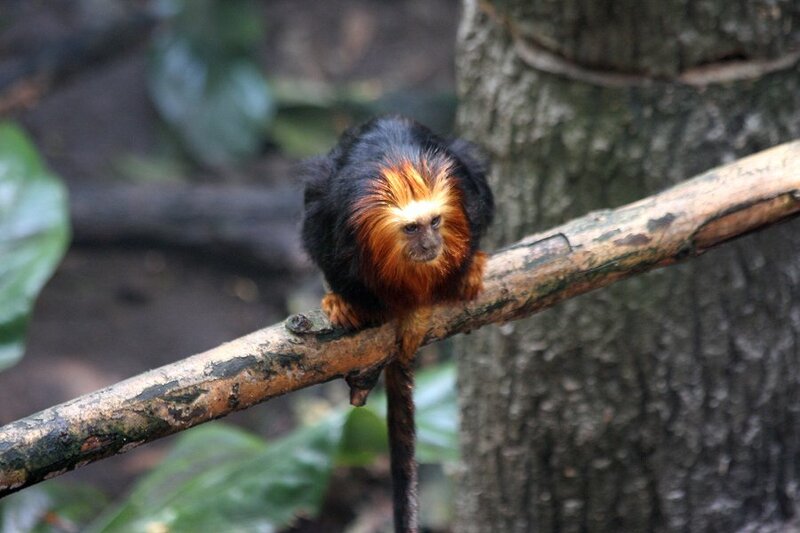 Golden-headed lion tamarin with goofy teeth. 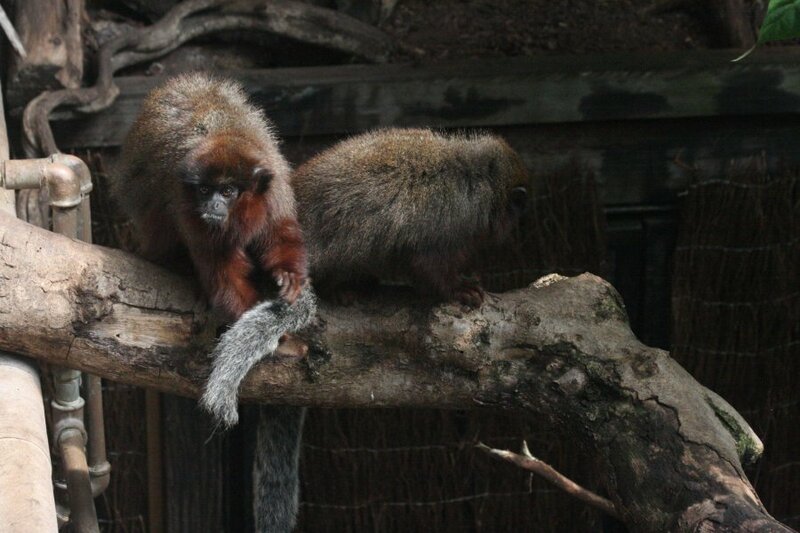 A bonded pair of red titi monkeys grooming. Philippine crocodile, a relatively small crocodile, with a maximum length of 3.1 metres. 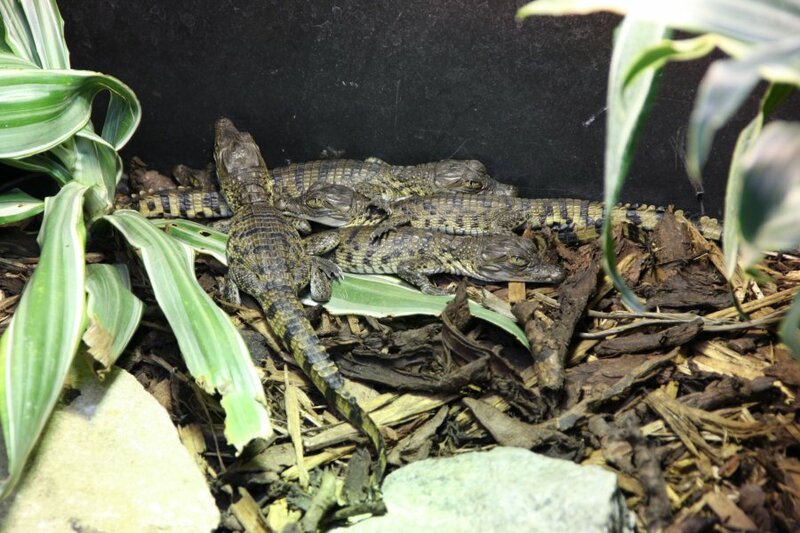 Philippine crocodile hatchlings, behind the scenes. 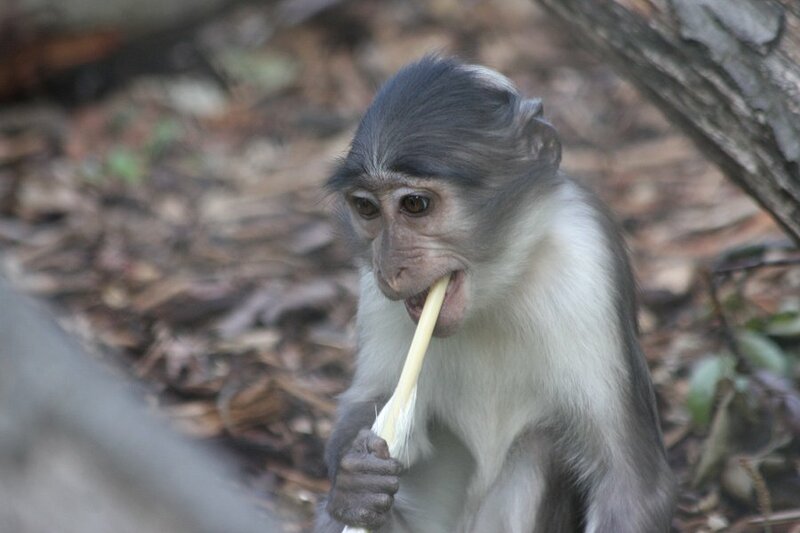 These are being bred as part of an effort to save these critically endangered animals from extinction. Oceana lizards; Fiji banded iguana. Since iguanas (certainly the closest relatives of these) originate in the Americas, it is unexpected for any iguanids to exist so close to Australia (Australia's closest relatives are the agamids). The origins of these iguanas is therefore something of a mystery, but their ancestors are thought to have rafted here on ocean currents. 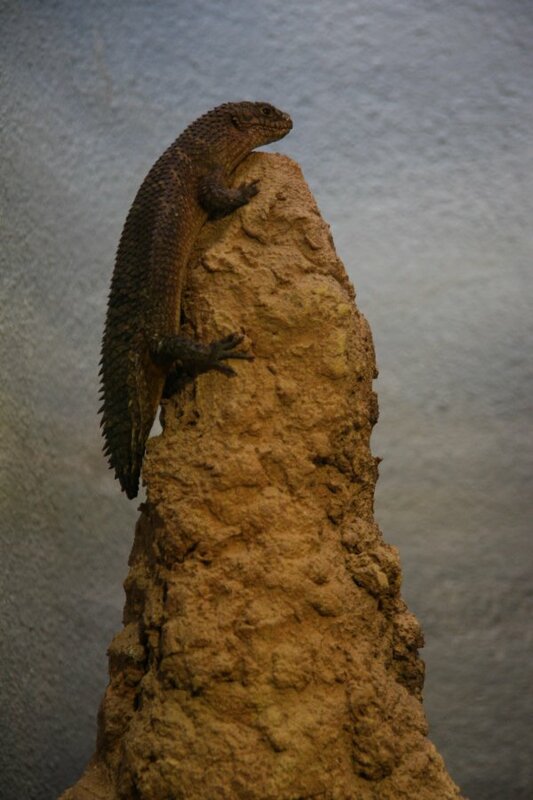 Australian lizards; gidgee skink, a small lizard that lives in a very similar natural environment, and eats similar food, to the popular Bearded Dragon. 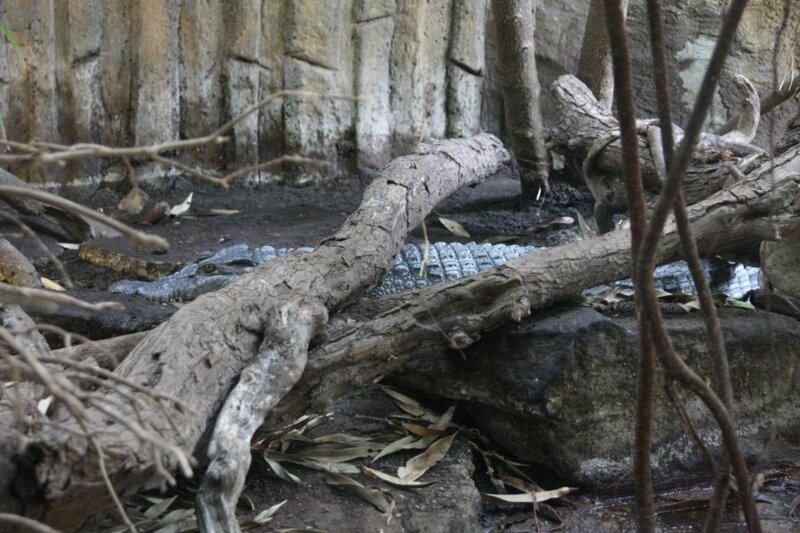 It's closest popular pet relative is the blue-tongued skink. 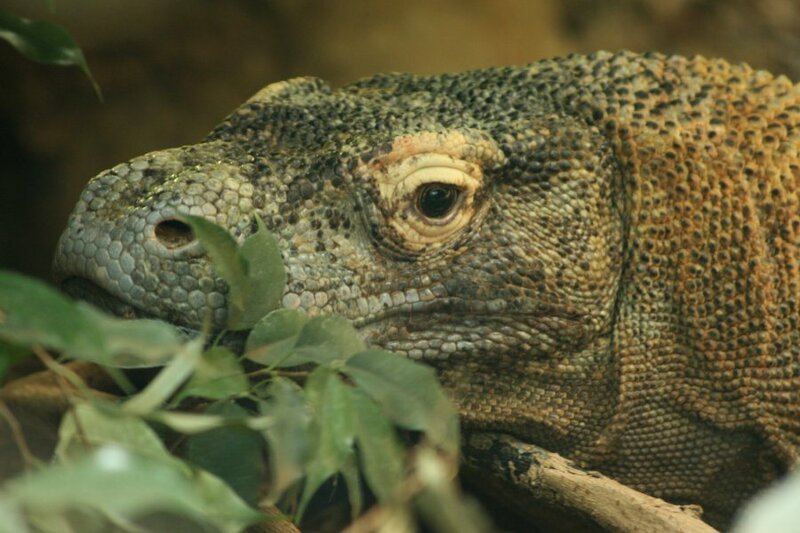 Asian lizards; Komodo dragon. 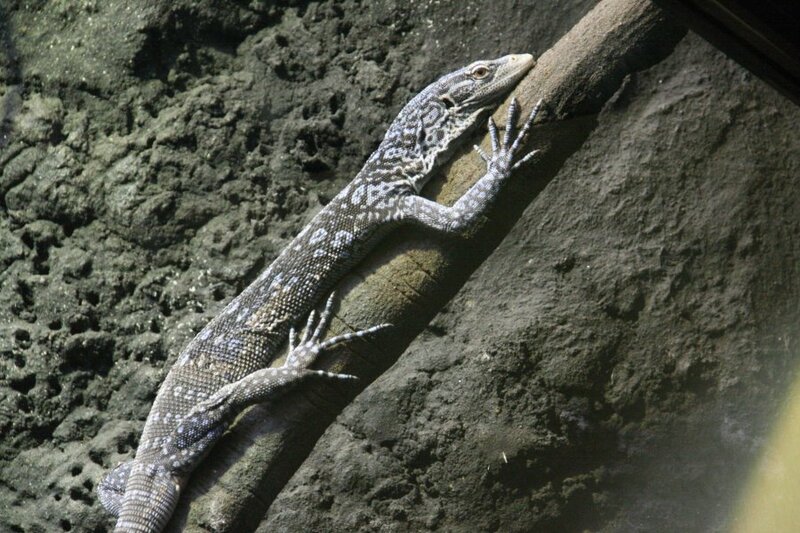 These are the heaviest of all lizards, normally up to 70 kg. However, they can eat their own weight in food, making wieghts unreliable; the largest one weighed 166 kg, but exactly how much of that was food is unknown. 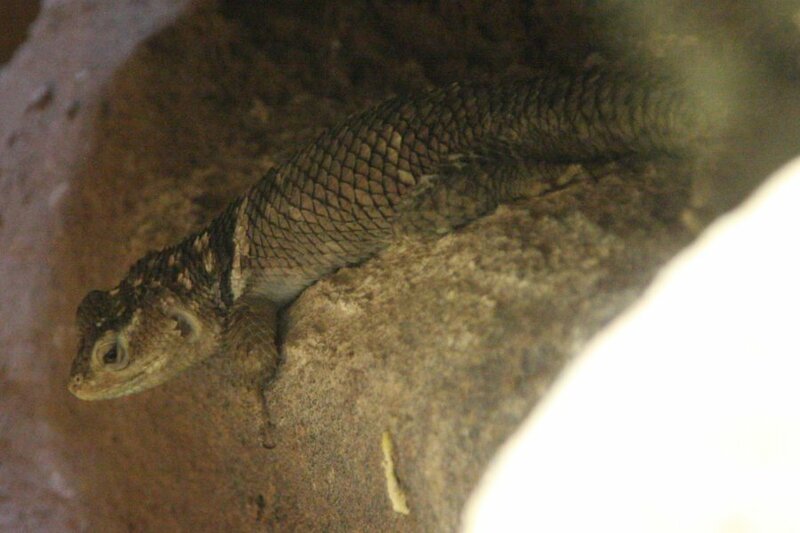 They are the longest lizard on average at 2.3 metres (females) and 2.6 metres (males), but the maximum recorded length was 3.13 metres, 8 cm shorter than the longest recorded Asian water monitor. 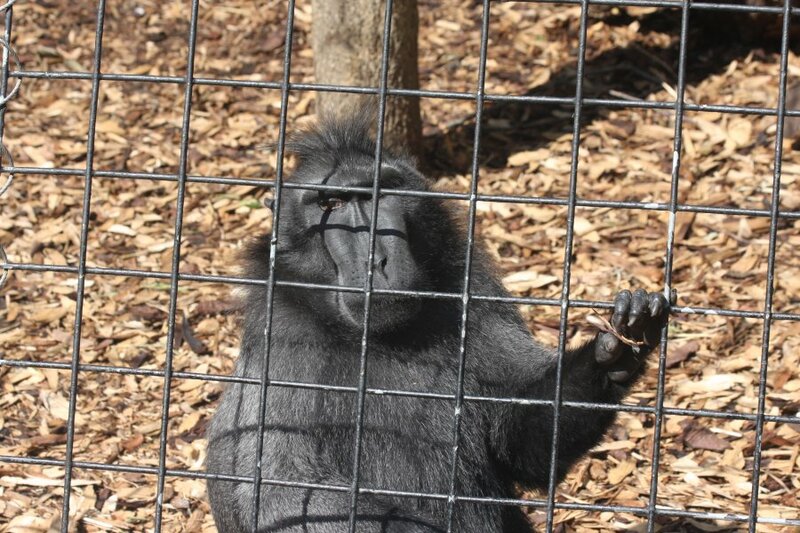 In captivity, they are often quite gentle. In nature these are formidable predators, stalking their prey for days, chasing it down and ferociously attacking, biting with serrated teeth coated in bacteria and venomous saliva, then waiting for days for it to die. 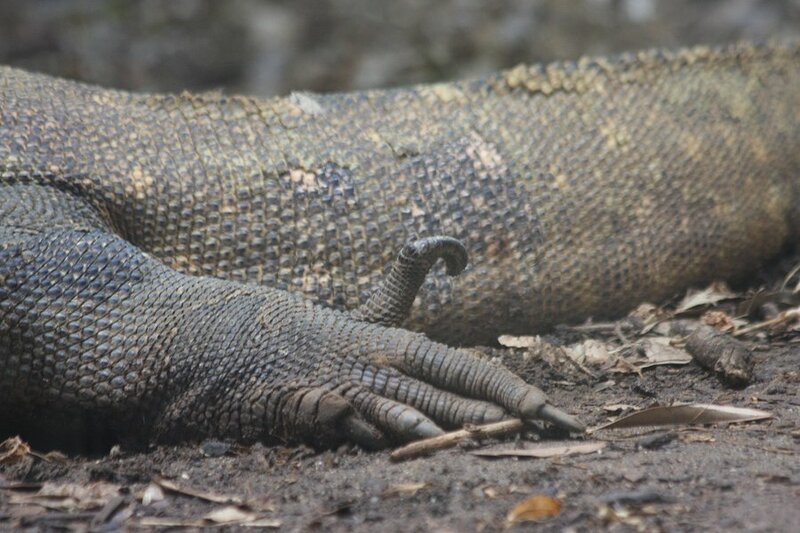 Large claws, used for digging and as weapons. 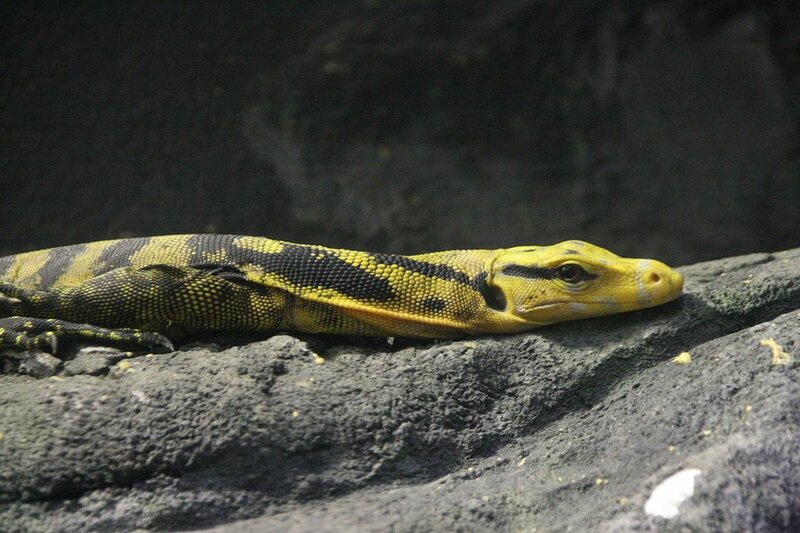 The much more beautifuly coloured Philippine water monitor. 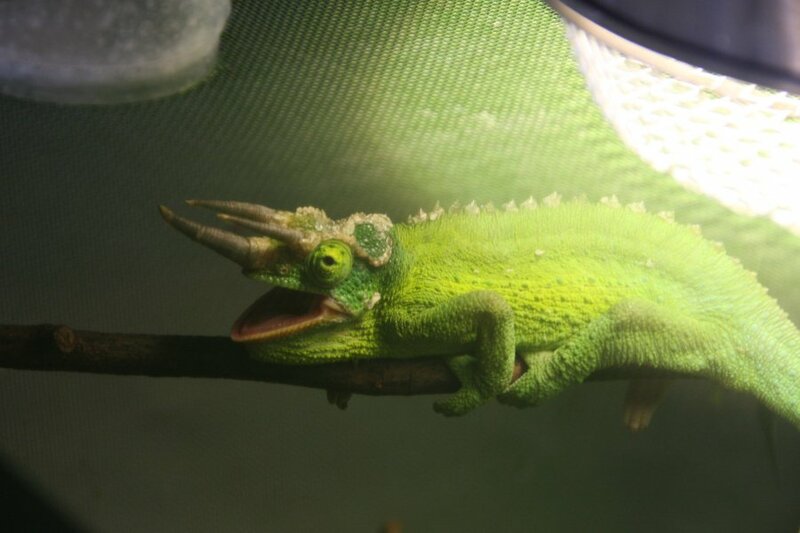 African lizards; Male Jackson's chameleon, with the characteristic triceratops-style horns. Female Jackson's chameleon. 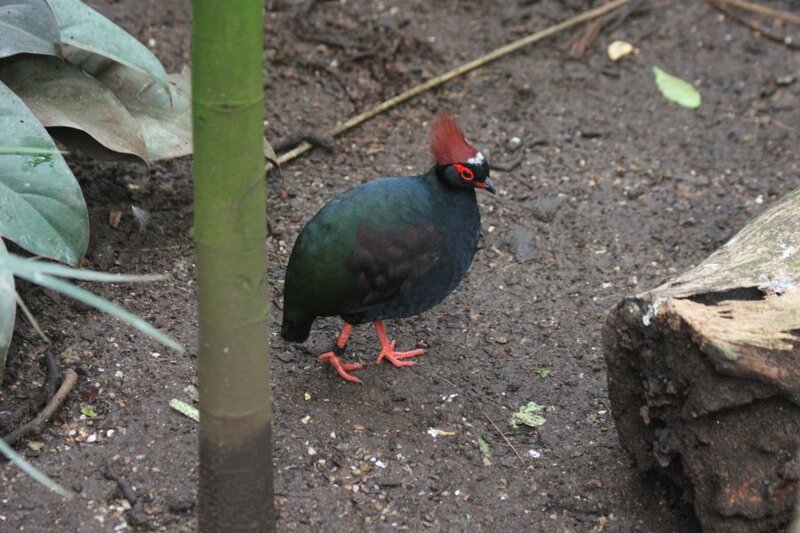 The large size and lack of horns suggests that these are the nominate subspecies. Parson's chameleon. Although clambering down onto the ground usually makes chameleons rather unhappy, the colours show that this chameleon is actually quite happy in this location. 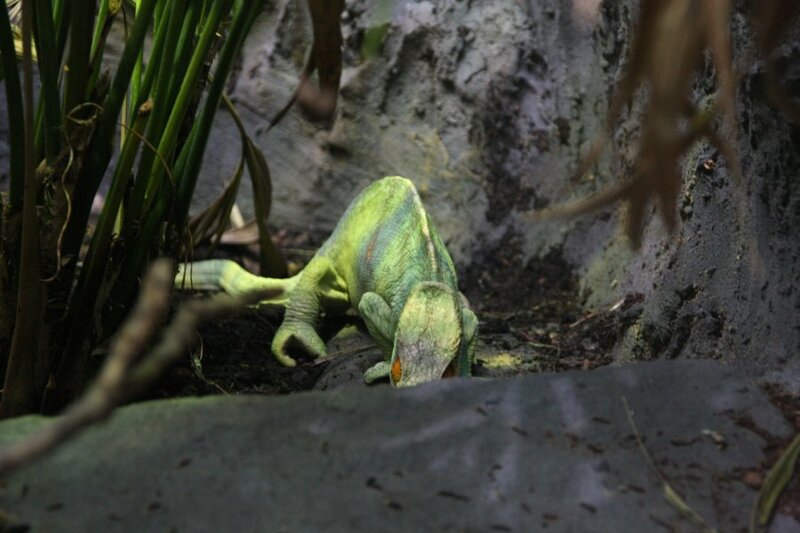 Oh, and of course I should mention that chameleons do not change colour to match their backgrounds (with only one very minor exception); they change colour based on mood and temperature. 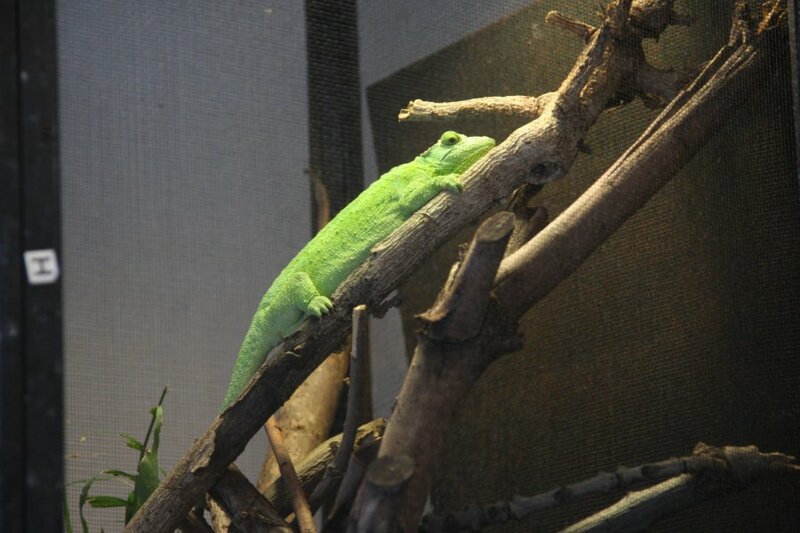 Green usually signifies happy, relaxed and warm, but this depends on the species. 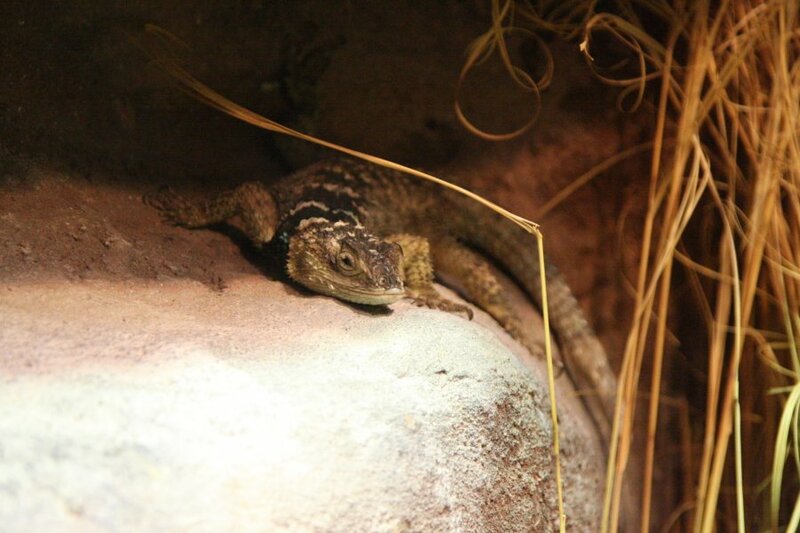 North American lizards; blue spiny lizard, a desert species. A more highly patterned version. 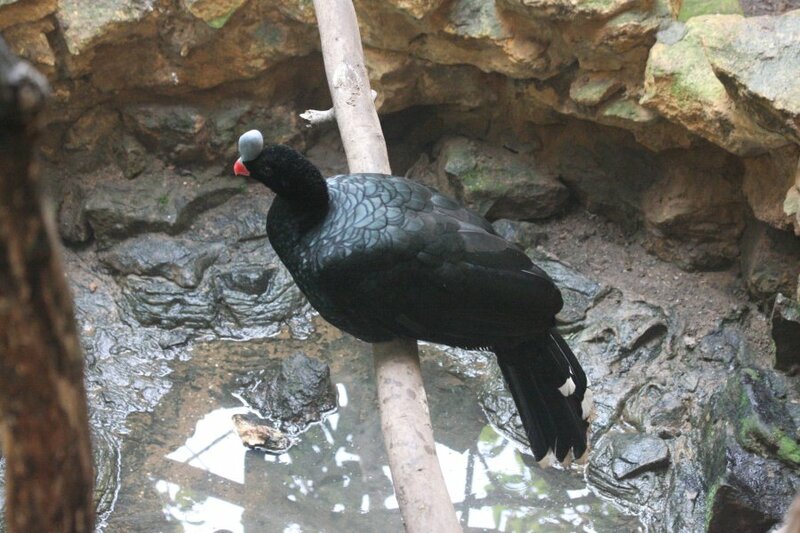 Although they do not have sticky feet, their claws allow them to walk upside down on rough rocks. Rio Fuerte beaded lizards. 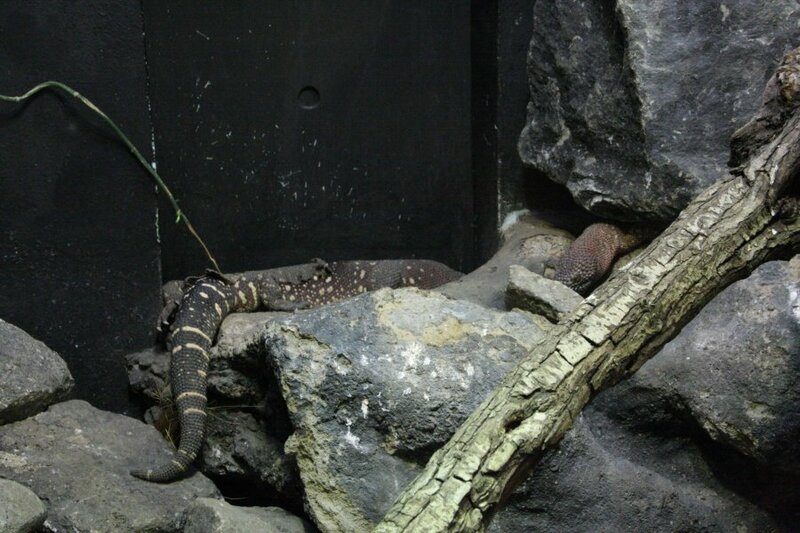 Along with their close relative the smaller gila monster, these are the only venomous lizards native to the Americas. Their venom normally causes severe pain rather than being particularly dangerous, but they are classed as a Dangerous Wild Animal (DWA) in the UK. 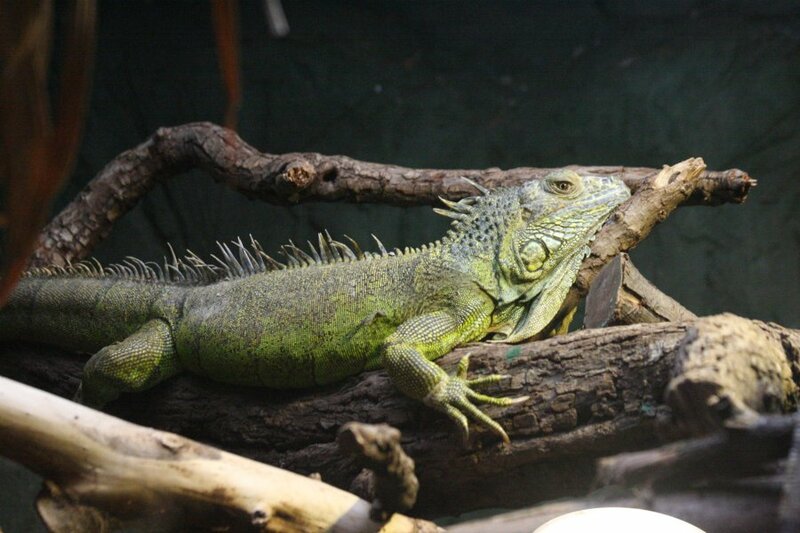 Central and South American lizards; the ever-popular green iguana, which could be very large as a dominant male. This one is likely to be male, but is actually quite small. 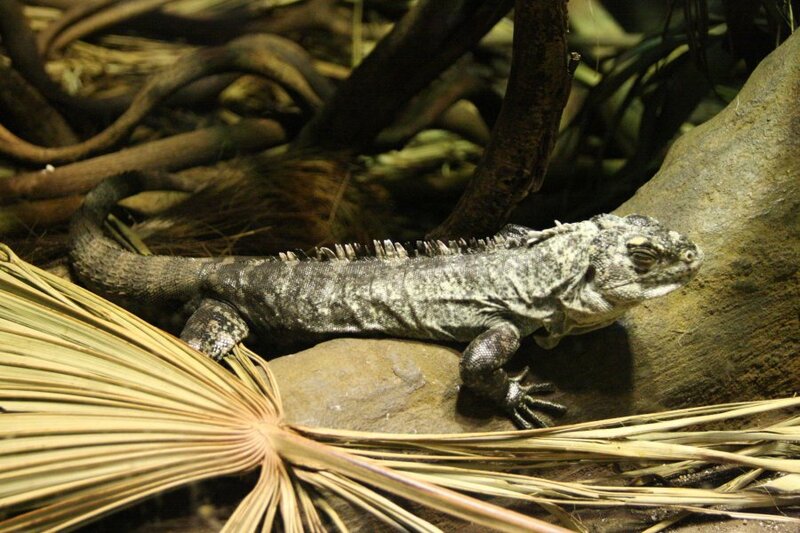 Rhinoceros iguana, a medium sized ignuana that is very heavily protected, but can also be found as a pet. 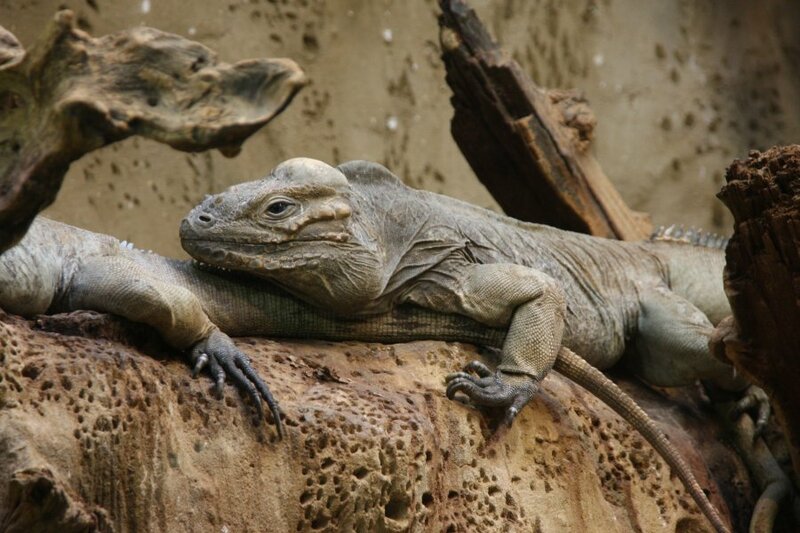 For an iguana, they are quite gentle, and can become extremely tame or even affectionate. 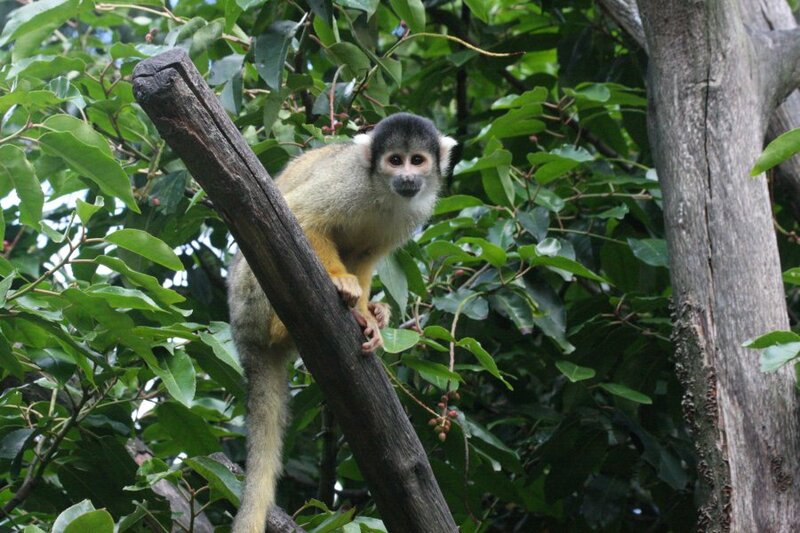 Unlike most ignuanas, they are happy to live on the ground rather than up in the trees. Utila spiny-tailed iguana, a relatively small iguana from the Caribbean. 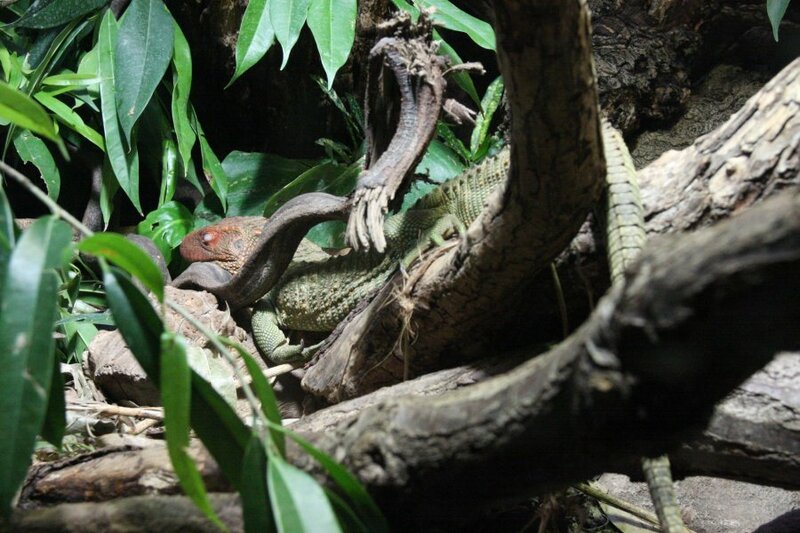 Caiman lizard, in the skink family. They have stunning black eyes - that white eye is an eyelid. 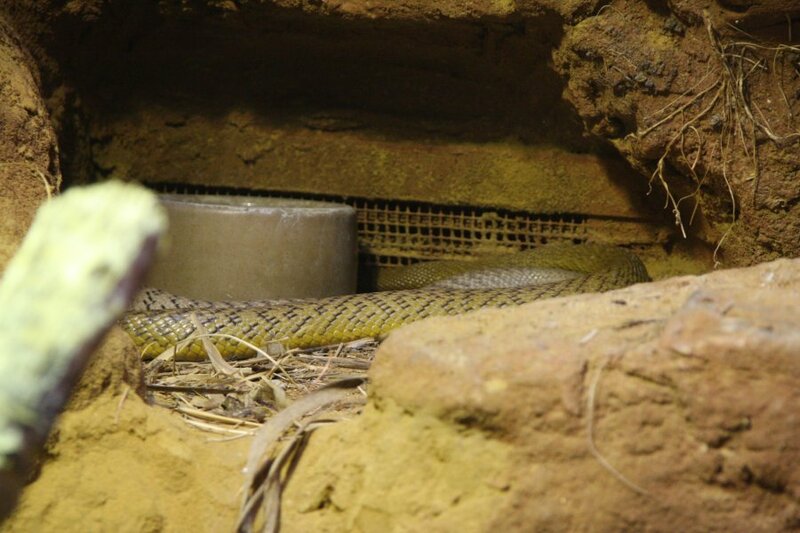 Australian snakes; Inland taipan, the World's most venomous snake. 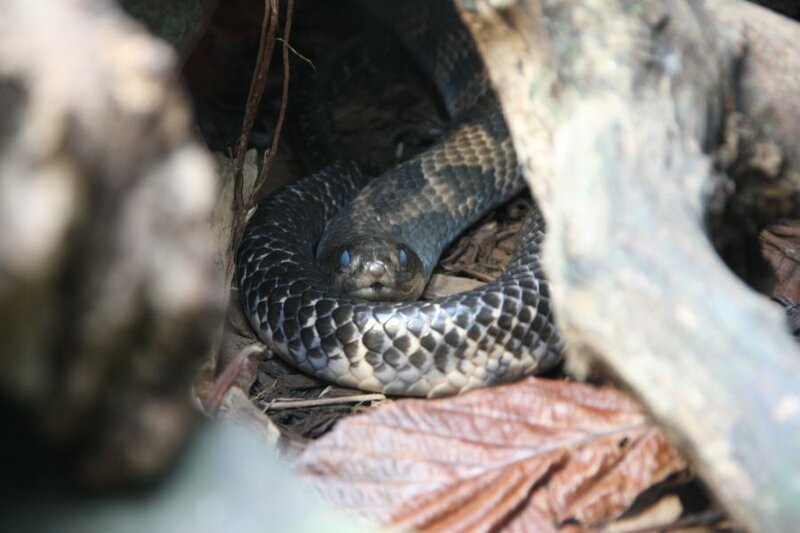 Despite the extreme potency of the venom, the natural habitat is far from urban areas, and the snake prefers to flee rather than bite anyway. If it does bite, it is very likely to inject venom, and death can occur rapidly (30 minutes) without treatment. In practice, several other venomous snakes are far more dangerous, due to being more likely to be encountered and to be bitten. 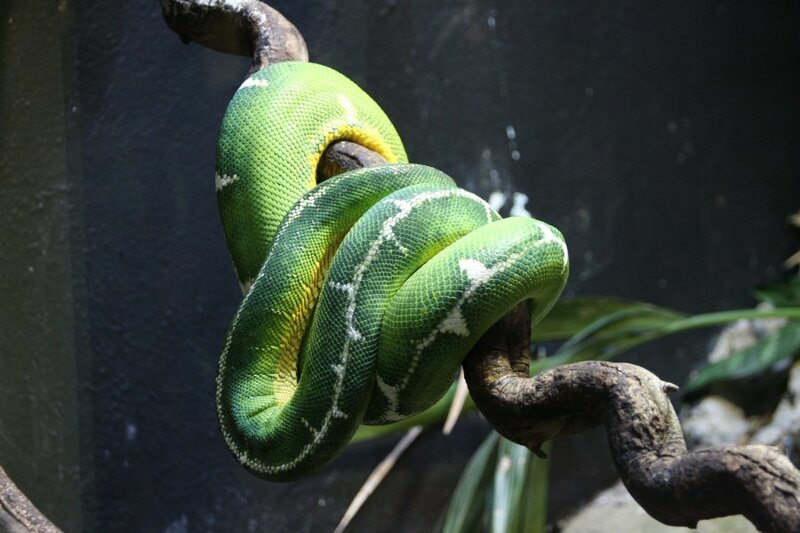 Asian snakes; Boelen's python, one of the many beautiful pythons in the Morelia family. View of the head, with the heat pits clearly visible on the top lip. The ones on the sides of the lower lip are not visible. 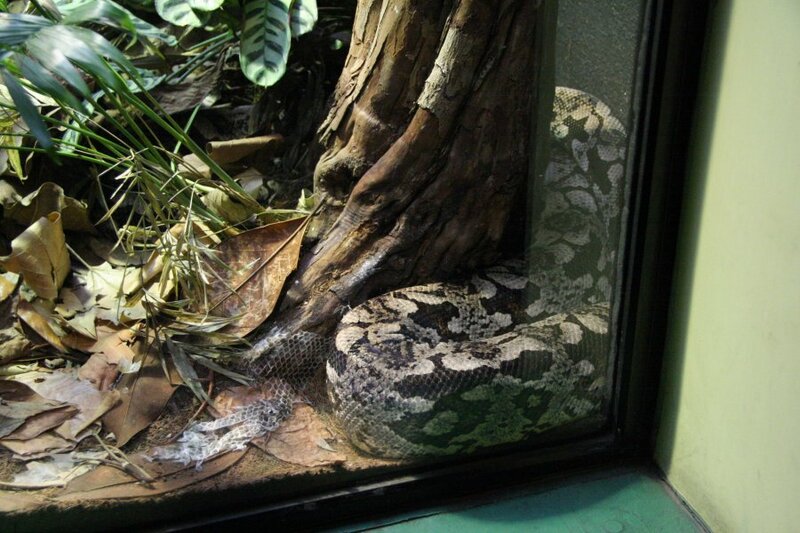 The head scales are much larger than the various carpet pythons and green tree python, and instead are similar to those on the scrub pythons. Another one, behind the scenes, presumably part of a breeding programme (though these are relatively difficult to breed). 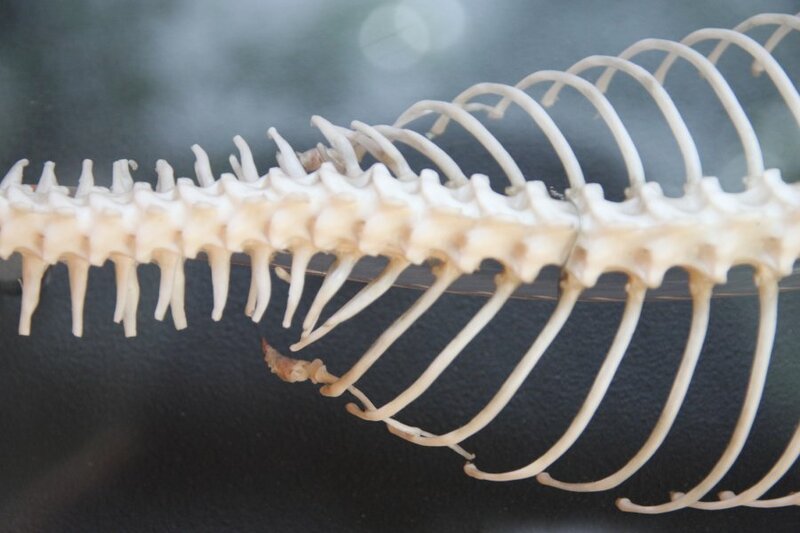 Presumably a python skeleton; this shows the vestigial legs (spurs) and pelvis that sit either side of the vent, found in pythons and boas but not in most other snakes. A sign of their lizard ancestors, males still make limited use of them during courtship, tickling the females to signify interest. Nerdy details; both types also have two functioning lungs. Boas and pythons differ in that only pythons have a postfrontal bone and a supra-orbital bone in the skull above the eye, and the latter touches the prefrontal bone (except Calabaria reinhardtii and Casarea dussumieri have a supra-orbital bone, however it does not touch the prefrontal bone - Casarea dussumieri is no longer classified as a boa). Only pythons have premaxilla teeth (except Aspidites lose them soon after hatching and Calabaria reinhardtii has them despite being a boa - Morelia viridis has them but Cogger, 1986, got this wrong [Kluge 1993]). 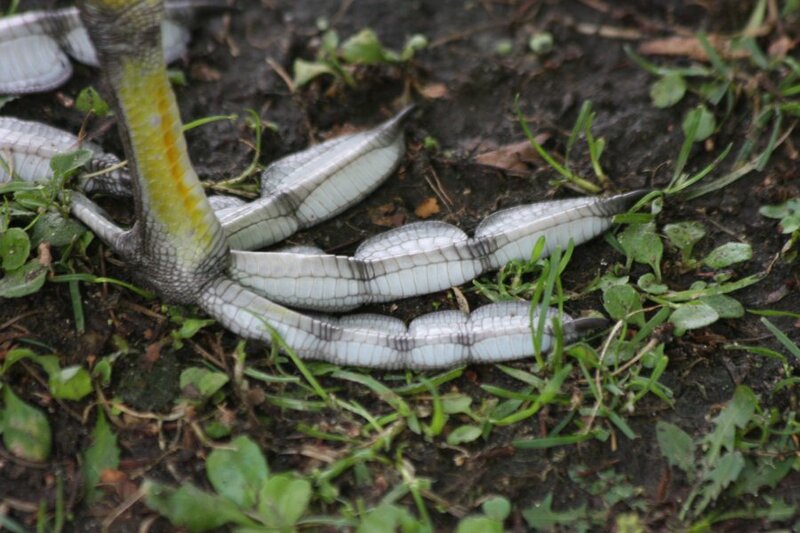 Most pythons have heat pits in the middle of their labial scales (except Aspidites which have none), while some boas (eg. 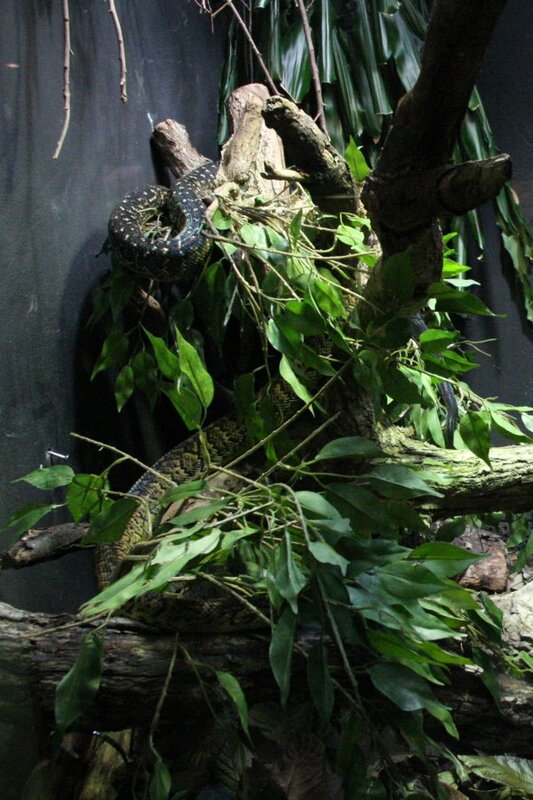 Boa constrictor, anaconda) have thermal sensors but no visible heat pits, and other boas (eg. tree boas, rainbow boas) have heat pits between the labial scales, and one (Calabaria reinhardtii) apparently has none at all. All pythons lay eggs, while most boas (except Calabaria reinhardtii, Gongylophis muelleri, Eryx jayakari and the non-boa Casarea dussumieri) are livebearers (ovoviviparous) - Calabaria reinhardtii seems part way between boas and pythons and has previously been classified as a python. 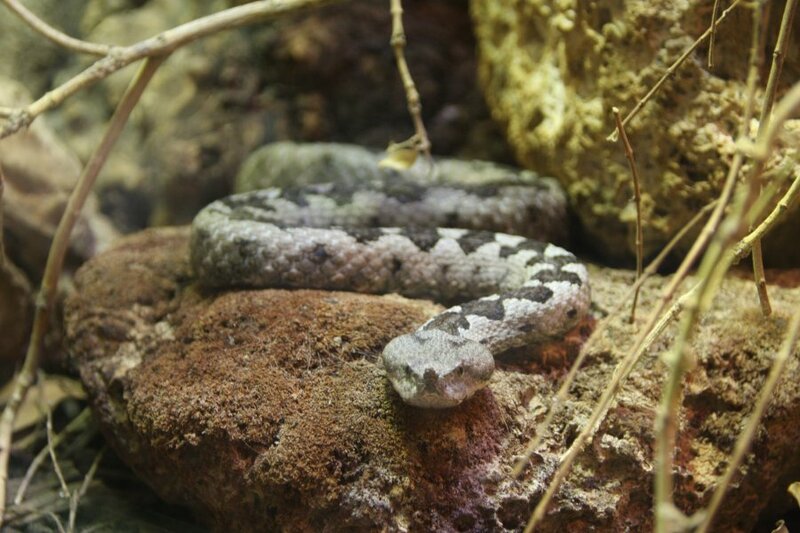 Boas are native mainly to the Americas and to a small extent Africa (such as the sand boas, Casarea dussumieri and Dumeril's boa), Europe (sand boas, extinct Bavarioboa, Dunnophis, Rottophis, etc. 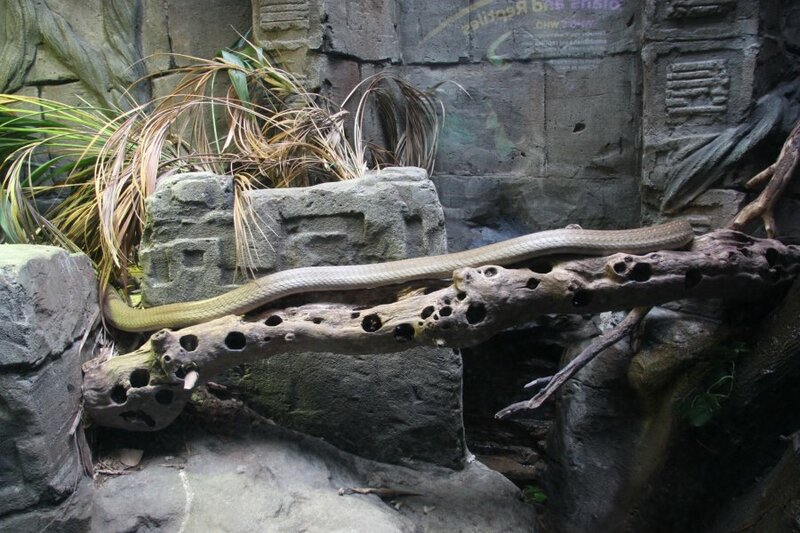 ), the Middle East (sand boas) and the Indian subcontinent (sand boas again), while pythons are native to Africa, Asia and Australia (and Europe; extinct Palaeopython). 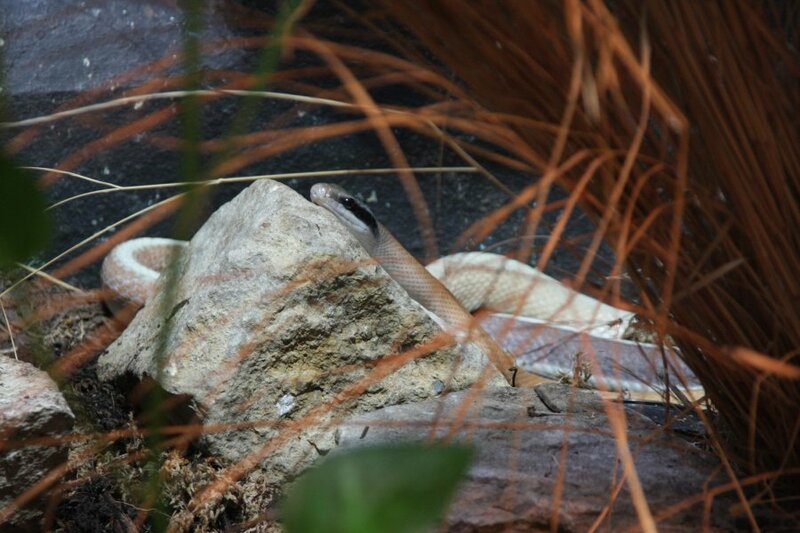 Cave racer, one of the beauty rat snake family. 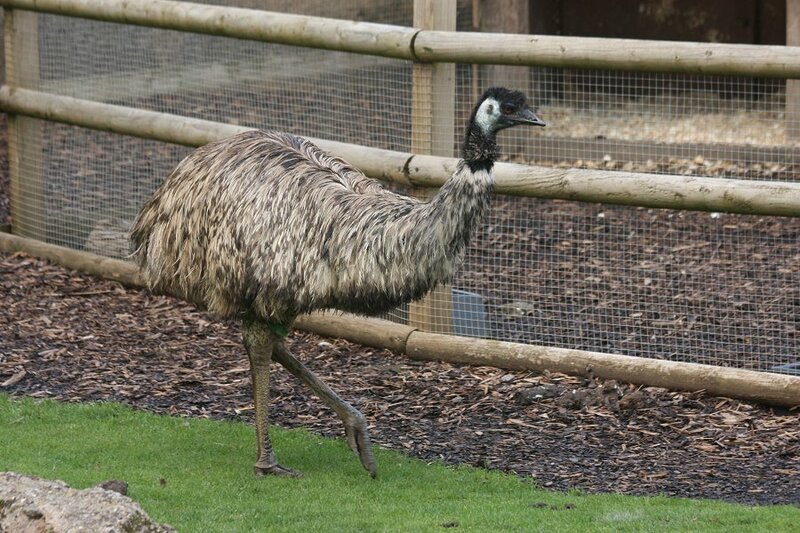 Extremely fast and quite long, but becoming quite tame when raised as pets. They need a lot of space, however, and like to be allowed to climb. Rhino rat snake, a colubrid with a cool nose spike. King cobra, the longest venomous snake in the World, at up to 5.7 metres. It prefers to flee or warn off potential threats (like humans) with a low growling hiss, and a threatening stance raising the head over 1.5 metres off the ground. If that fails, it has a lot of venom at its disposal, and it can kill within 30 minutes of a bite. In general, bites are very rare as the snake prefers to keep away from humans, and snake charmers are by far the most likely to get bitten. African snakes; Dumeril's boa, one of the minority of boas that come from Madagascar. 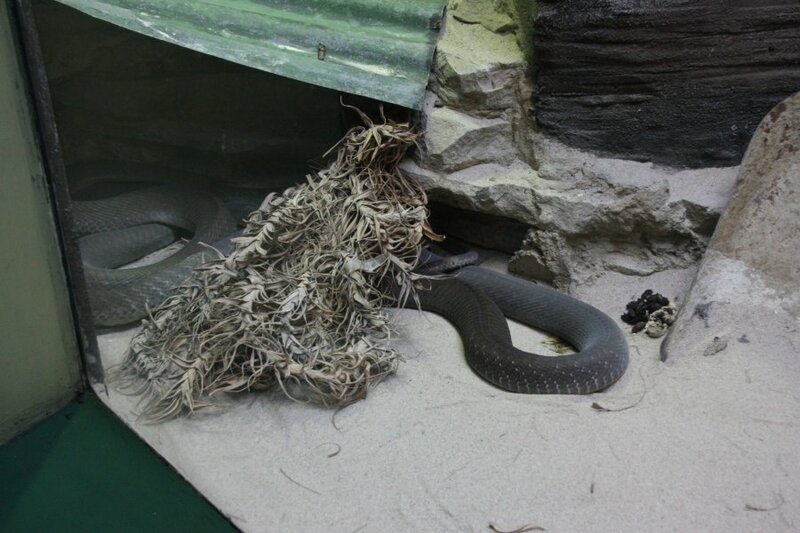 Black mamba, a brown snake with a black mouth. 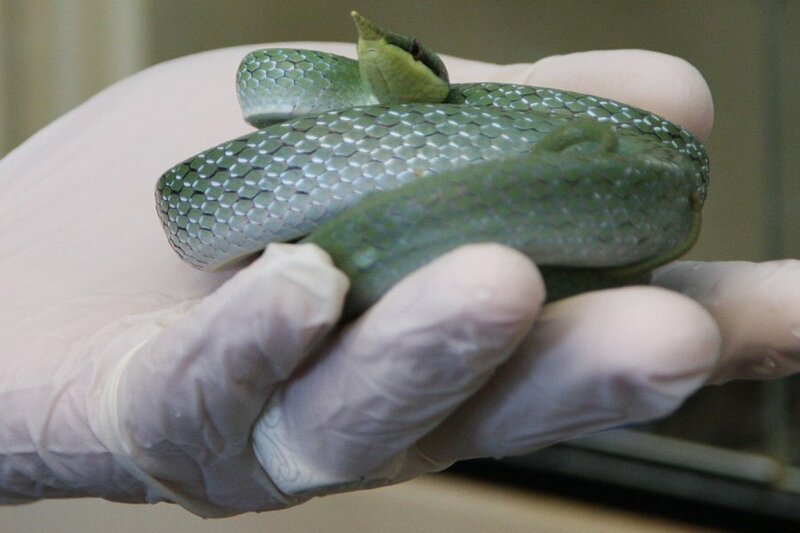 This is one of the most - if not the most - dangerous snakes in the World, due to it living close to people, and often a very long way from effective medical care. 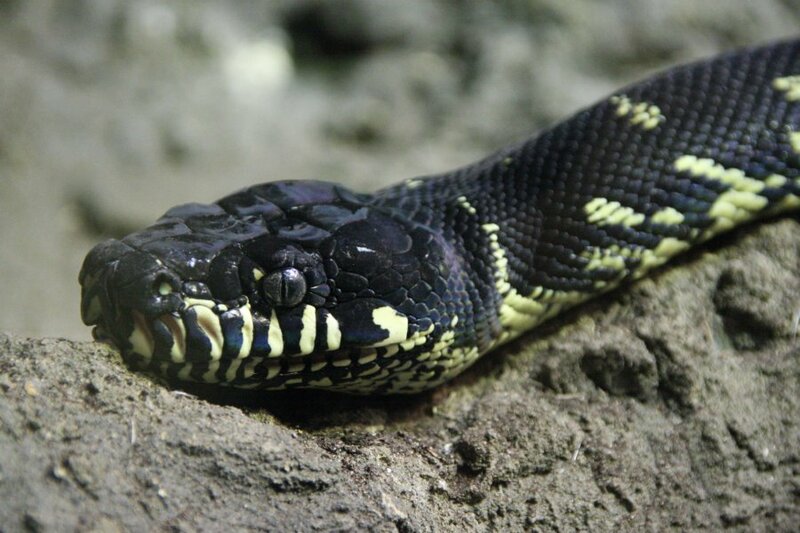 Like most snakes it would prefer to flee than bite, but it may inadvertently flee in the same direction as the person it is trying to escape from, leading to a mistaken belief that they will chase humans. 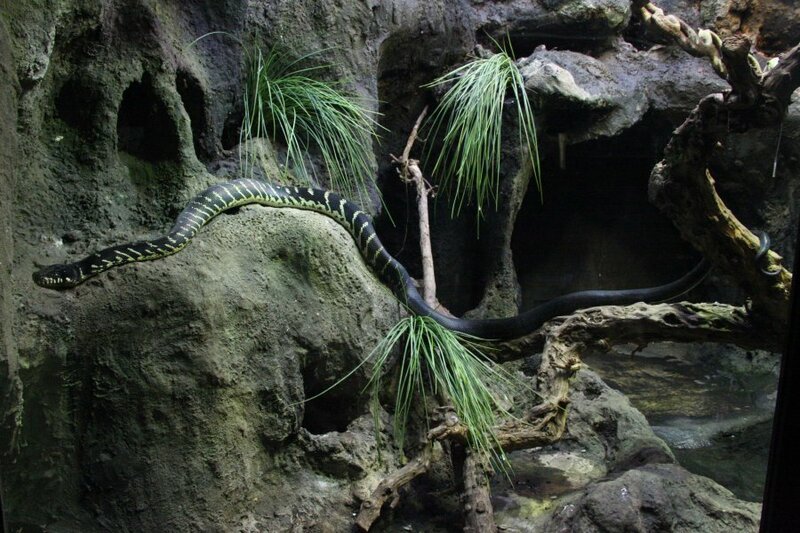 As the fastest snake in the World, they move as fast as a person can run through the grasslands where they are found. They will defend themselves if they feel they have failed to escape, and will readily bite in such cases. As they can easily lift their heads over a metre off the ground, leather boots are not an effective defence. With an extremely potent venom, there is very little chance of survival without medical care. Unfortunately, the fear of snakes like this generally means that harmless snakes get the same reaction, and they are often pointlessly killed. 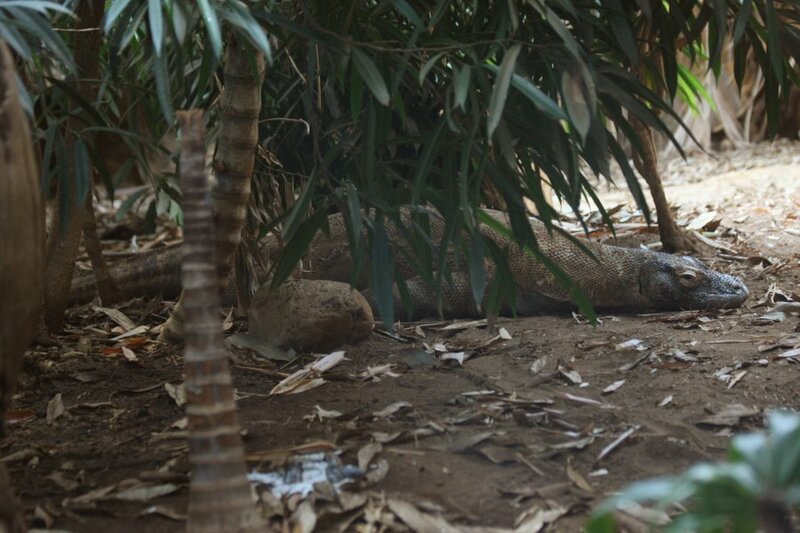 Fortunately, mambas spend most of the daytime in burrows, hidden away from people. 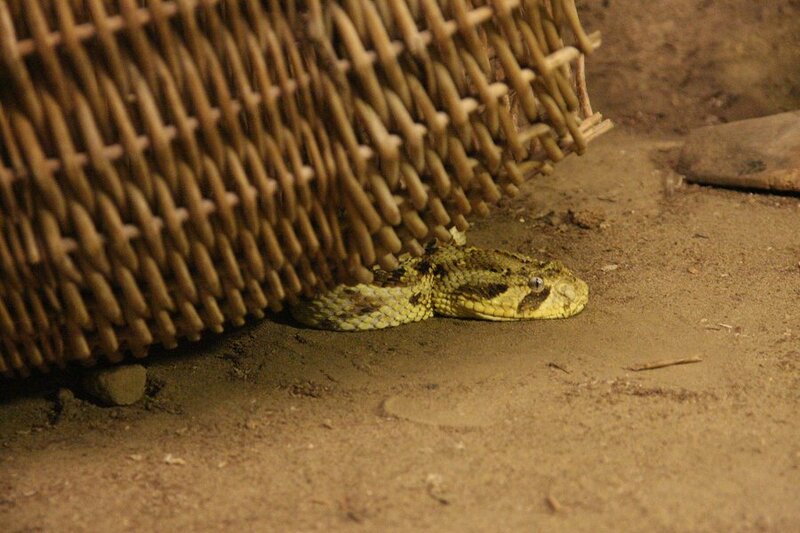 Puff adder. The name is randomly applied to several species, all venomous, but some much more than others. 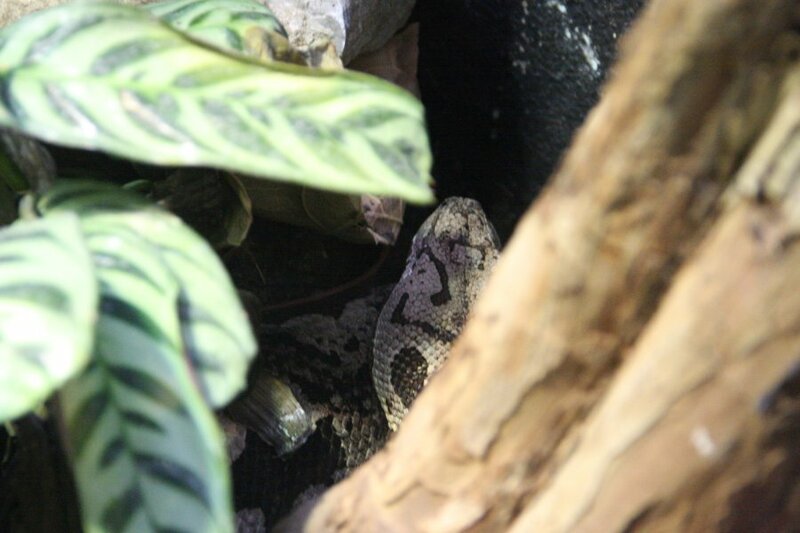 This one appears to be Bitis arietans, responsible for more fatalities in Africa than any other snake species. This is largely due to it being commonly found near inhabited areas and paths, and sitting still rather than fleeing when humans approach, leading to a high number of potent venomous bites. The yellow colour suggests that this particular one is probably an East African or South African Cape variety. Another of the puff adders. 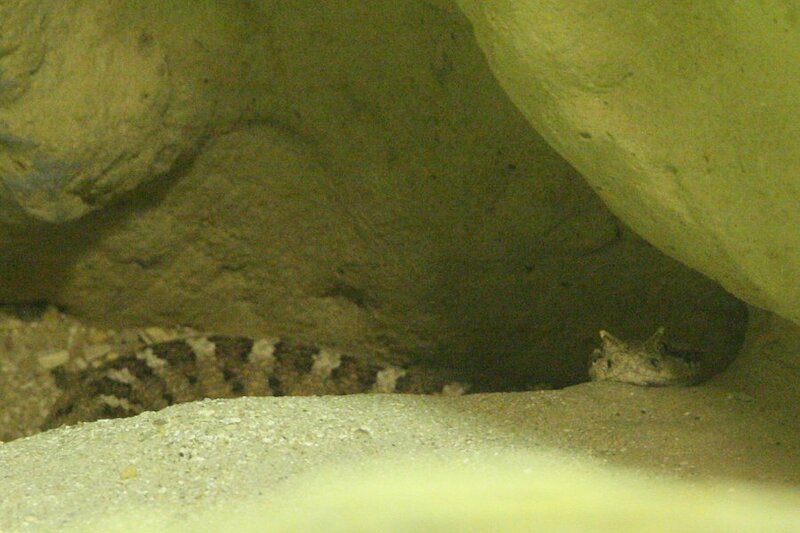 This one appears to be a rhinoceros viper. The horns can be seen on the head (in front of the water bowl). Despite the body looking like a Gaboon viper, the horns, rough head scales and head markings say that it cannot be one. 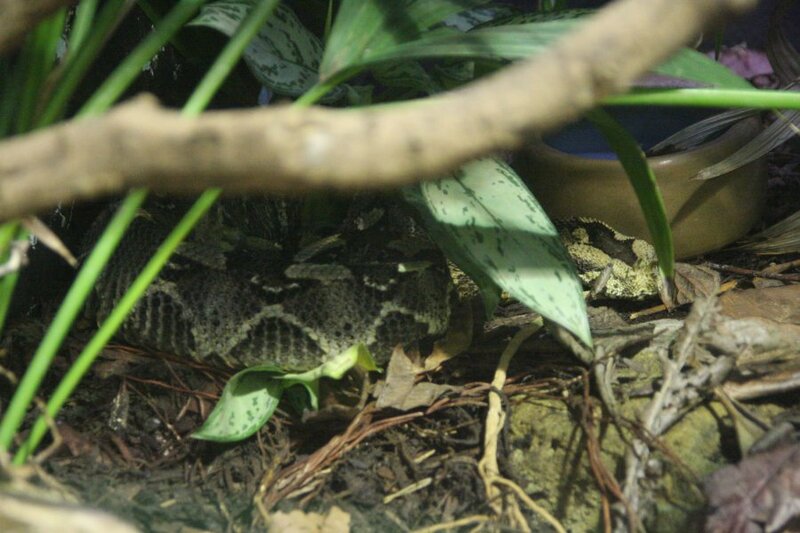 The Gaboon viper relies on the longest fangs and the largest venom yield of any snake to defend itself. The rhinoceros viper has smaller fangs and a lower yield of a fairly potent venom, which make it a little less dangerous (but still very serious). Fortunately, it is much more likely to hiss as a warning, with the loudest hiss of any African snake. European snakes; long-nosed viper. Although they are the most venomous in Eurupe, they are rarely seen, and prefer to flee rather than bite. Their bite can kill in some cases, but this is extremely rare, and their venom is only a little more potent than a British adder. False water cobra, named because like many snakes, it can flatten its body into a hood like a real cobra, but held lower to the ground. 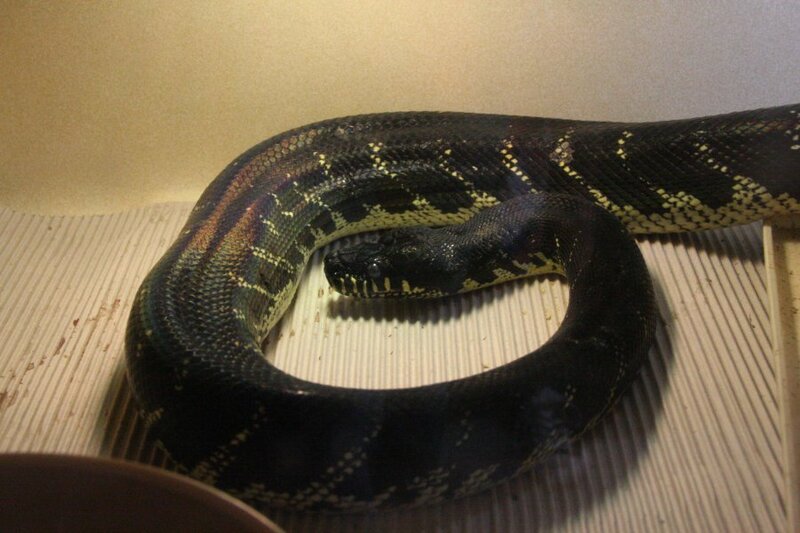 This one is in shed, causing its colours to be faded and its eyes to be very blue. This is a rear-fanged colubrid snake with a very mild venom that is not considered to be medically significant, and these are regularly kept as pets. North American snakes; Sidewinder rattlesnake, which uses sidewinding locomotion - a sideways sinuous body motion - to quickly climb loose surfaces like sand dunes. African tortoises; Radiated tortoise, like a giant version of the more popular (but somewhat specialist) Indian star tortoise. The skin is a little lighter. The stars on the side scutes do not normally have rays pointing towards each other, and the stars on the top scutes also do not normally have rays pointing towards each other. The highest concentration of bold rays on the maginal scutes and side scutes, point up and down towards each other, rather than sideways. (The top scutes also have most of their rays pointing towards the side scutes.) 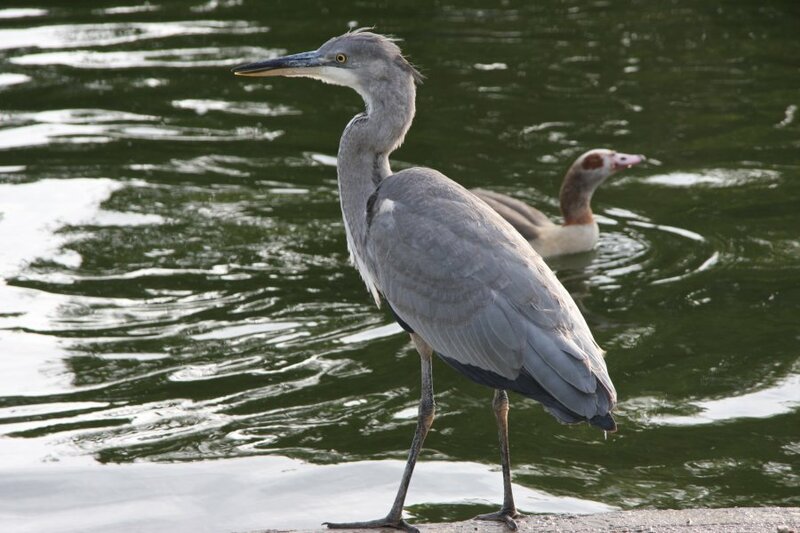 However, the species can be easily confused with each other. These are a protected species, however, and are far less common as pets. 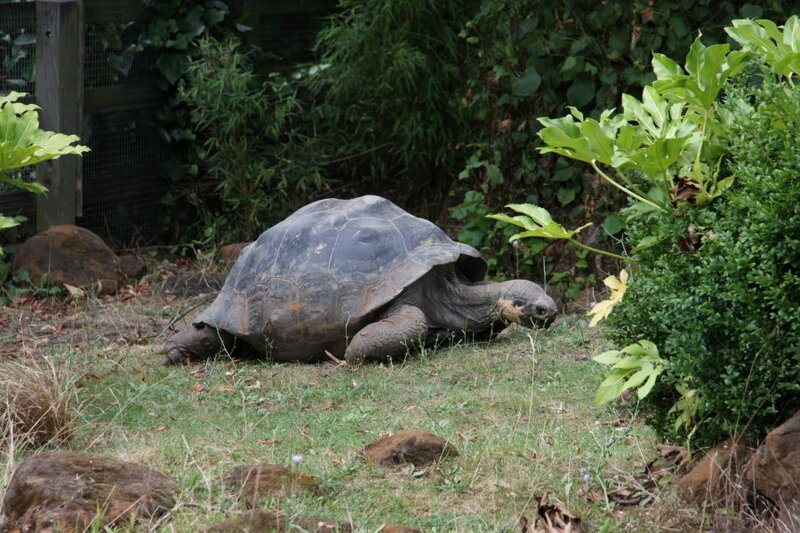 They are the second longest living tortoise on record, at 188 years. The tiny Egyptian tortoise. Closely related to the common pet Hermann's and Mediterranean spur-thighed tortoises, but rarely seen as a pet, as it is critically endagered in the wild. This is partly because of habitat loss, and partly because of the market-stall trade that took place before the international ban, and the current trade from tourists who do not realise that it is illegal to export them (without CITES certification). 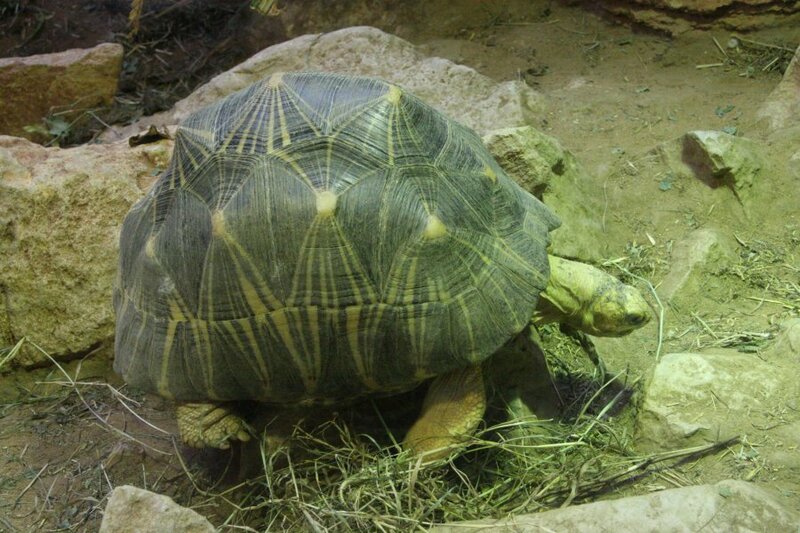 Mini soapbox rant: an indoor enclosure with artificial UV lighting is the right way to keep tortoises. 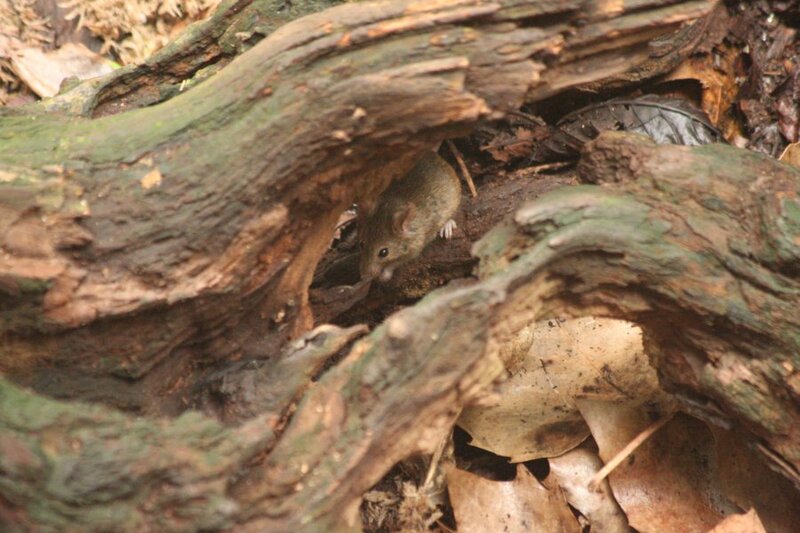 Unless you live in the same climate as their native habitat, you should not force an animal to live in your garden, though they can use it on days when the weather matches their preferred conditions in their natural habitat. Most pet tortoises came from the Mediterranean, but Britain is not in the Mediterranean. Tortoises on average live a far harder life when subjected to British gardens year-round, and several pet species were nearly wiped out in nature by over-collection due to the old approach, replacing a dead tortoise like a goldfish. Lack of heat and UV, and prolonged winters are the major problems (a bad diet of fruit is another). (Note also that this species naturally lives in a compacted sand desert, but tortoises can accidentally eat loose sand if their food ends up on it.) Even a 30 or 60 year life is not much for an animal that could live for 150. 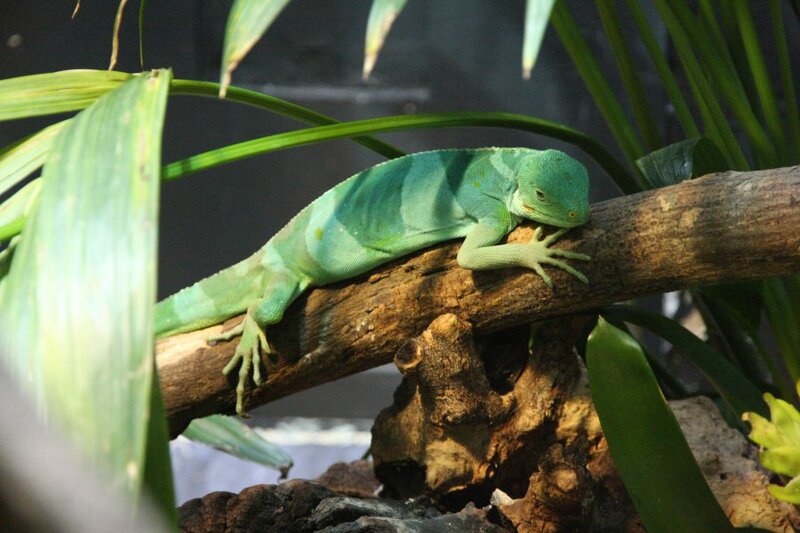 Reptile UV lighting was introduced 20 years ago, so the garden is no longer the only source. Thankfully, most modern reptile suppliers are much better informed than the old market traders, and require owners to have an appropriate habitat for the pets. The common pet species are covered by legislation requiring them to be sourced legitimately. Unfortunately, the legacy of decades of incorrect care still persists in British collective knowledge, and many tortoises still do not get this care. 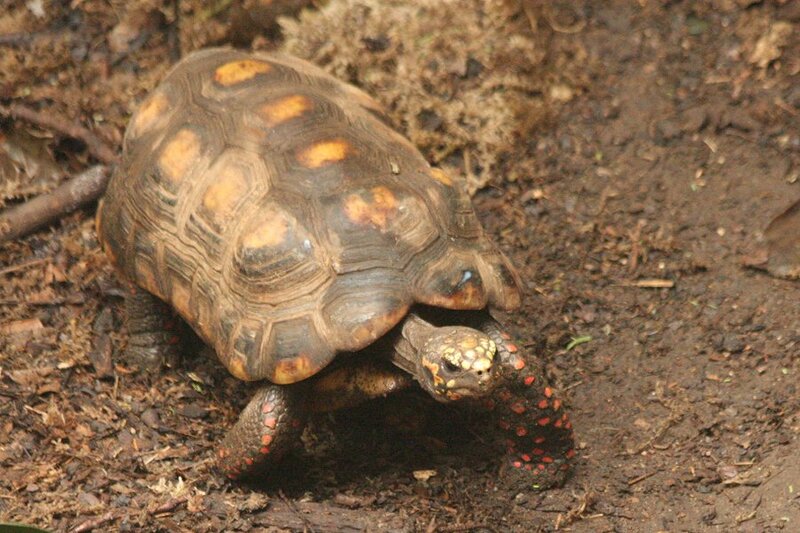 South American tortoises; Red-footed tortoise, my personal favourite. As well as their stunning colours (black, yellow and red when clean), these defy most of the rules of pet tortoise care. They need somewhat less sunlight than the more common pet species. They should eat fruit (most pet tortoises should never eat fruit). They should eat bugs (most pet tortoises should only eat plants). 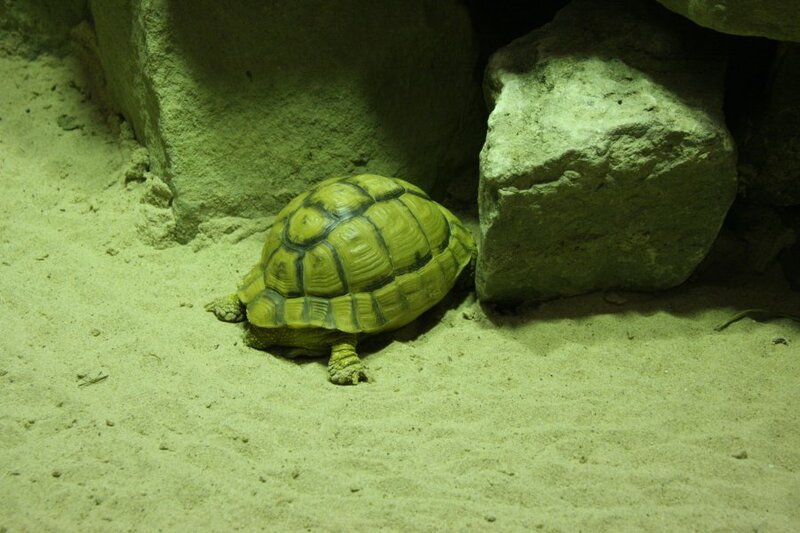 They need a humid environment (most pet tortoises need dry), with a choice of wetter and drier areas. They should live in groups (most pet tortoises are solitary), as they naturally seek the company of others. 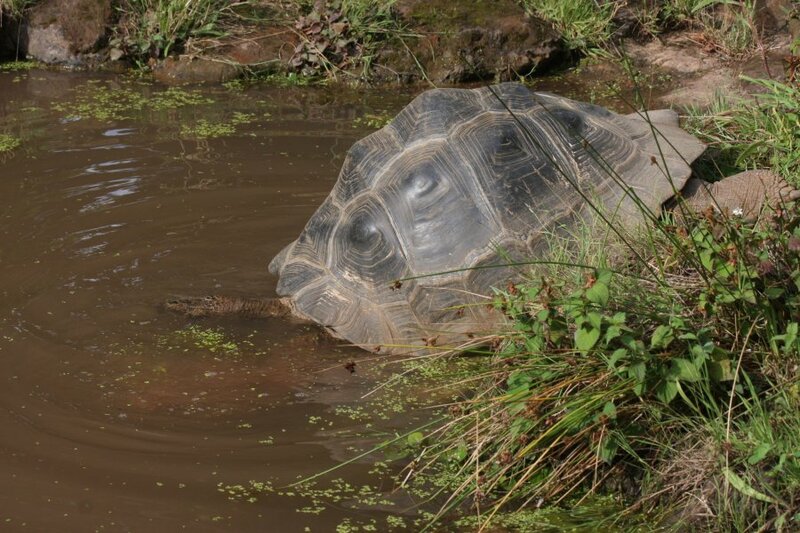 They can swim (most pet tortoises will drown). They are incapable of winter hibernation (some pet species can hibernate/brumate, but most cannot) but can aestivate in very hot weather. They still need the warmer temperatures, however. 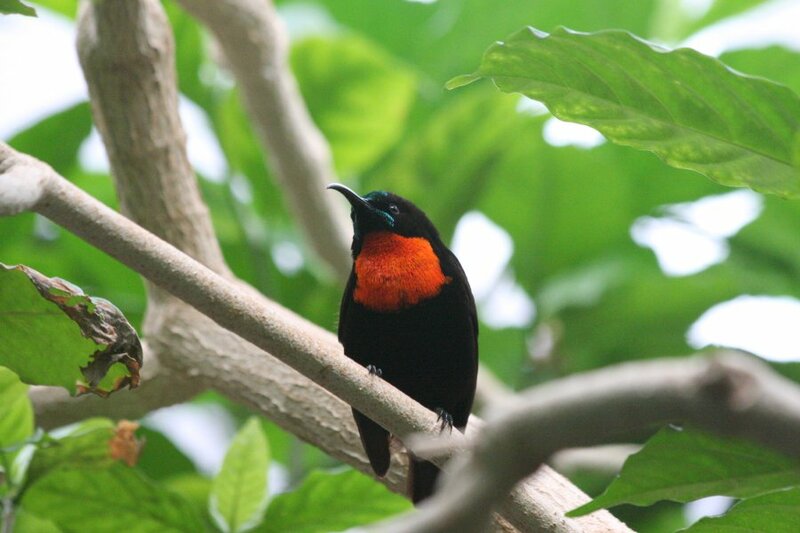 This one lives with the monkeys in the rainforest house and is the largest I have personally seen, with a shell about 50 cm long. The colouring suggests it is a Northeastern variant, probably from Guyana (like most of the pet stock), but the size suggests it could be a Southern variant. Galápagos tortoise munching on grass and weeds. 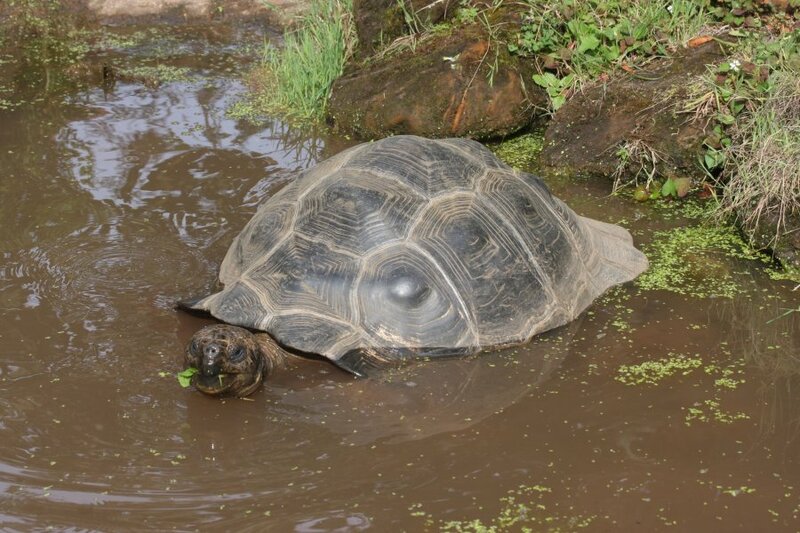 These are the largest of the tortoises, and one of the inspirations behind Darwin's works. 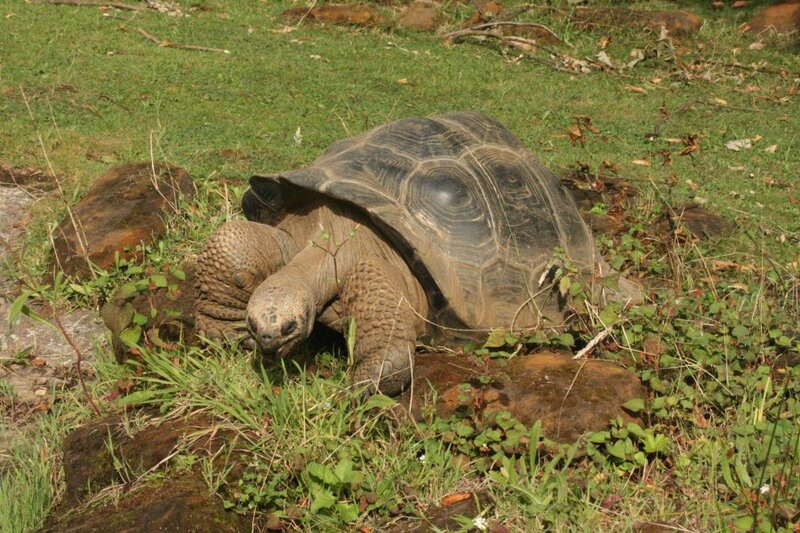 They are the third longest living tortoise on record, after the radiated tortoise, at 175 years. 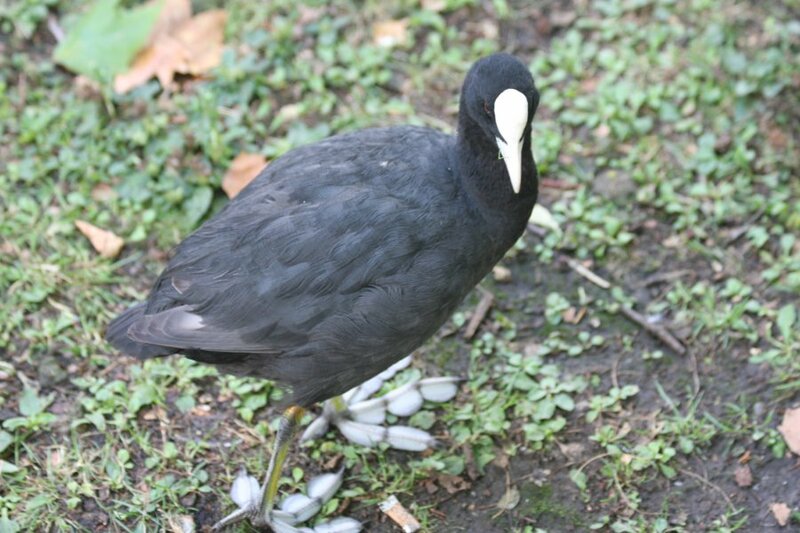 Each subspecies has its own adaptations to the island where it evolved, but are generally grouped into high and low arched shells (for bush or low-weed eaters). 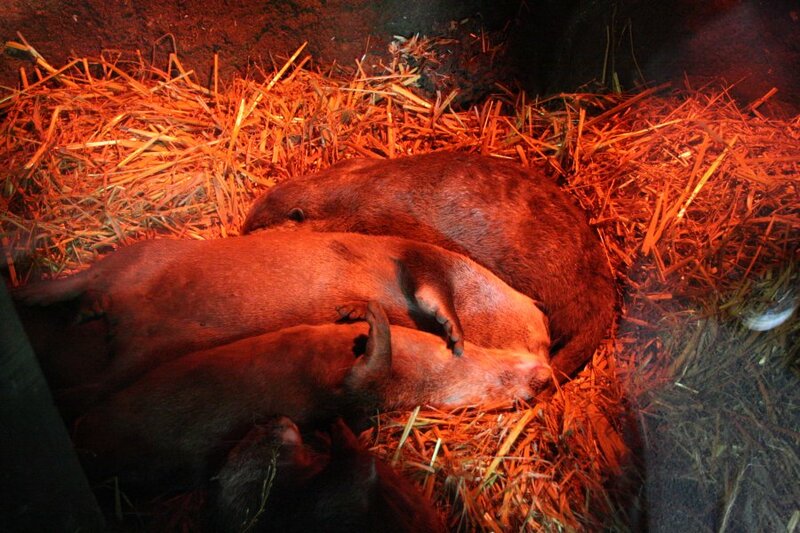 In captivity, they all look the same, presumably from hybridising, or perhaps we only get the low domed subspecies. "I don't know what you mean, I meant to do it like that". 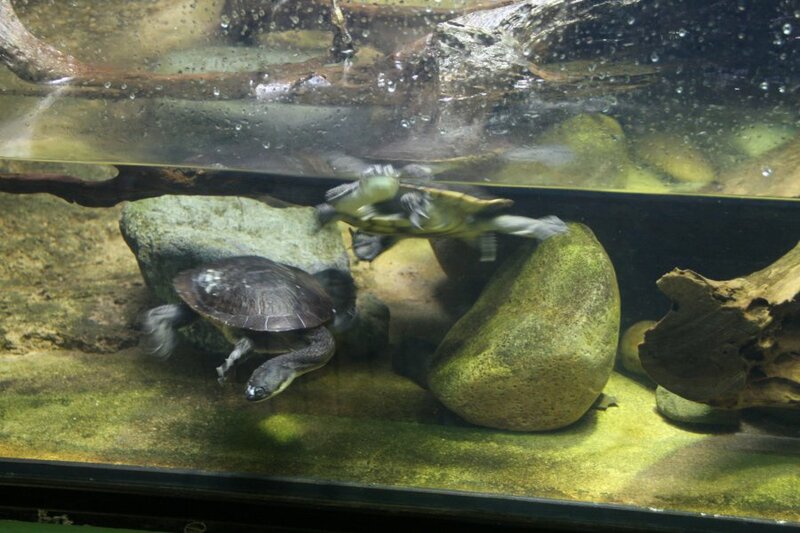 Asian turtles; Roti Island snake-necked turtle. 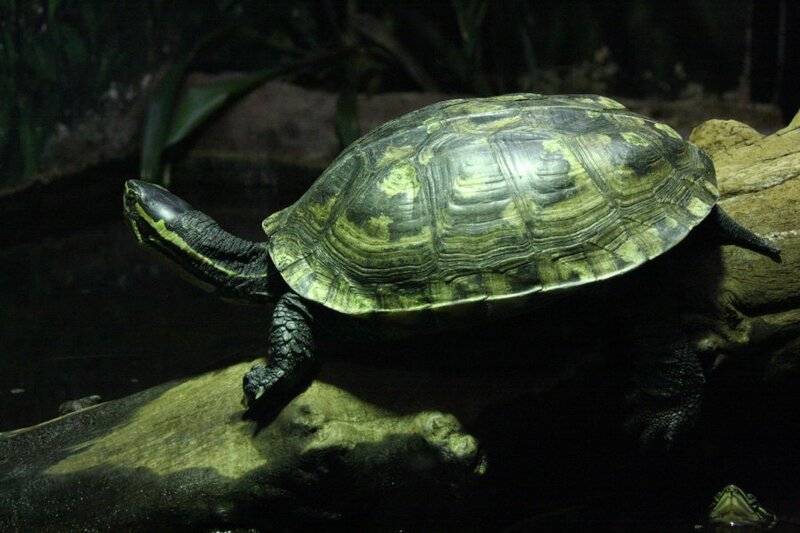 Annam leaf turtle, the Vietnamese pond turtle. Australian frogs; White's tree frog, one of the most popular pet frogs. Known for being hardy, and coping with mistakes, as well as tolerating regular handling. 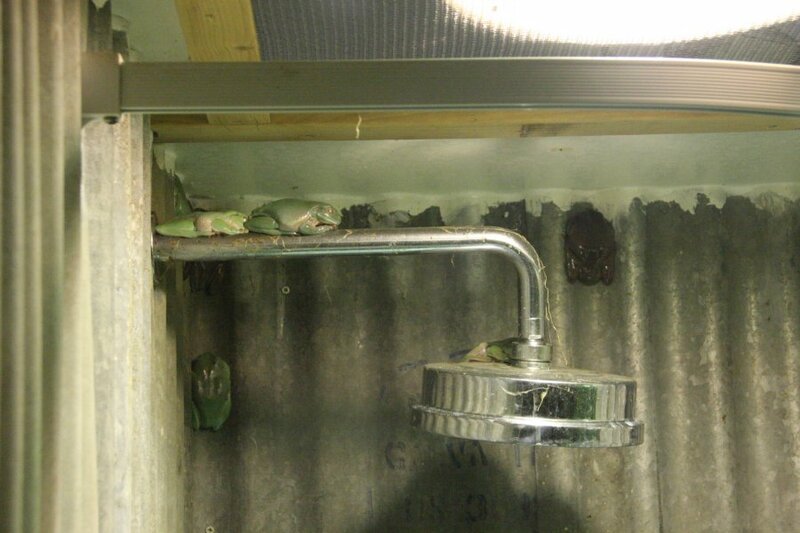 These are rather large for a tree frog, and have a distinctive low barking croak. 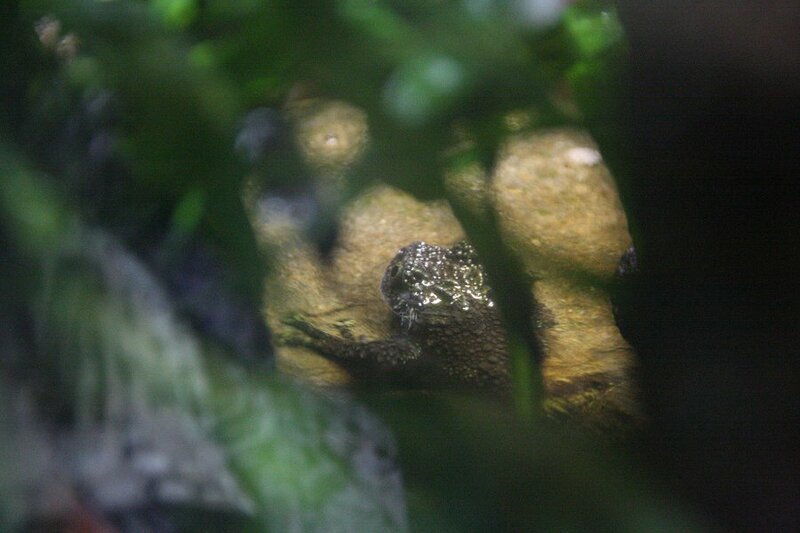 Asian frogs; Vietnamese mossy frog. African frogs; golden mantella. 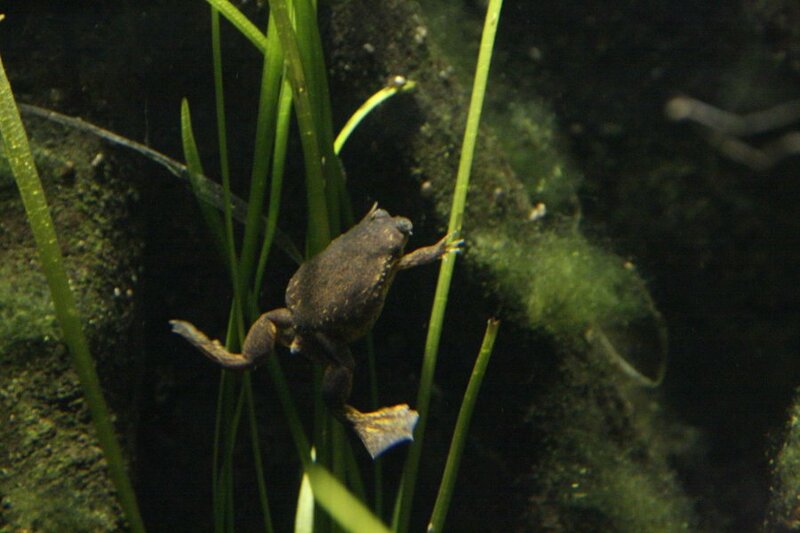 Critically endangered in nature, many UK zoos are taking part in breeding programmes of these attractive little frogs. 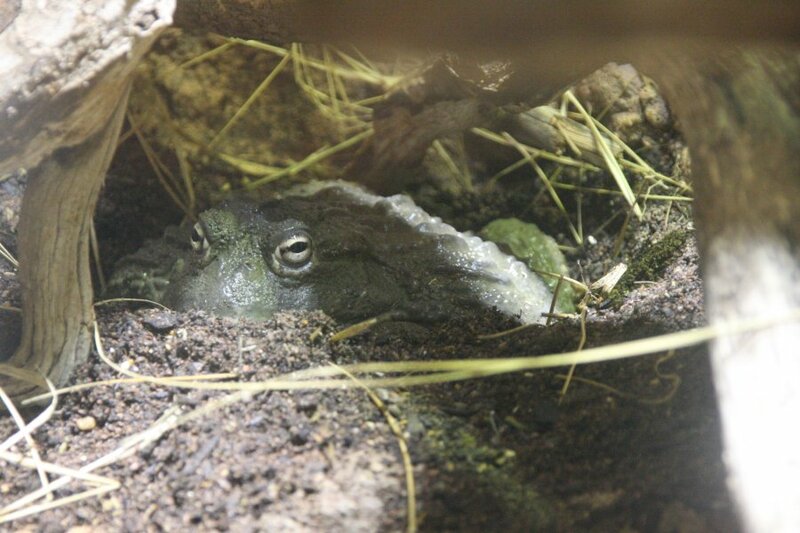 African bullfrog, the second heaviest frog. Uniquely for a frog, males are larger, at over 2 kg. 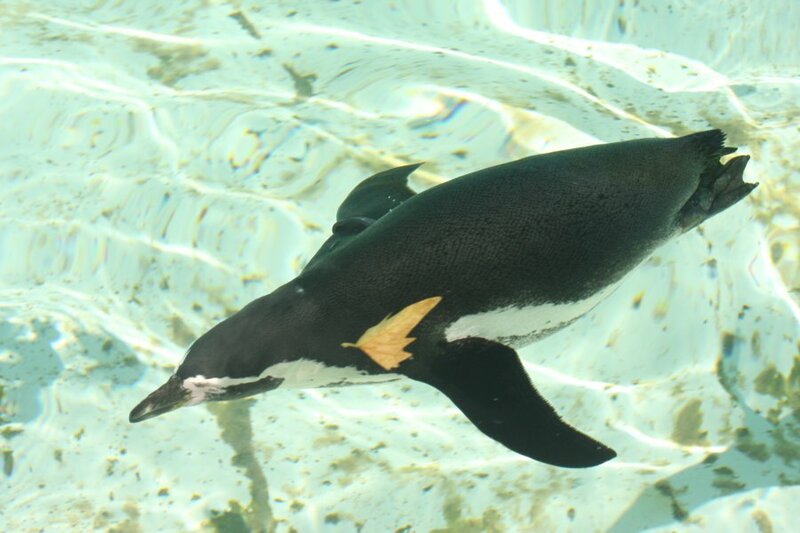 They have a long 40 year lifespan, reaching maturity in nature after around 20 years (largely due to the amount of time spent dormant in nature - this is often accelerated in captivity with less time spent dormant). 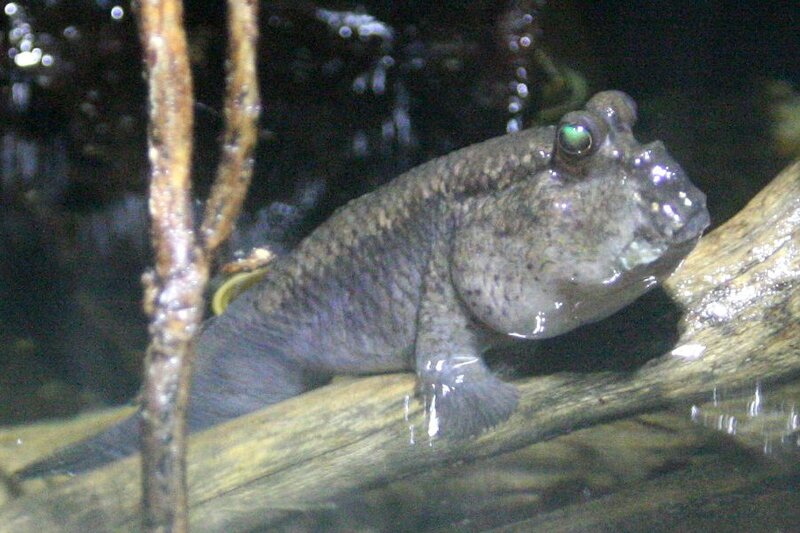 Lake Oku clawed frog, a critically endagered relative of the popular African clawed frog, native to just one single lake. Atlantic mudskipper, a small fish that walks on its fins on land, and breathes air. This is not an evolutionary ancestor of modern land animals, but another fish trying the same thing as our own acestors did aeons ago. Upside-down jellyfish, from the Indian Ocean and South China Sea. 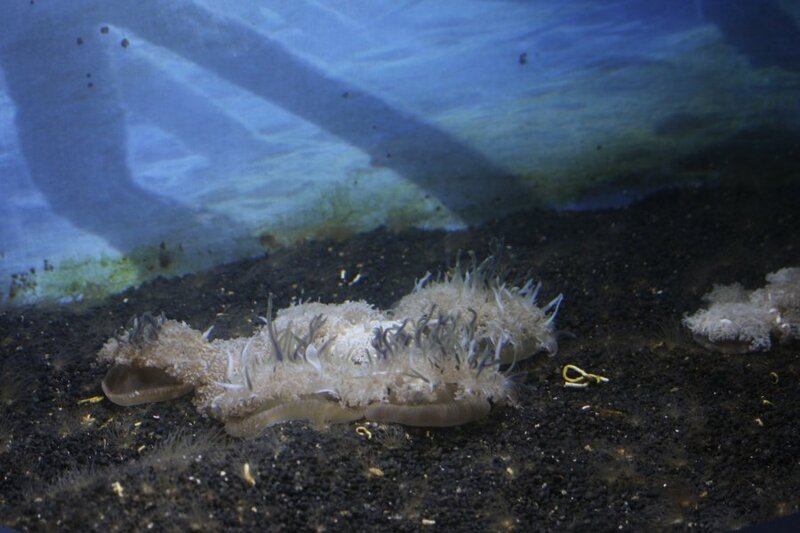 It spends most of its adult life upside-down on the sea floor like this. 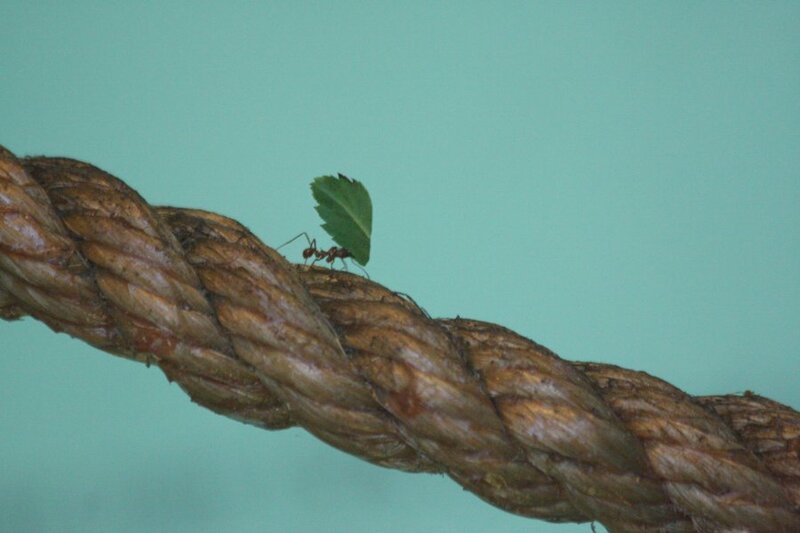 South American insects; leaf cutter ant carrying its precious cargo. The leaf will be used to feed the fungus garden, which in turn will feed the ants. 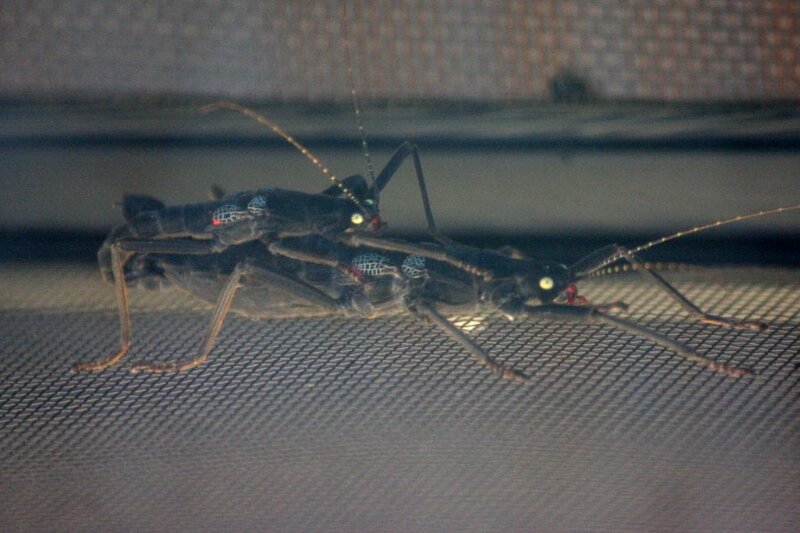 Golden eyed stick insects mating. The larger one is about 7cm long. Central American insects; bull's horn or giant peppered cockroaches. 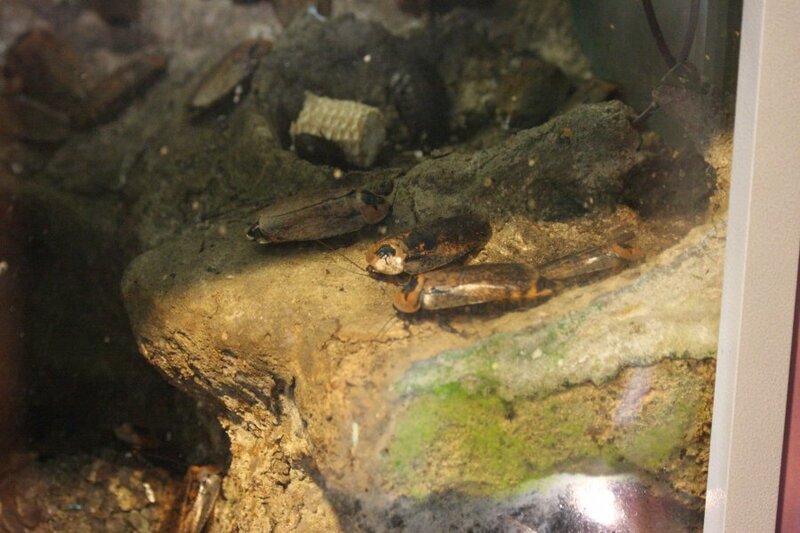 Percieved as dirty animals, cockroaches are the opposite; they help to clean up the dirt that others leave behind. 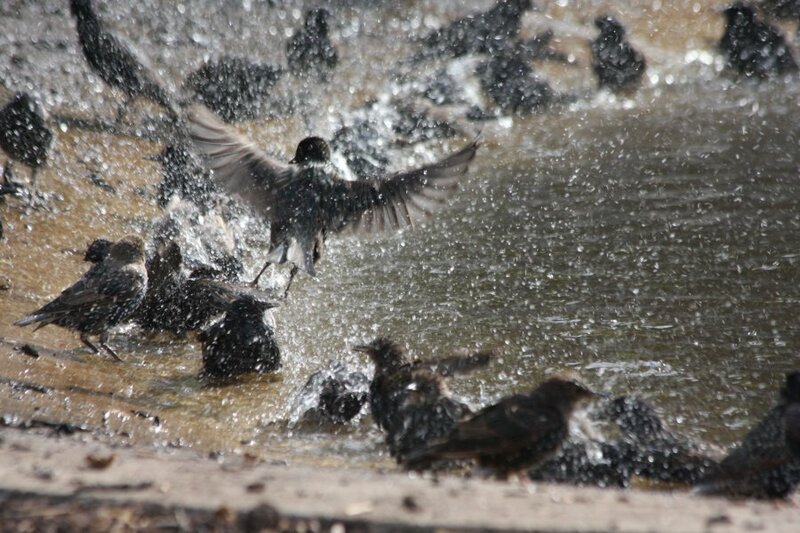 They are said to find humans so disgusting that if touched by a human, they will wash themselves afterwards. 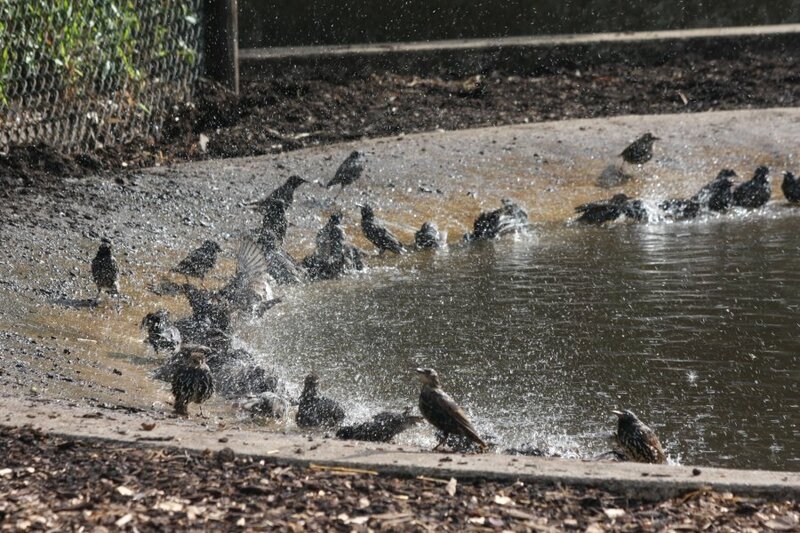 Starlings bathing at the Boating Lake in Regent's Park (outside the zoo). 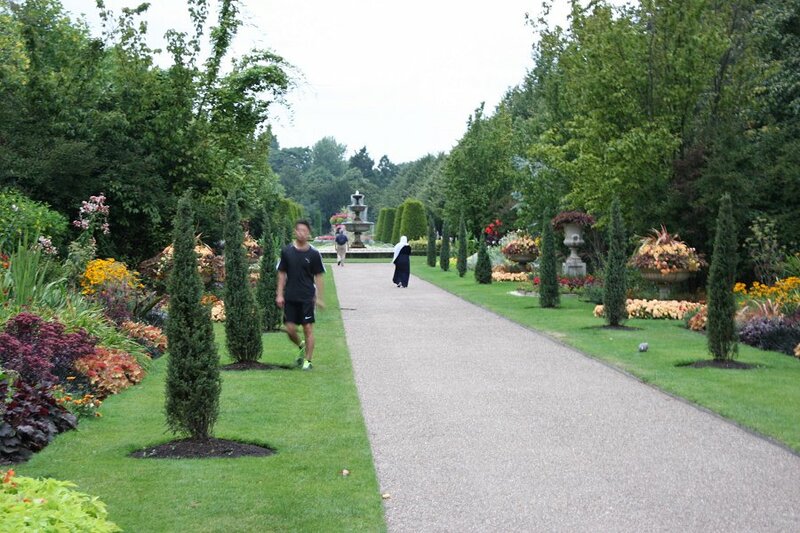 The Broadwalk at Regent's Park. 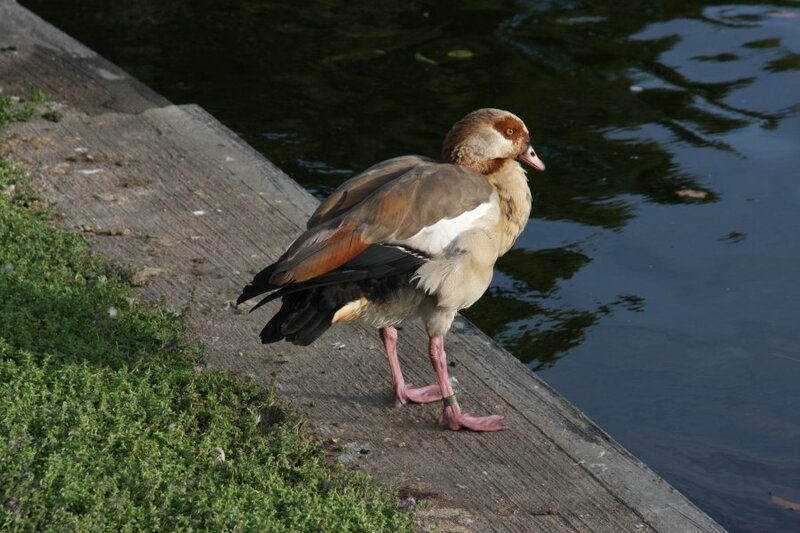 Egyptian goose, an ornamental duck/goose. 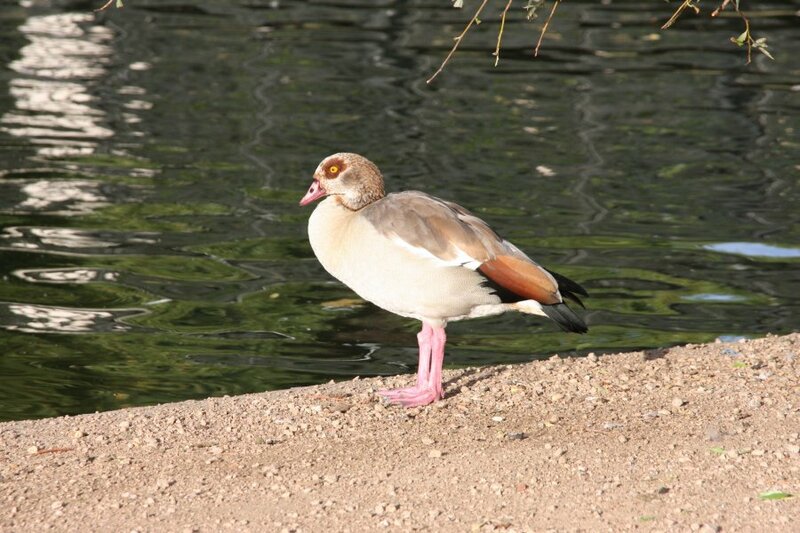 A relative of the shelducks, the Egyptian Goose is half way betwen a duck and a goose. 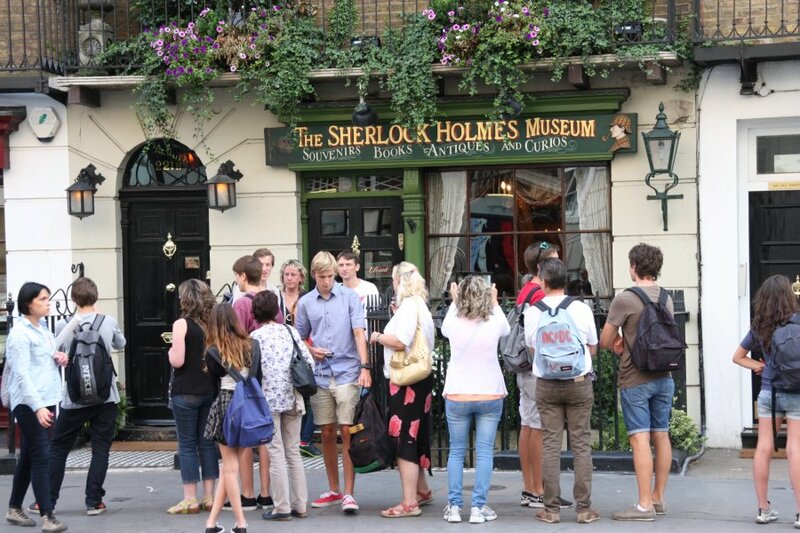 221B Baker Street. Sherlock Holmes - even if he had been real - could not have lived here though, as until 1932, the street was not long enough for number 221 to exist. This location was a different street called Upper Baker Street. The roads were combined and numbering reworked in 1932. 221 was owned by a bank (a bookstore as of 2015), who replied to fanmail (employing someone especially for the purpose). The museum, despite the number above the door, is actually located at number 239. The letter B would also not have existed, since the bank had no sub-residence. Fictional bubble; burst. The hotel (and I use the word very loosely) we stayed at for the first night, with this room costing us £88 per night for a family of 3 - towels and WiFi cost extra. 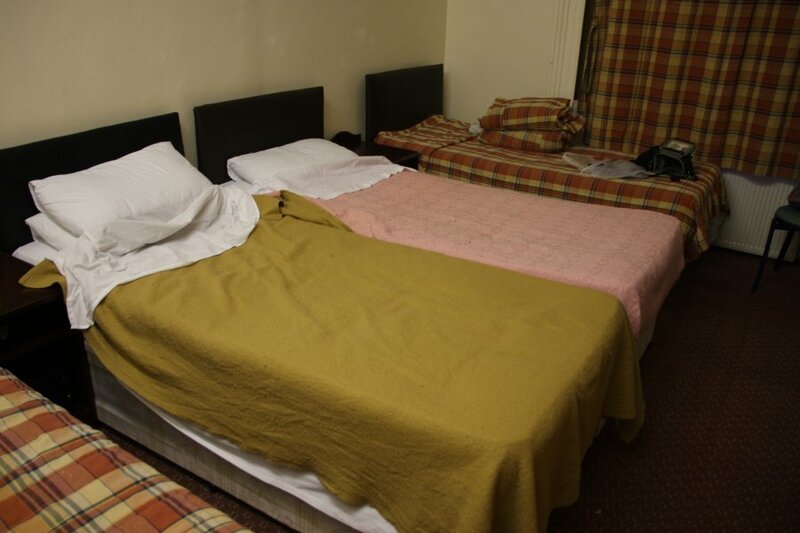 £84 could get a 4 star hotel room for the same family, with high quality breakfast and free WiFi in Cardiff. The quality was lower than a basic bunkhouse, nothing to shield guests from the noise of the street or each other - guests shouting through the night and no staff asking them to keep quiet. The shared toilets (one of which was liberally decorated with the throughput of a previous guest) were smaller than a cupboard, forcing you to straddle the toilet bowl to close the door. The shower was separated from the toilet by a curtain and small wall of badly fitted wood board, with the water flooding over the toilet floor. The mould had taken over. Whenever the toilet was flushed by a guest, all the water pipes in the building would scream until the toilet had refilled. But it did have a TV in the bedroom and a working door lock. And a sink with no hot water. And the most uncomfortable blankets known to mankind - similar to sleeping under wire wool. 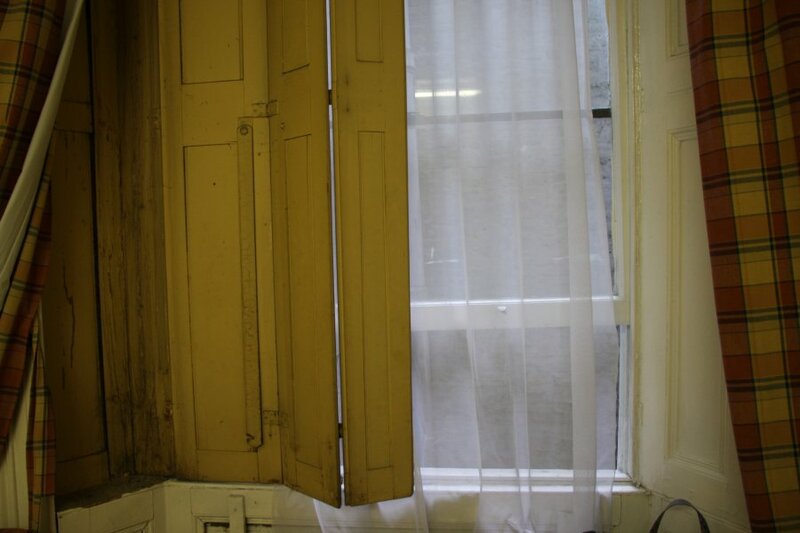 The curtains did not block the light, and one of the shutters was painted open and couldn't be closed. The single glazed window did not provide any insulation for either heat or sound. Nothing appeared to have been maintained, seemingly in several decades. I have stayed in a shed with a sleeping bag on a snowy night in Snowdonia, and would have preferred it to this. For breakfast, there were cornflakes and a single plate of toast per table (but with no personal plates for buttering and eating your toast), coffee and tea and no other drinks (great for children, right? ), on the table whether we wanted them or not, and thrown away when not used. Bizarre. The tables could barely fit one person, let alone the three of us, but the tables had 4 seats. 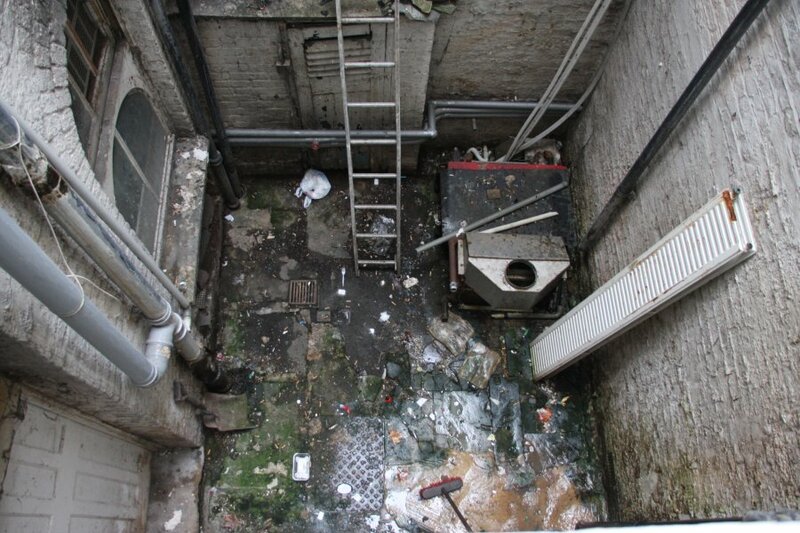 View from our hotel window, with a broken drainpipe that noisily splattered water constantly. That is not the ground. 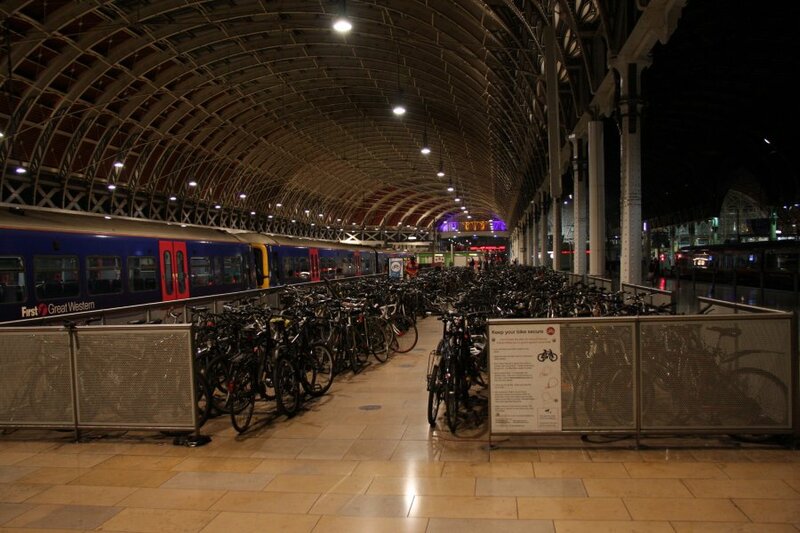 It is the roof of a major cut-and-cover underground line from the nearby Paddington Station. 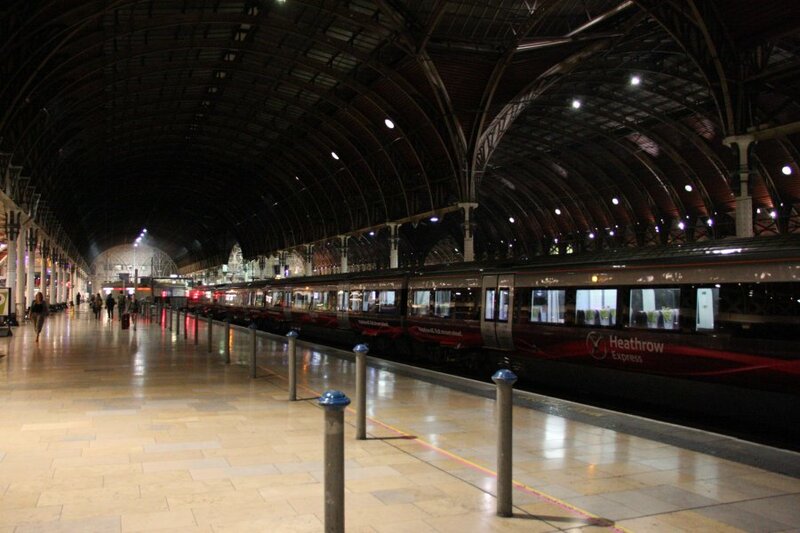 Every time a train went past, the whole building shook, making it impossible to sleep. The worst hotel we have ever stayed in. We abandoned the hotel at the start of the second night, and went to a Premier Inn instead. Unfortunately, we accidentally left some clothing behind in our rush to leave. By the time we realised and got back to the hotel, the staff had thrown it away. 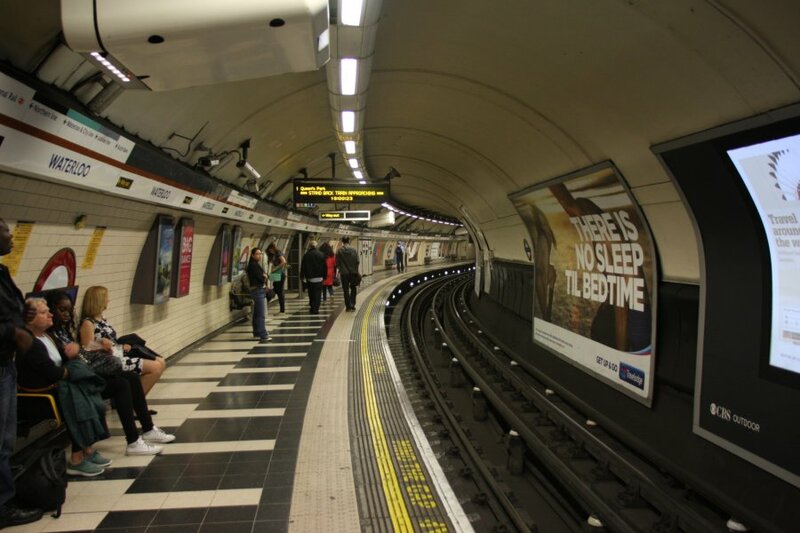 Don't try to save money in London. Use Premier Inn. Triple glazing and air conditioning. 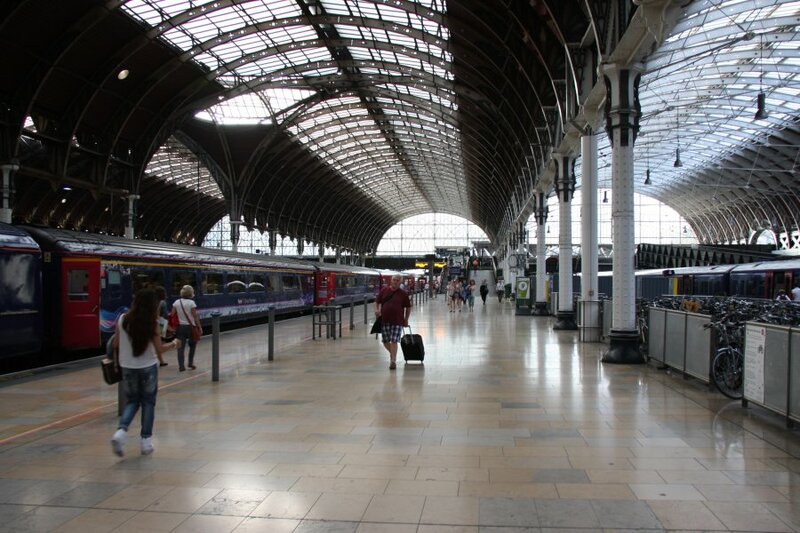 The grand arches of Brunel's Paddington Station (yes, the very same one from the Paddington Bear stories, amazing! ), built in 1854. The four arches are 210 metres long. The widest arch is 33 metres wide, built between 1906 and 1915. 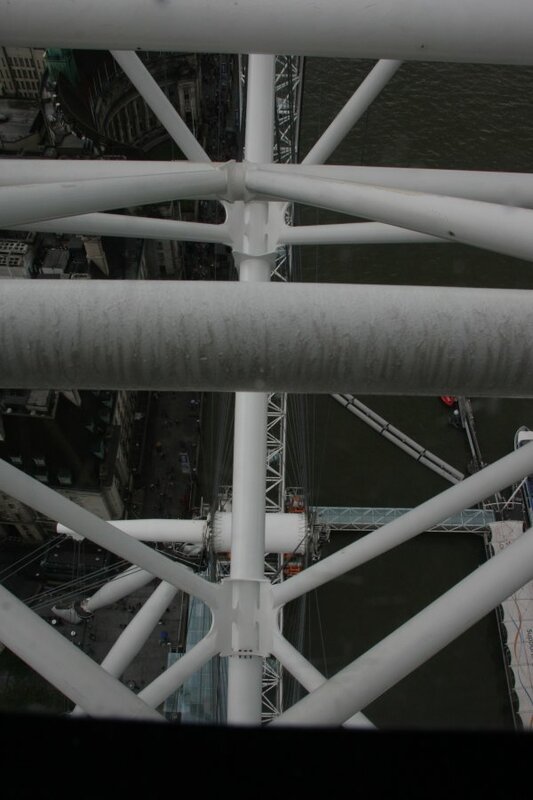 The original arches are 21, 31 and 21 metres wide respectively. Yes London, nice try, but Amsterdam has you beat, hands down. 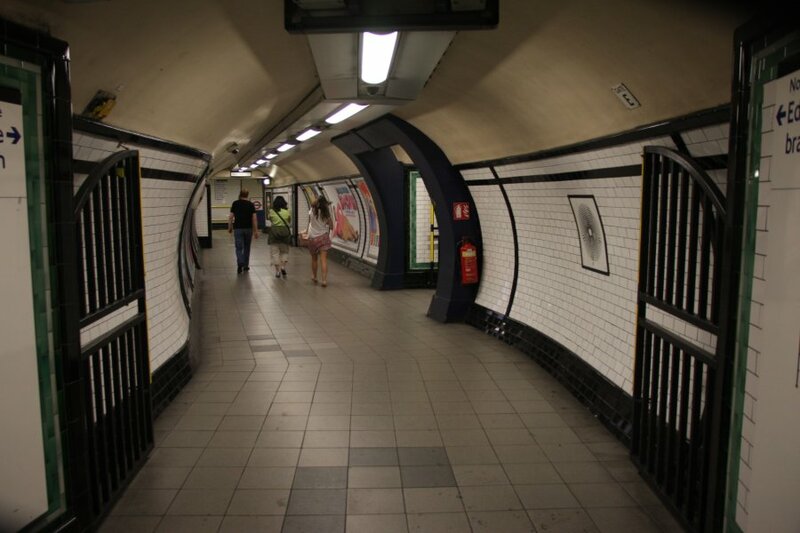 Great Portland Street on the London Underground's Circle Line. This is one of the cut-and-cover lines; surface buildings are demolished (or supported), the ground is dug open, walls are inserted, a roof is added and buried, roads and buildings are rebuilt. This is a messy, wasteful way to build underground lines, but apparently was an easier and lower cost approach, despite all the rebuilding required. Lines built this way cannot cross each other as they sit just below the surface. They also end up bumping into other utilities such as sewers and gas supplies, which all need to be diverted or rerouted. 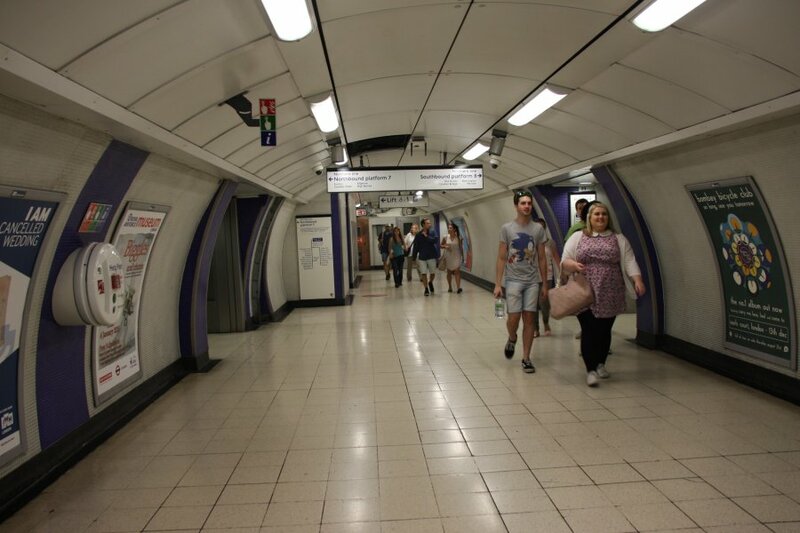 Tunels between the lines at King's Cross St. Pancras, built from circular bores of various sizes. 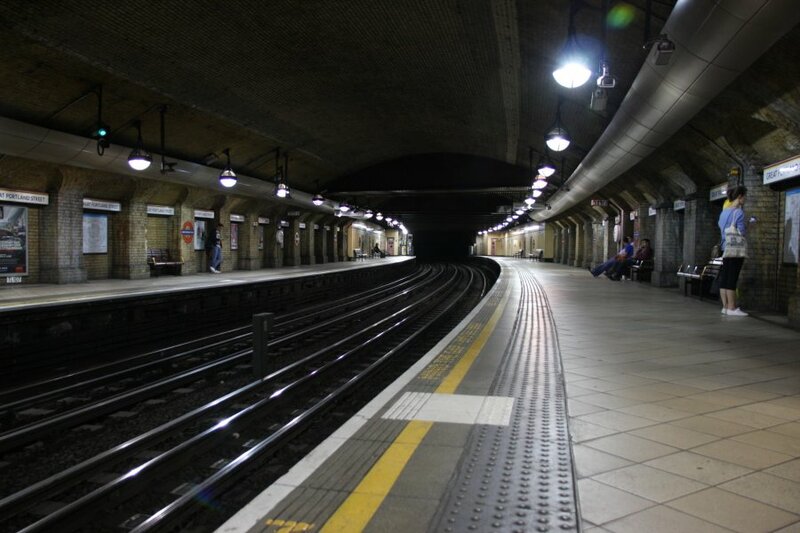 Deeper lines run in bored tubes, with larger bores used for platforms like this one at King's Cross St. Pancras. 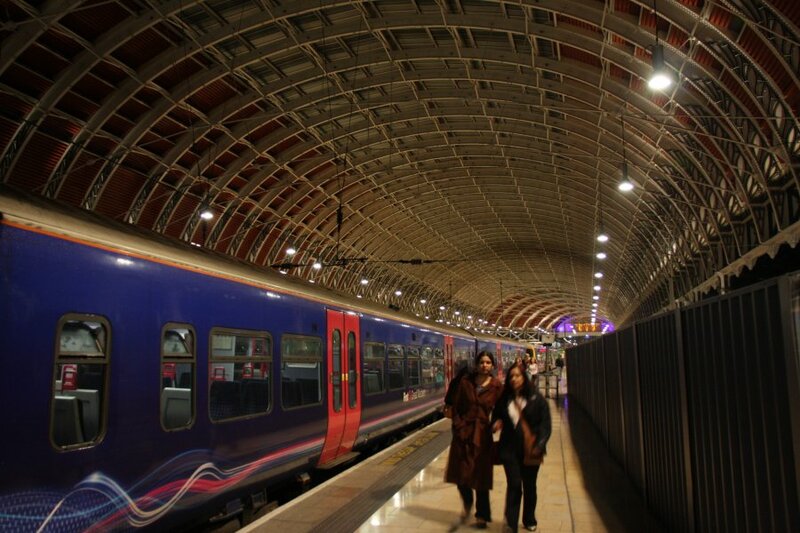 Trains are built to very fine tolerances, perfectly sized to fit through the tunnels. These bored lines required more tunnel engineering, but can move up and down as needed to pass each other, and avoid other utilities. They can also pass safely below the foundations of city buildings. Seen in the distance at Euston station is the smaller bore used for the train tunnel itself. Artistic sweeping curves at the stations are commonplace. 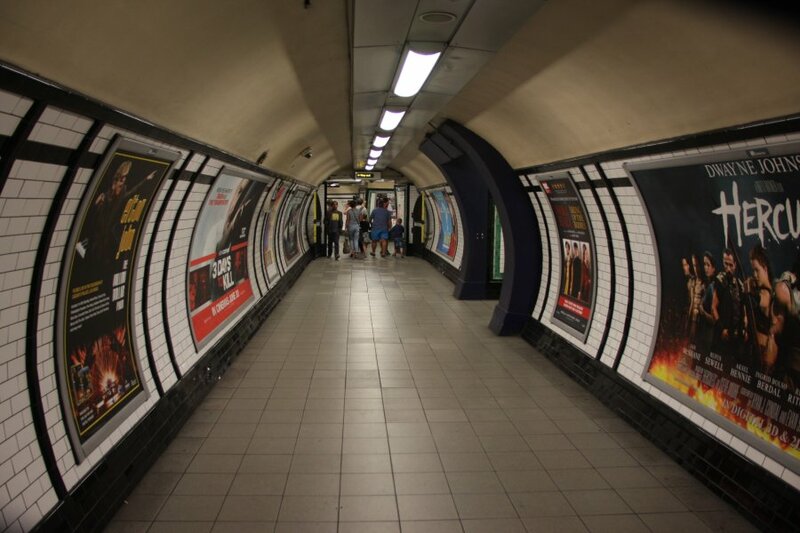 With so many other tubes and services to avoid, and awkwardly placed surface stations, passenger tubes are quite lengthy, filled with junctions, almost all styled with the characteristic tiling and advertisements. This is at Camden Town. Honestly, this is a different place - note the bend in the tunnel. 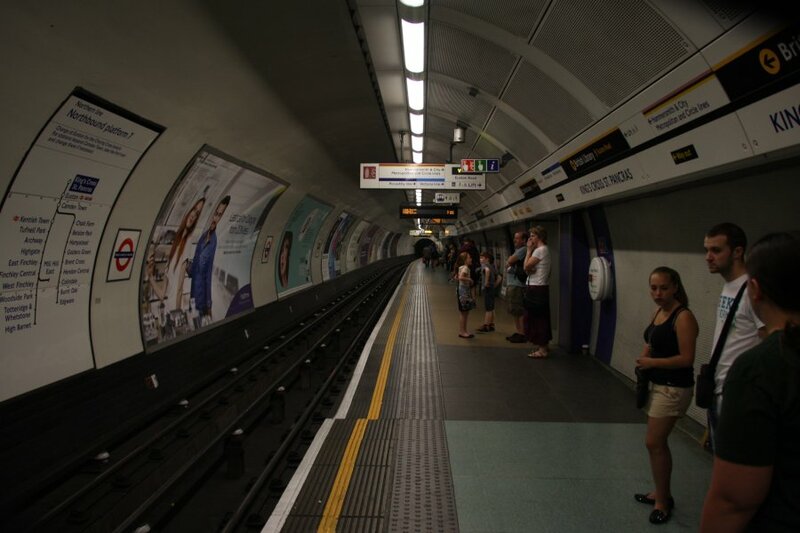 Those gates are a little odd and undersized, but this is a circular tunnel, so it is not possible to have gates that are the right size for the tube, or they wouldn't be able to open like that. 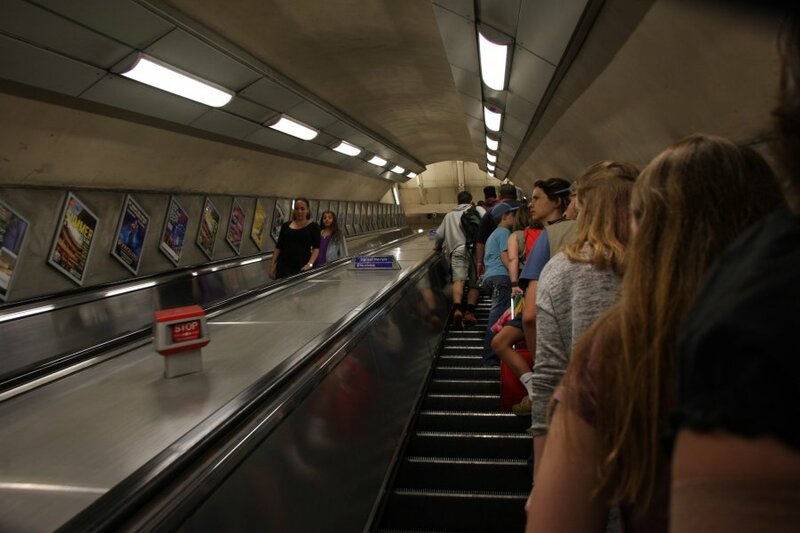 With such deep tubes, escalators (sometimes several steps) are needed to get back up to street level. 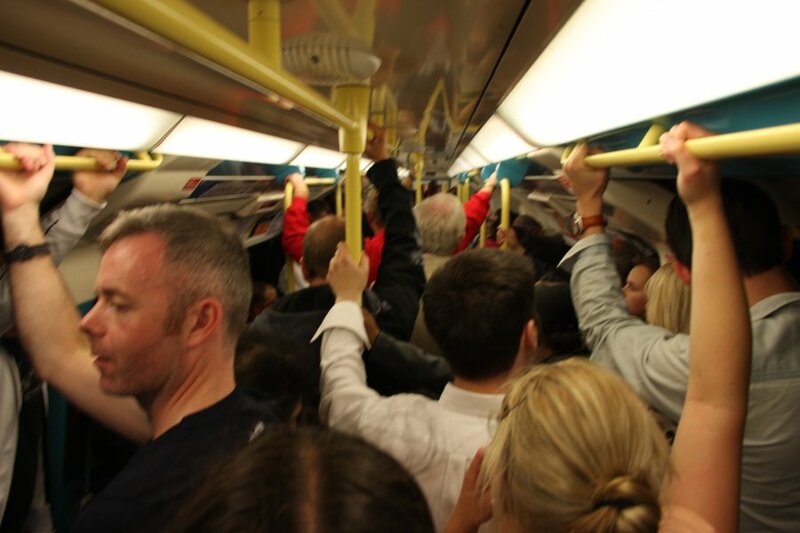 Commuting in a sea of armpits during rush hour, at Victoria Station. 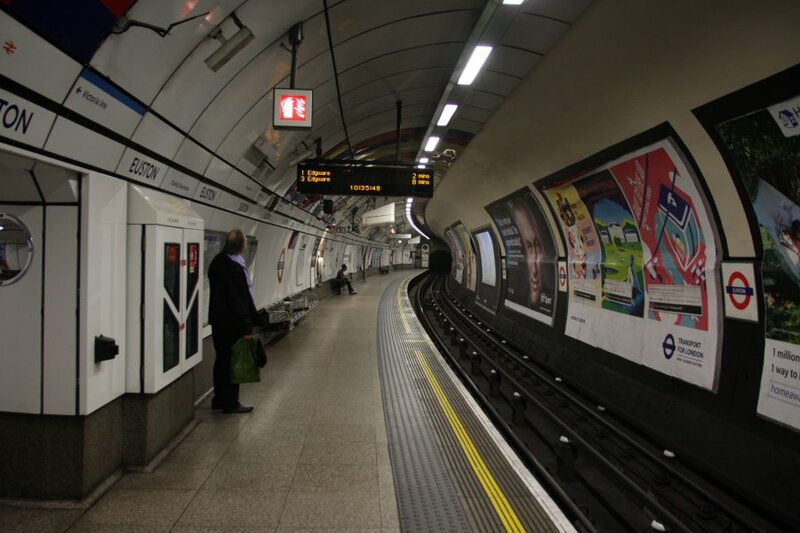 A last view of the deep tube lines, at Waterloo. Mind the gap. Our visit coincided with the 100 year anniversary of the start of World War I. 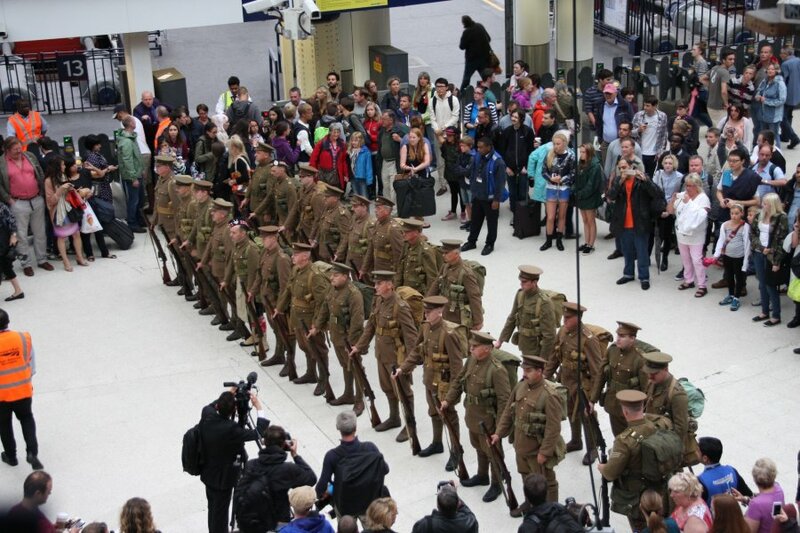 The first soldiers from Britain left from Waterloo Station to head to the front in mainland Europe, with their journey re-enacted here. 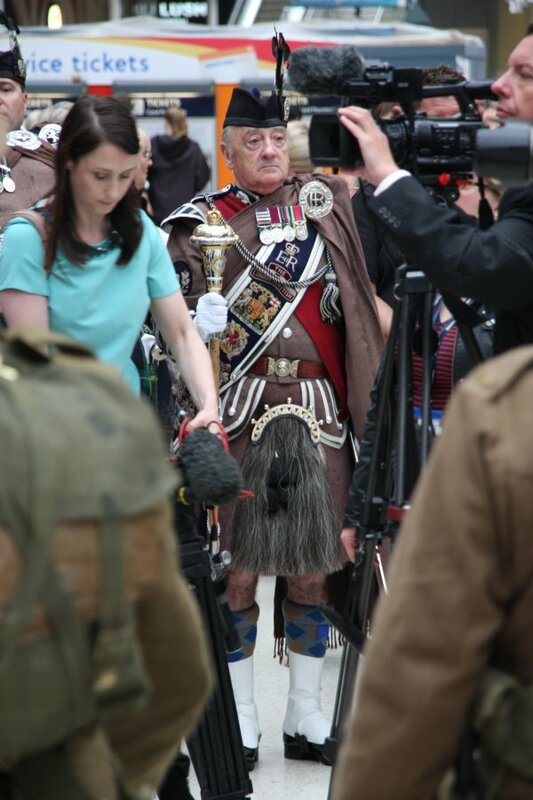 Looks like a Highlanders uniform. 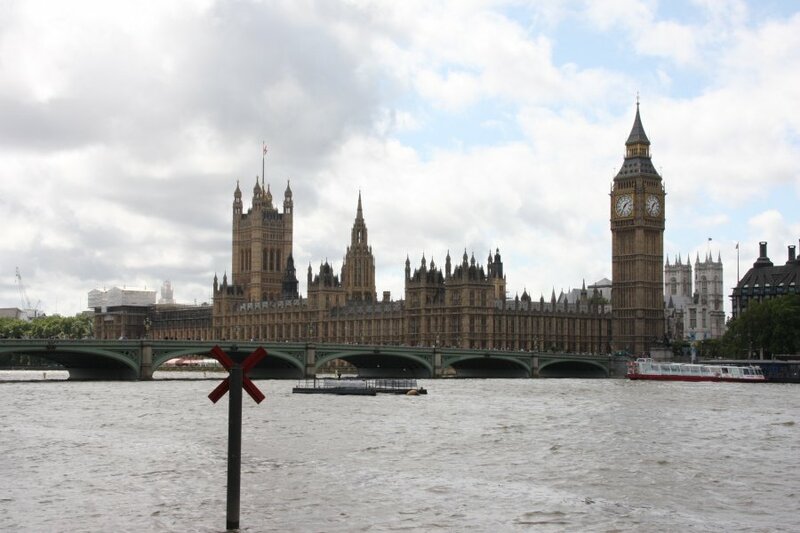 The Palace of Westminster, also known as the Houses of Parliament, the seat of the UK government. 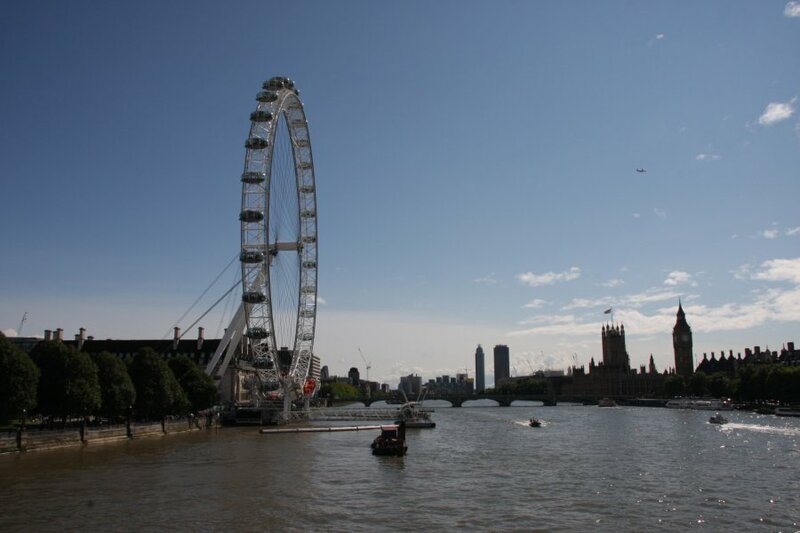 The tower is the Clock Tower, which houses the famous Big Ben bell. 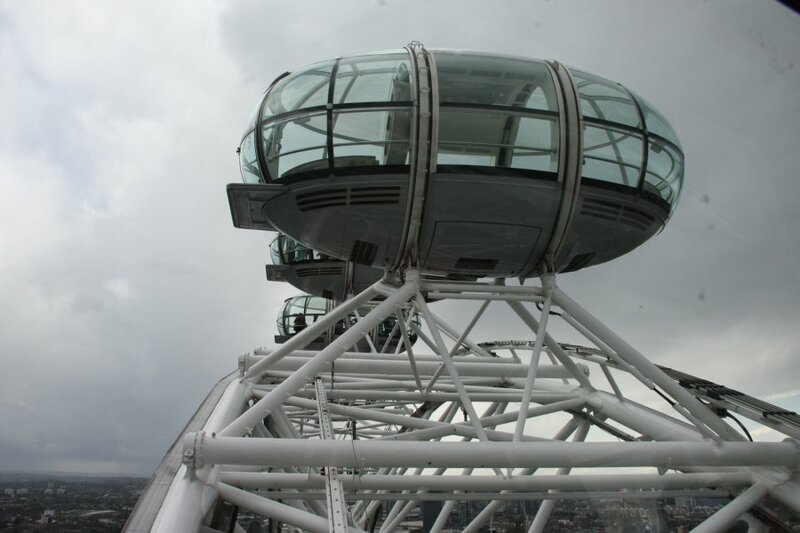 The London Eye, a giant Ferris wheel (without the stomach churning speed of a proper Ferris wheel). 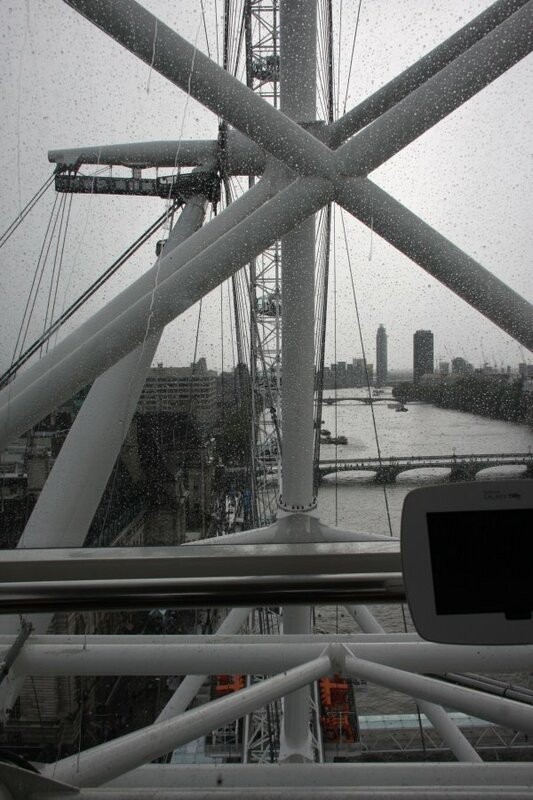 The wheel is 120 metres in diameter, but the supports make it 135 metres (and a few metres more to the river). 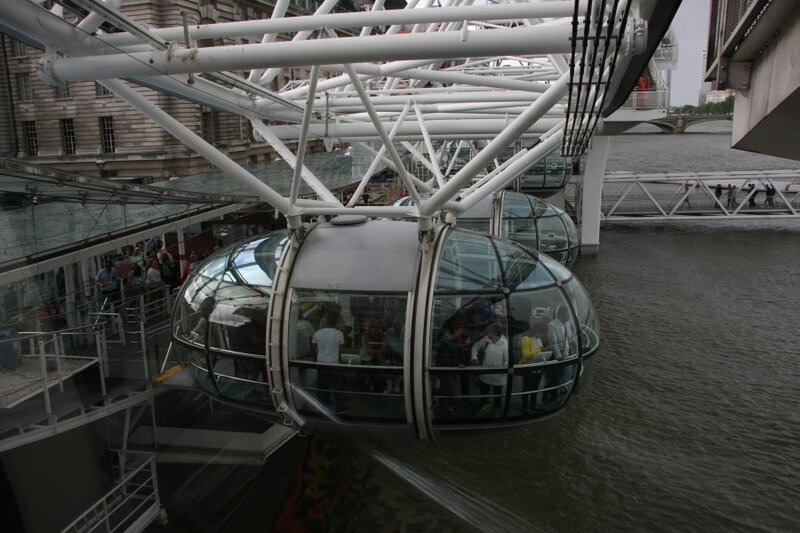 The wheel never stops, so it moves very slowly to allow people to get into a capsule while it is still moving. Britain doing what Britain does. Central axle and A-frame structure. 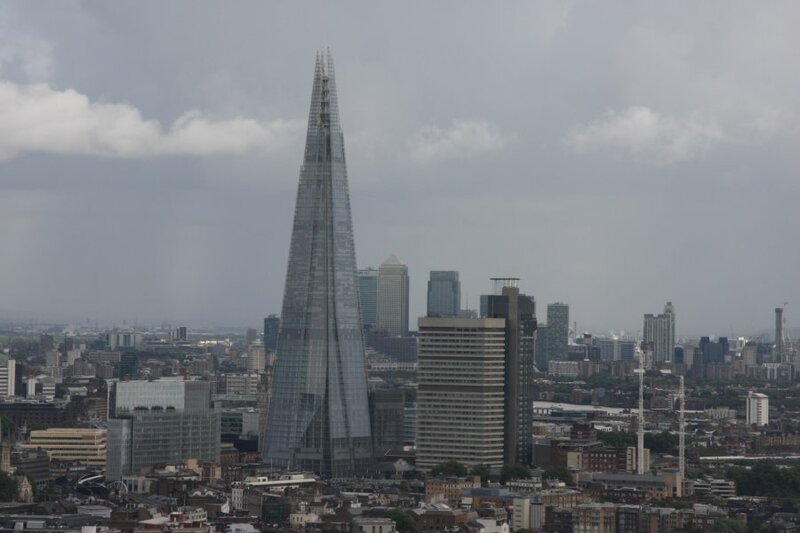 The Shard, tallest building in the UK at 309.6 metres (the Emley Moor transmitting station tower is 20.8 metres taller). Behind it is the previous UK record holder and now second tallest building in the UK, Canary Wharf's One Canada Square, at 235 metres. 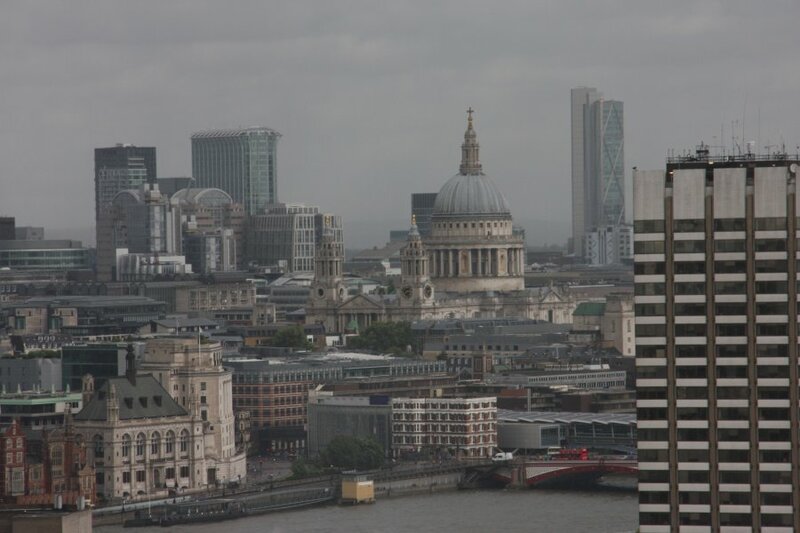 St. Paul's Cathedral, and the famous Dome of St. Paul's. 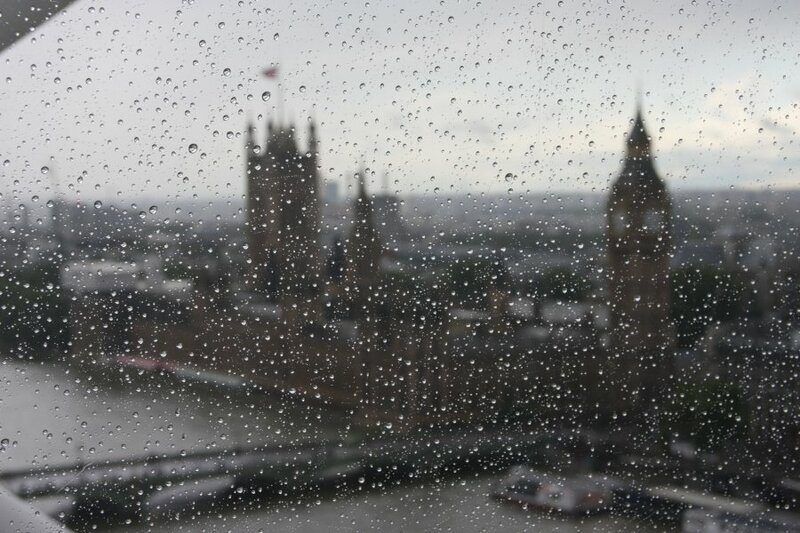 The Palace of Westminster through the rain. 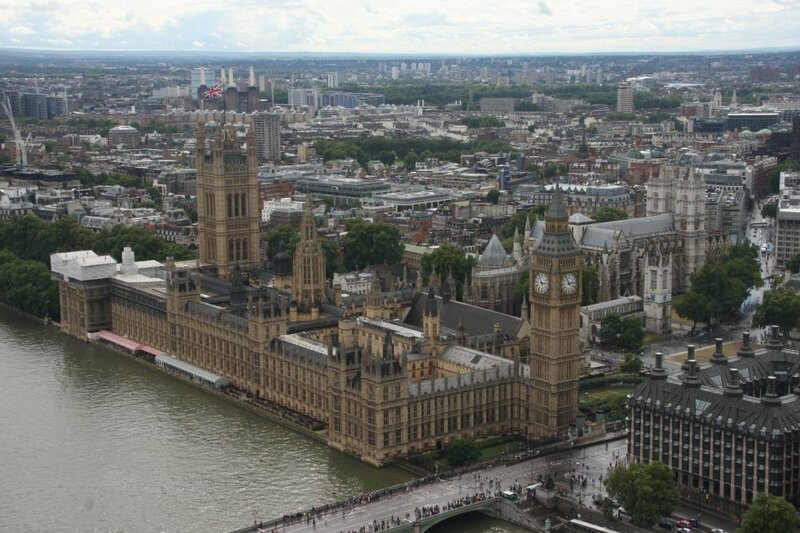 The Palace of Westminster, with Westminster Abbey to the right. 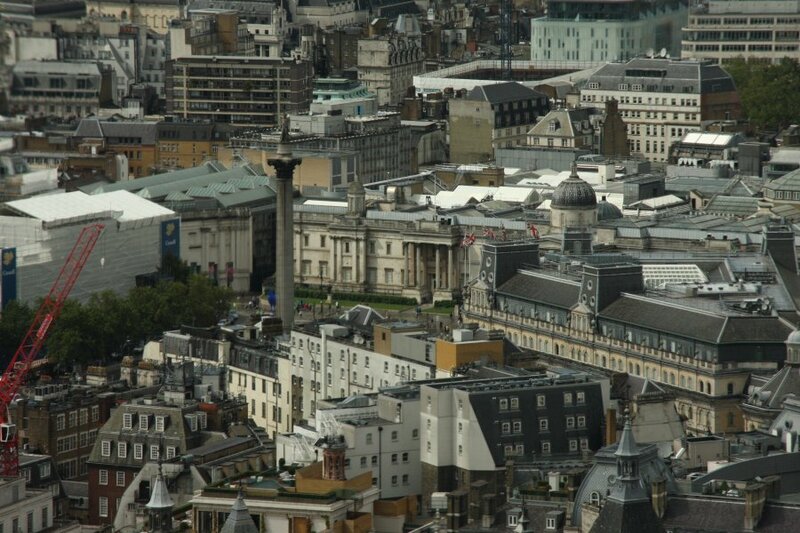 Westminster Cathedral can be seen in the distance as some green domes on the right edge of the picture. 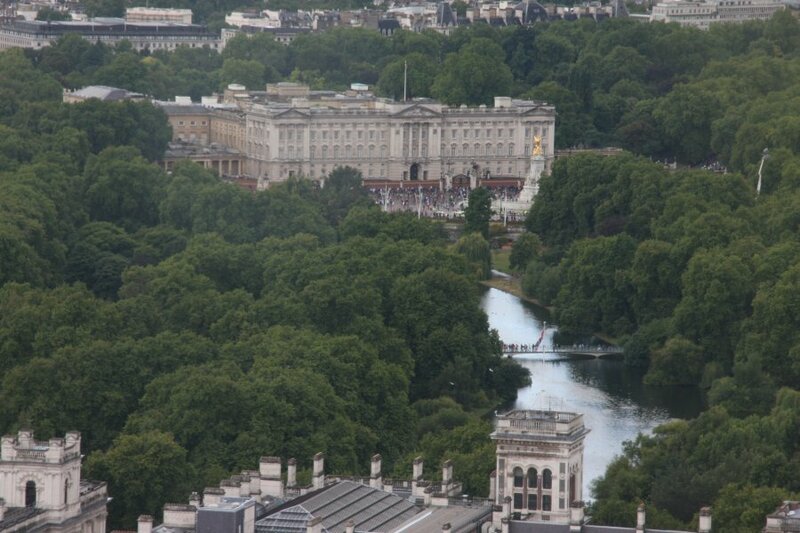 Buckingham Palace, home of the Royal Family, seen over St. James's Park Lake. Looking down, about 140 metres to the river. 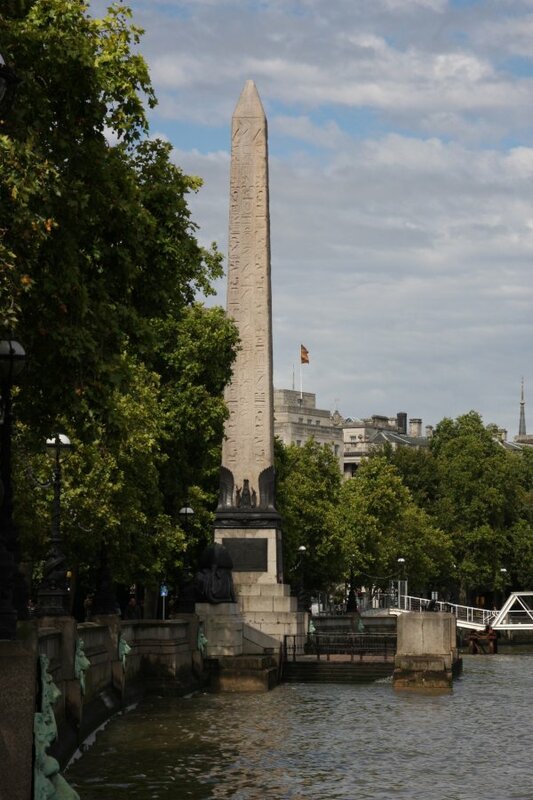 Cleopatra's Needle, a 3465 year old Egyptian Obelisk (made about 1500 years before Cleopatra's time), originally commissioned by Pharaoh Thothmes III and placed at Heliopolis. 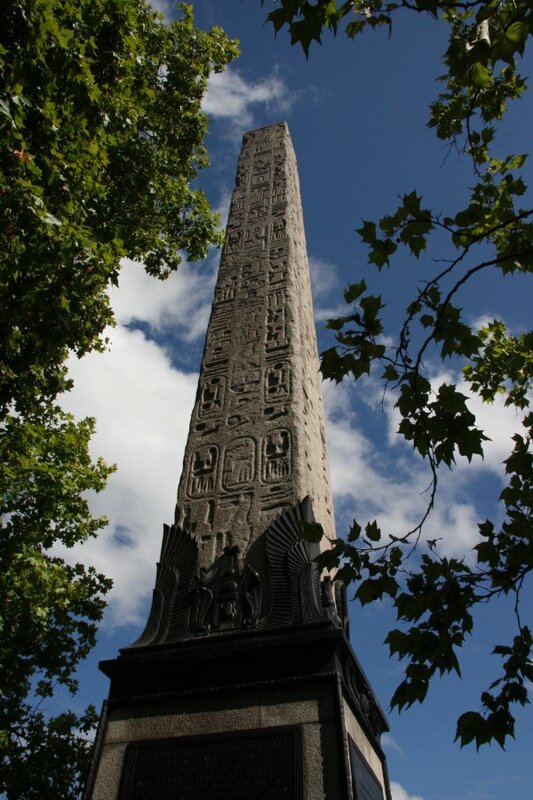 It is one of three such obelisks, the others of which are in Paris and New York. The hieroglyphics are about 3250 years old, added under instruction of Rameses the Great to commemorate his victories. It was moved to Cleopatra's Alexandria city by the Greeks in 12 BC (after Cleopatra's reign), following which it fell and lay there for centuries. 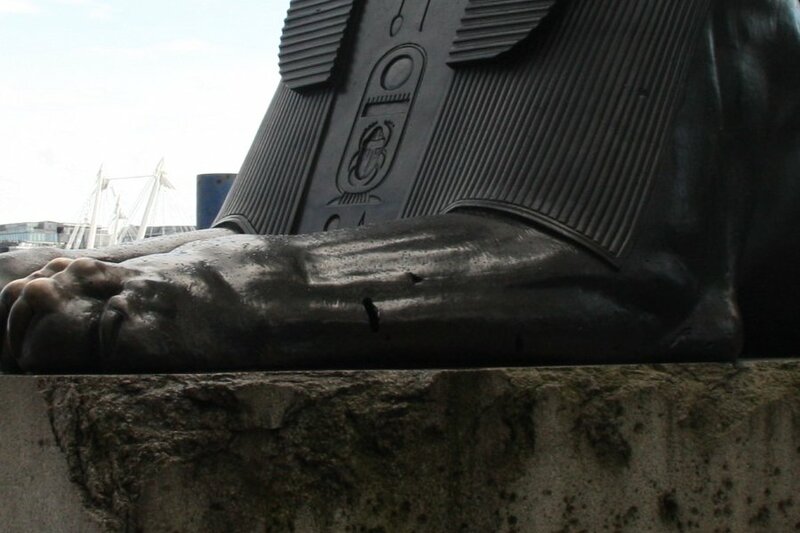 In 1819, Mahommed Ali, viceroy of Egypt, gifted it to Britain. In 1877, the ship transporting it to Britain sank in the Bay of Biscay. The obelisk was recovered in 1878, and erected here. Sphinx created as an ornament facing towards the obelisk (true Egyptian sphynxes face away from the item they are supposed to guard). 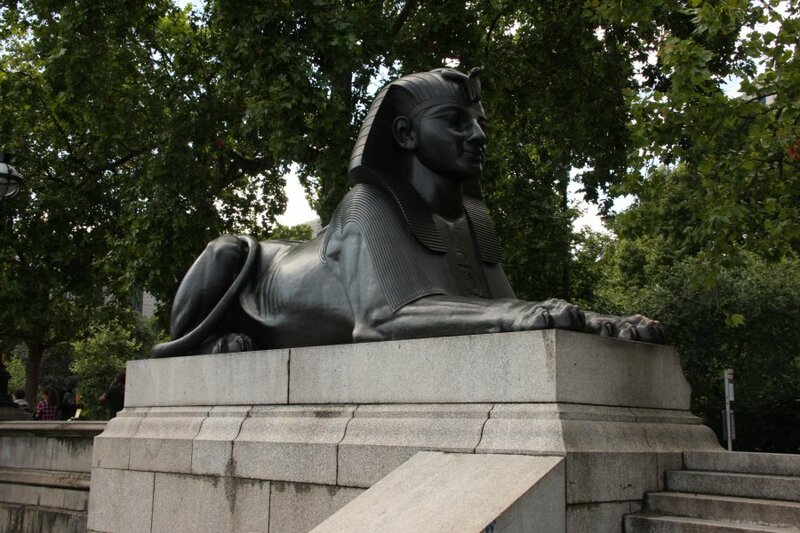 This is the left sphinx (as seen from the road). World War I shrapnel holes, from a German air raid. 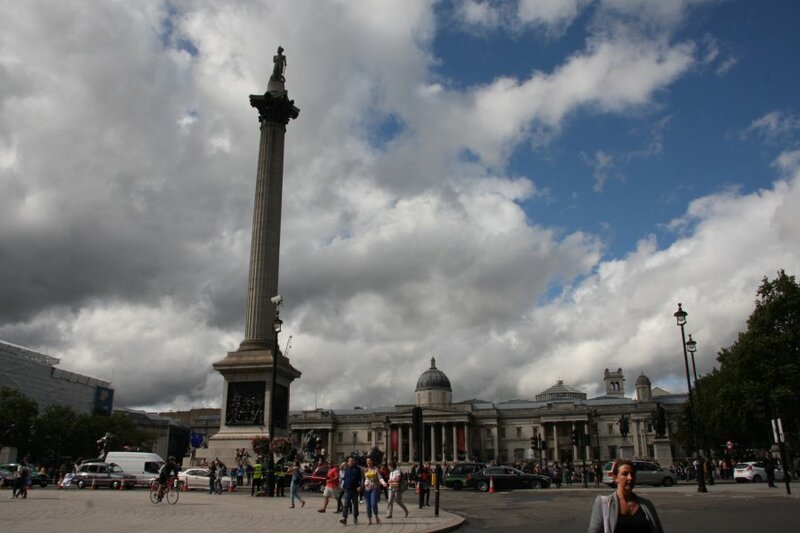 Trafalgar Square, with the 51.6 metre Nelson's Column, and the National Gallery behind it. 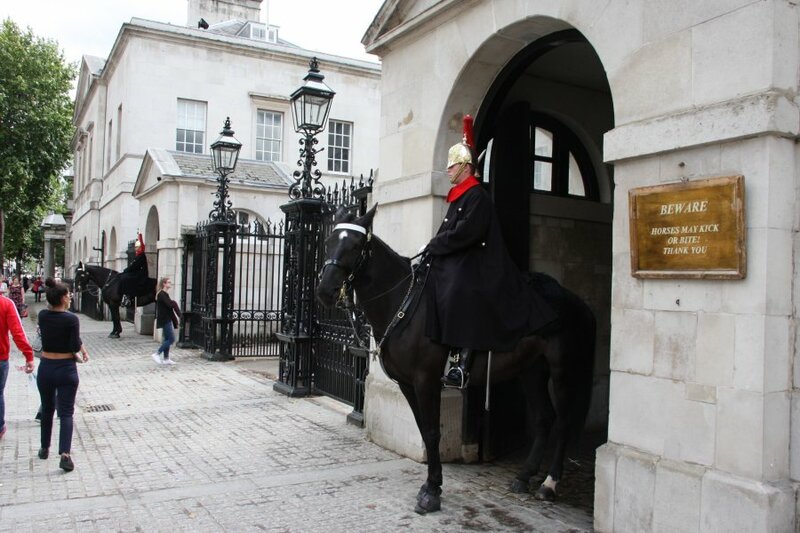 Horse Guards, the entrance to St. James's Park, complete with its horse guards. No. 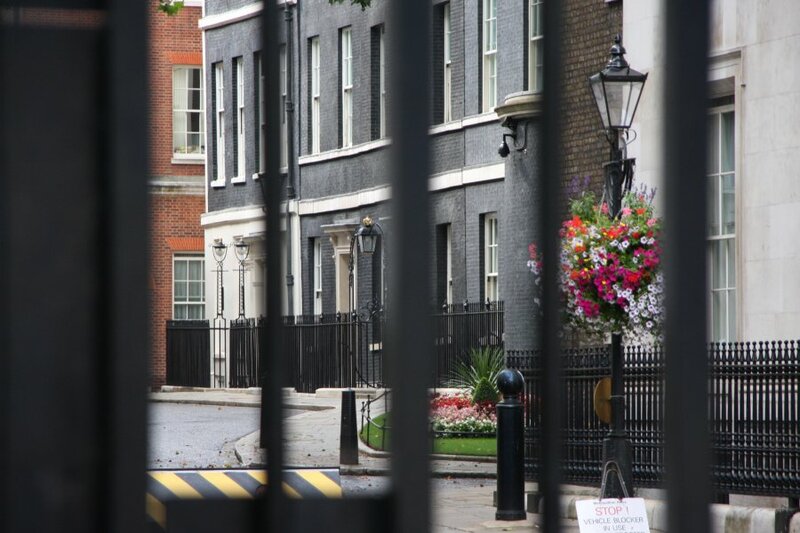 10 Downing Street, home of the British prime minister. Compare it to the American White House. 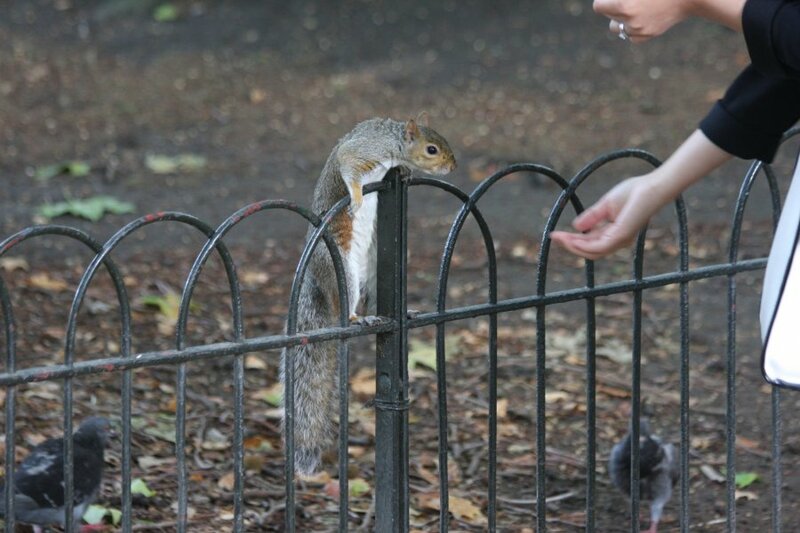 Squirrels in St. James's Park are not afraid of humans, and will readily take treats from people. 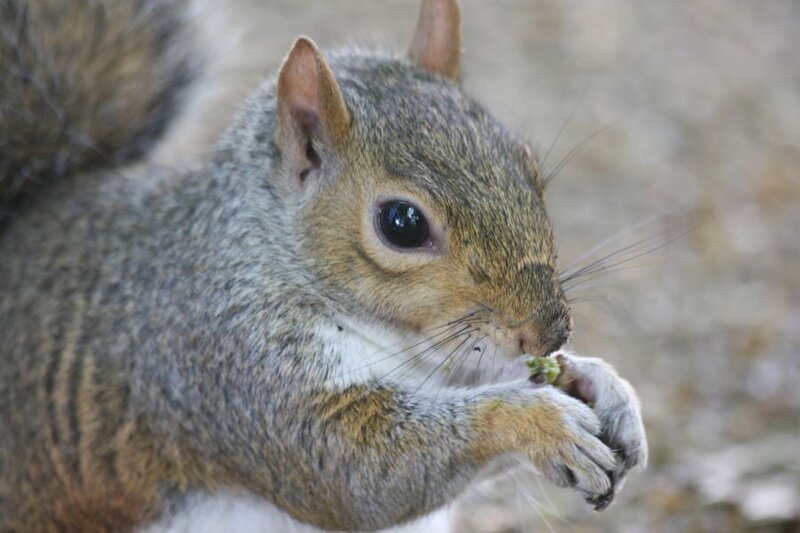 These are the invasive American grey squirrels (or should that be "gray" squirrels? ), rather than the native red squirrels. 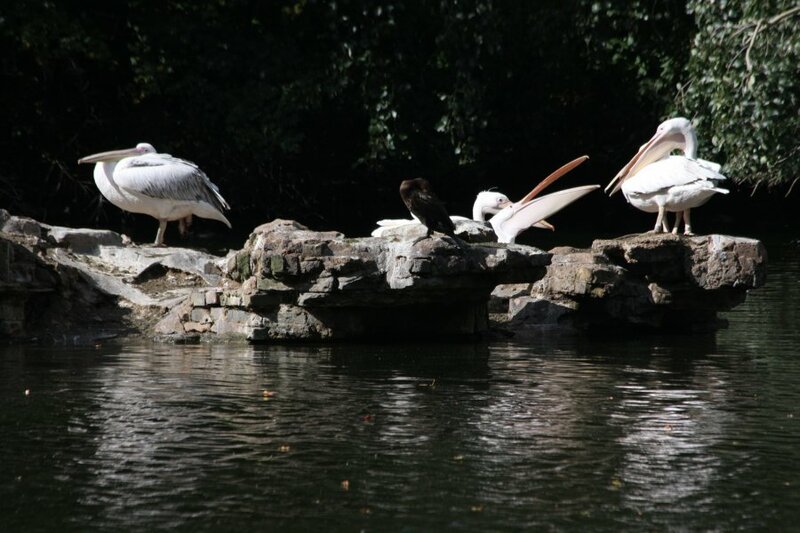 St. James's Park Lake is home to several pelicans. These were originally given as a gift from a Russian ambassador in 1664, and chose to stay. Since then, the colony has been maintained, with the pelicans still chosing to remain. 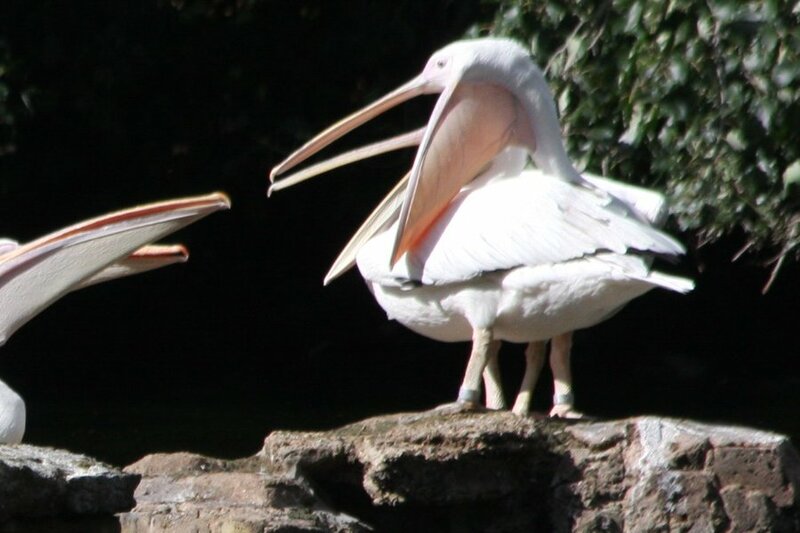 The giant throat pouch that the pelicans use to scoop up fish. So thin you can see the blood vessels. 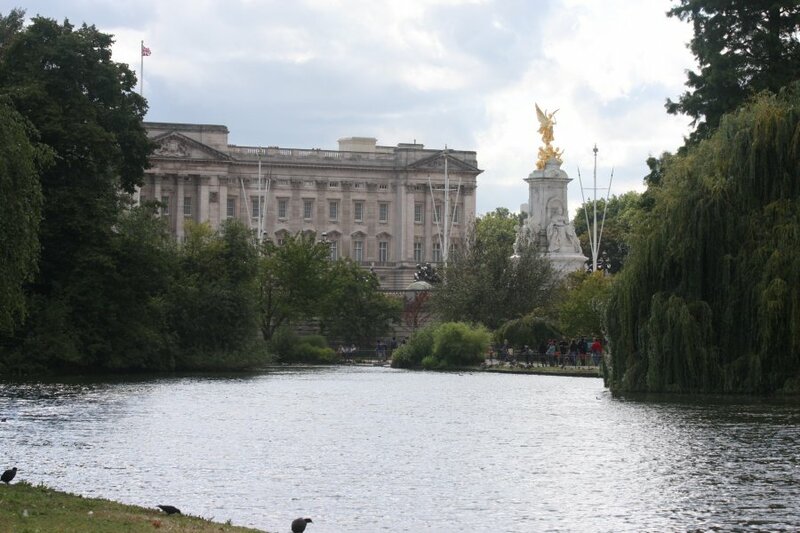 Buckingham Palace seen over St. James's Park Lake, the best way to see it. Big but rather plain. 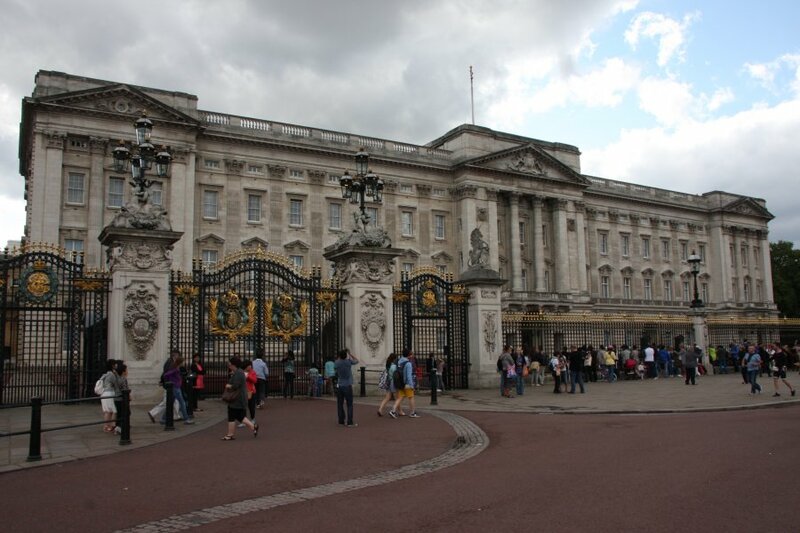 Buckingham Palace's most elaborate and impressive feature is its fence. 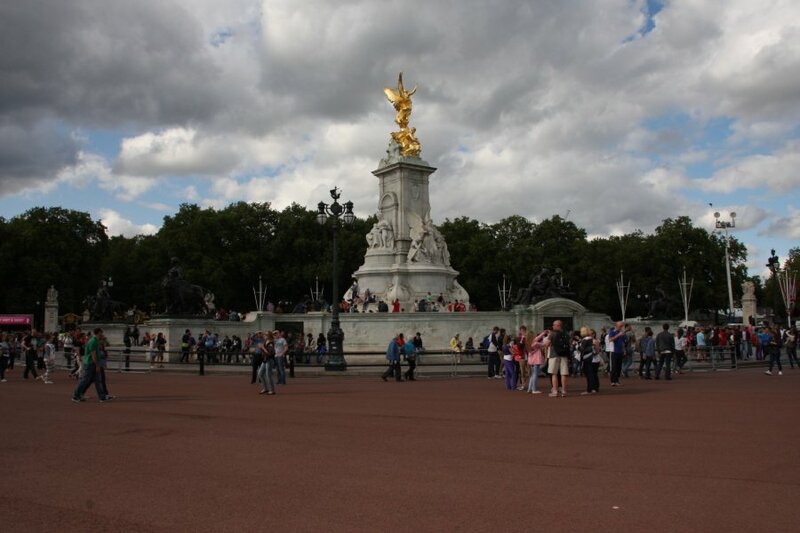 Victoria Memorial, a memorial to the late Queen Victoria, the second longest serving British monarch. The memorial itself is a little over 100 years old and is a magnet for the tourists who come to take their pictures here. Like me. 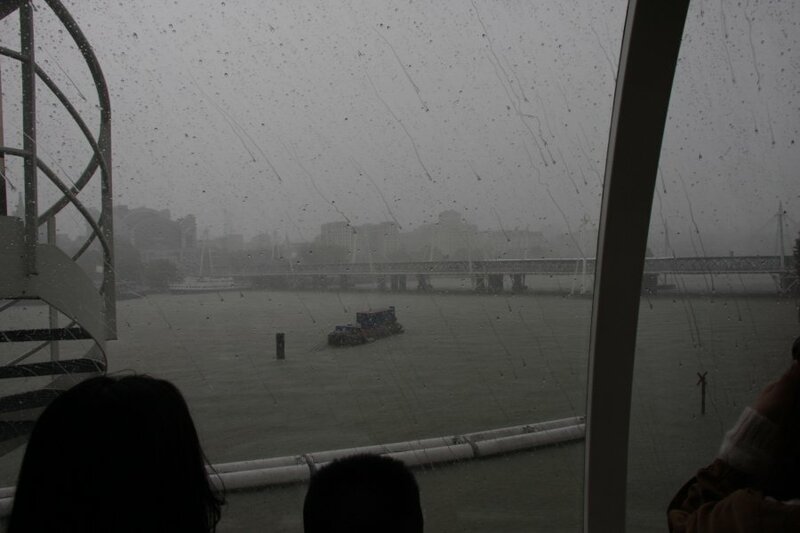 A fitting end to a tourist visit to the capital.